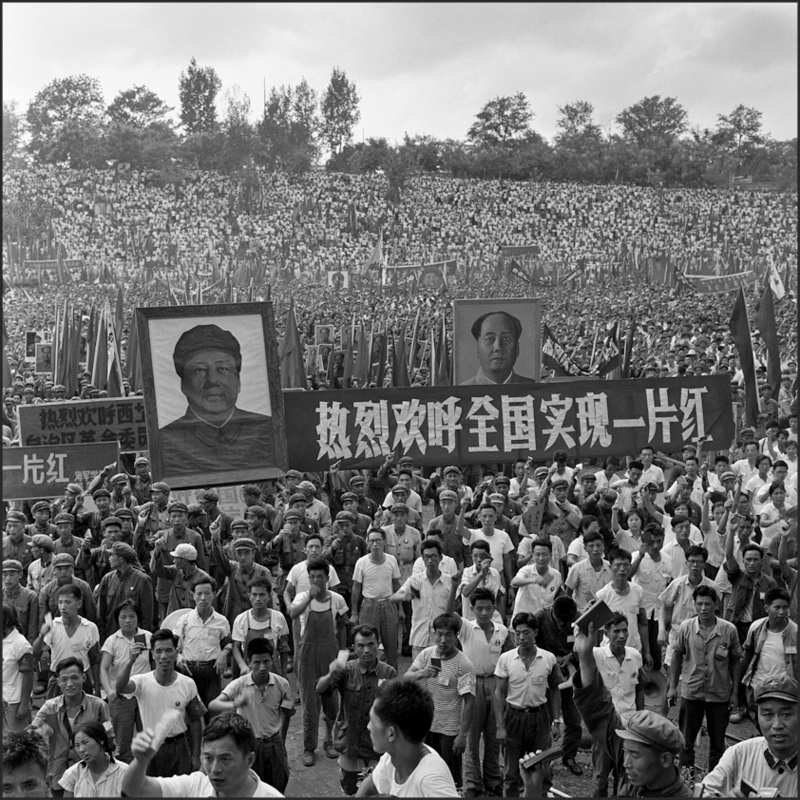 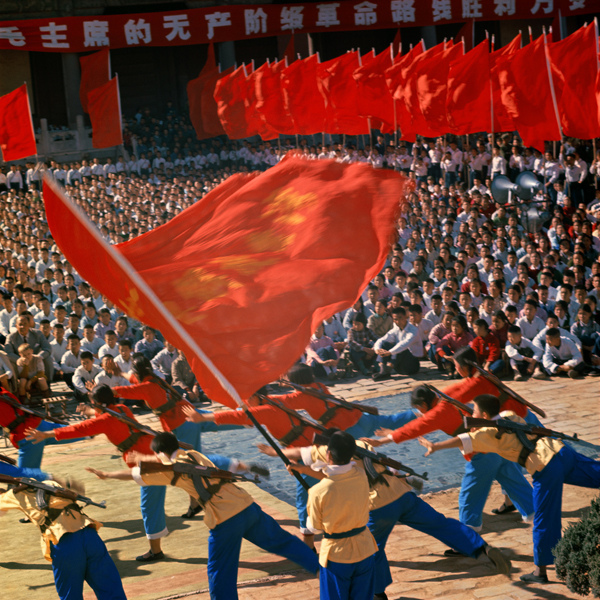 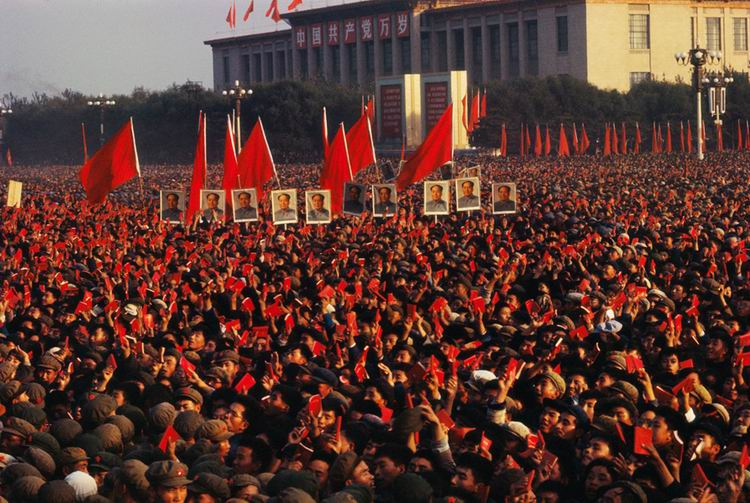 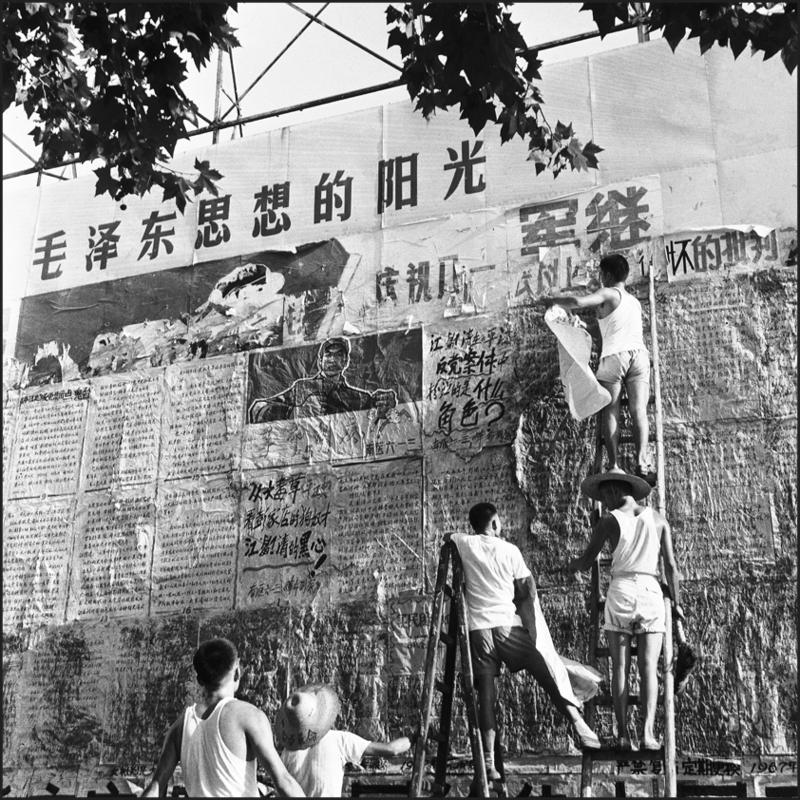 Since long we would have liked to write about the Opletal exhibition, the hitherto largest European exhibition on the Chinese Cultural Revolution (1966-76) which ended in Vienna in last November, and this post is partly an introduction to it. 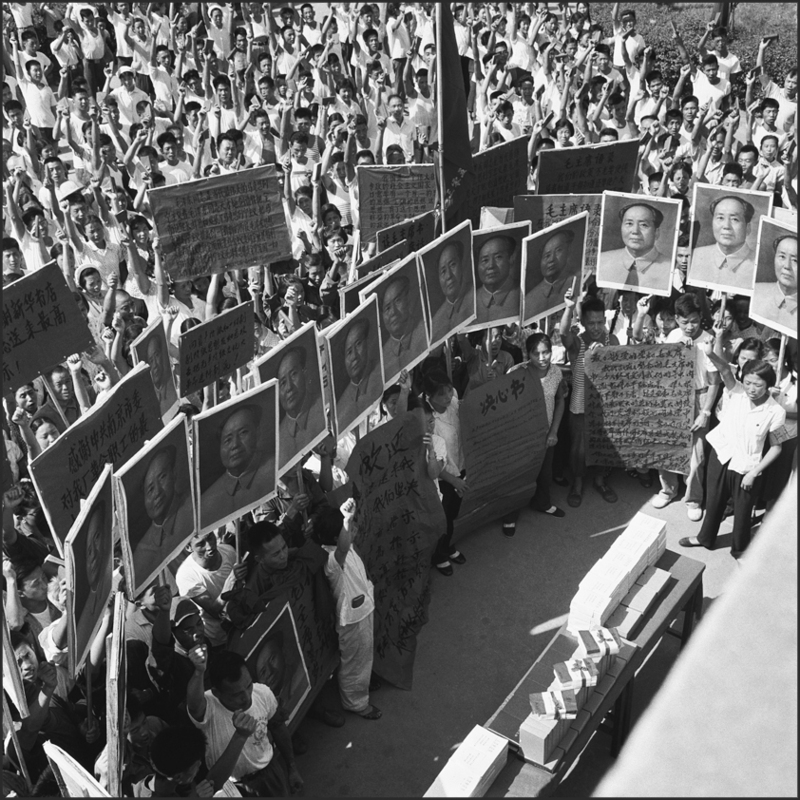 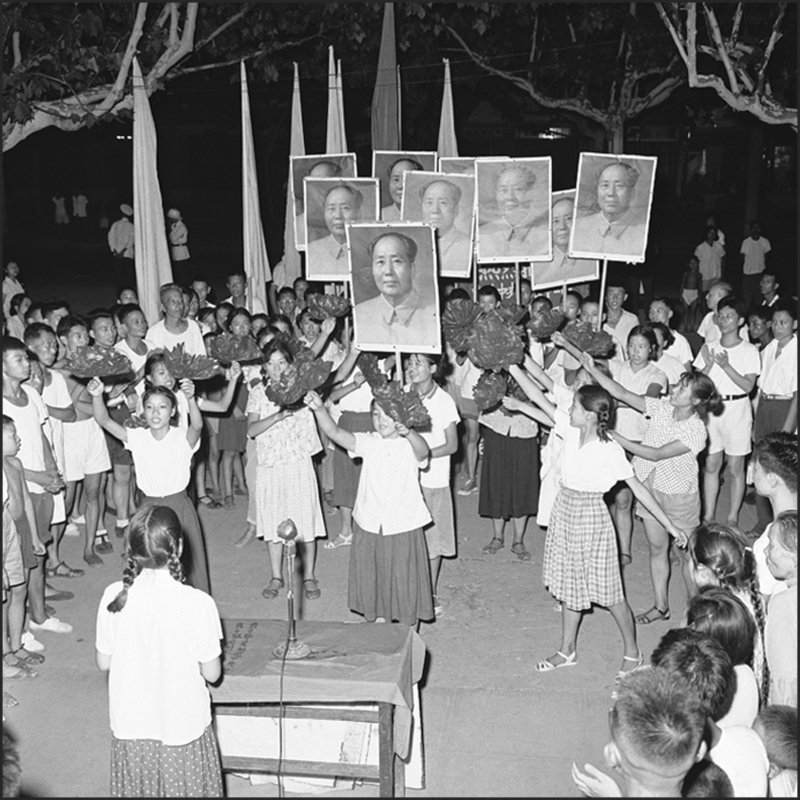 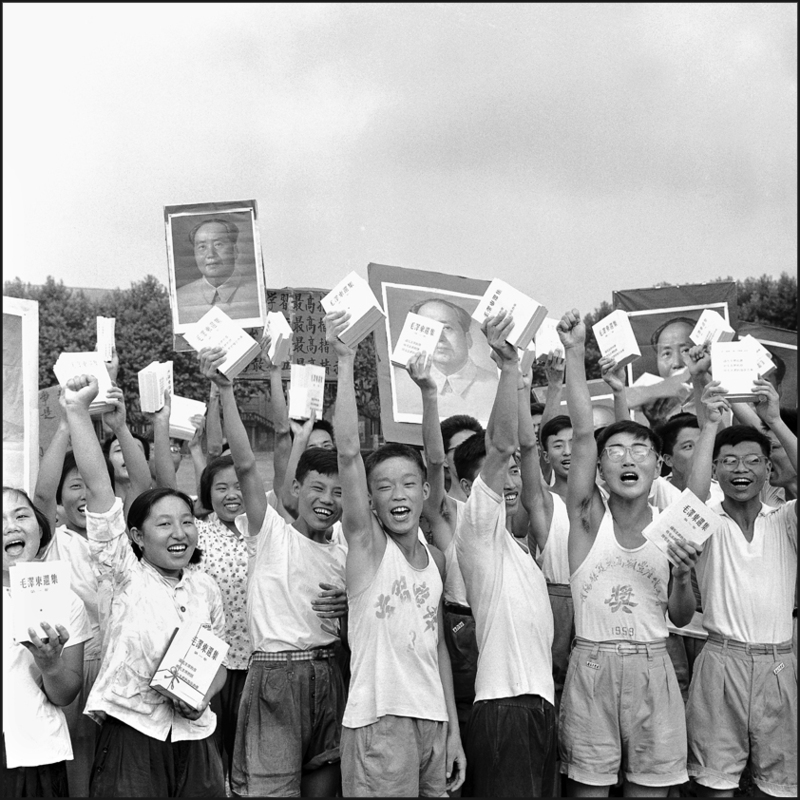 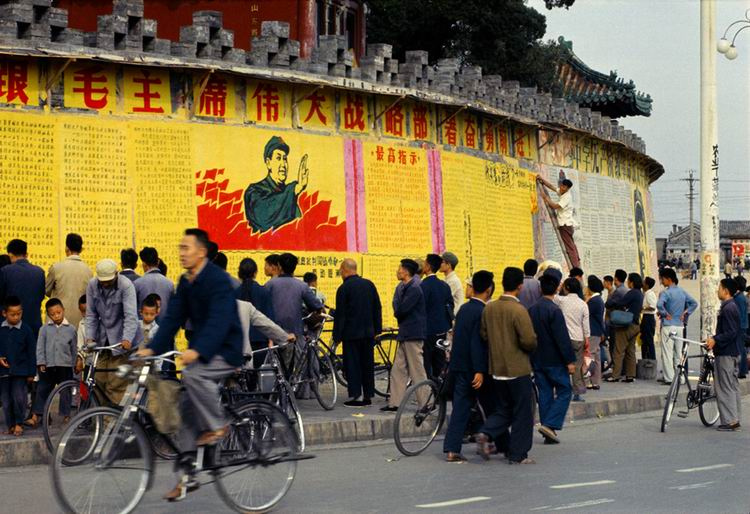 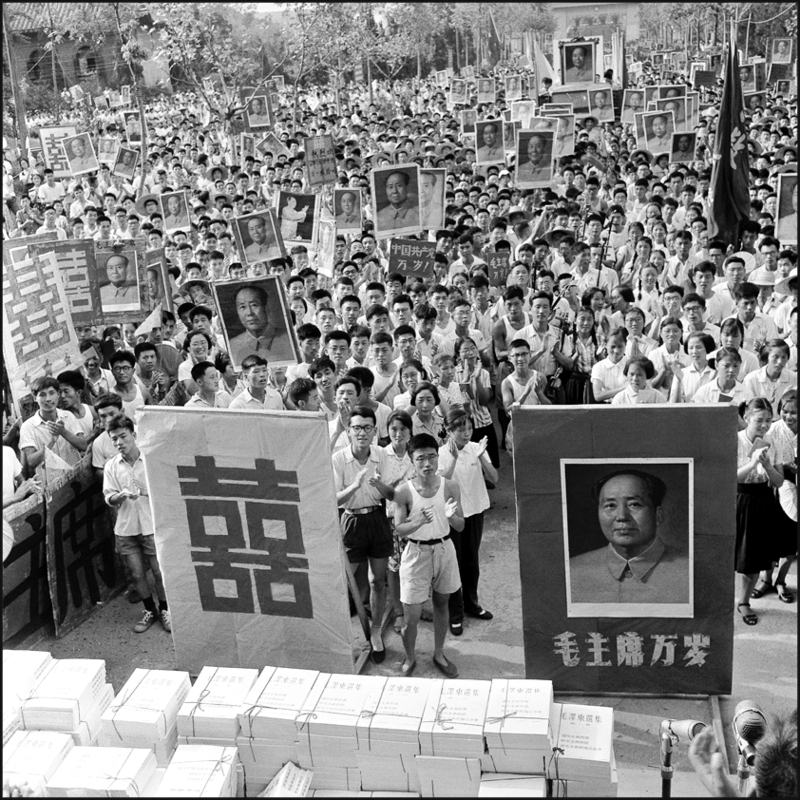 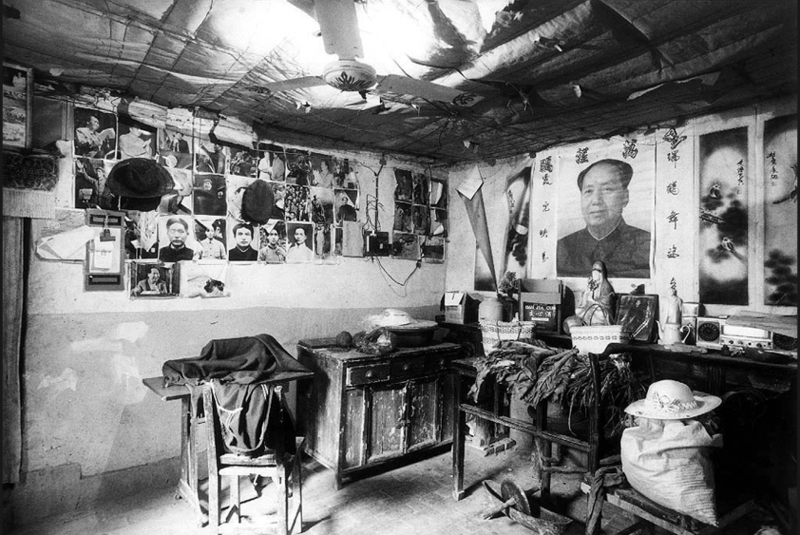 The exhibition mainly focused on the relics of the Cultural Revolution, and pushed into the background the photos. 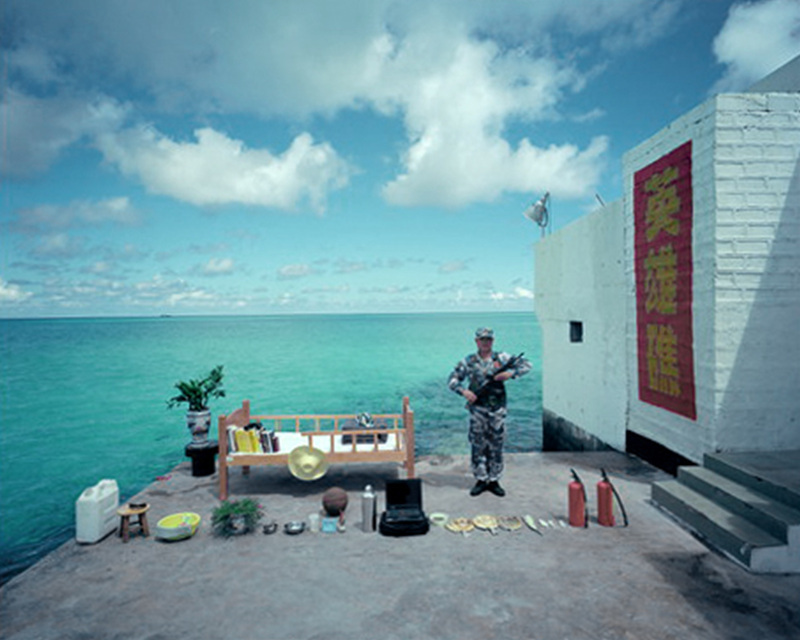 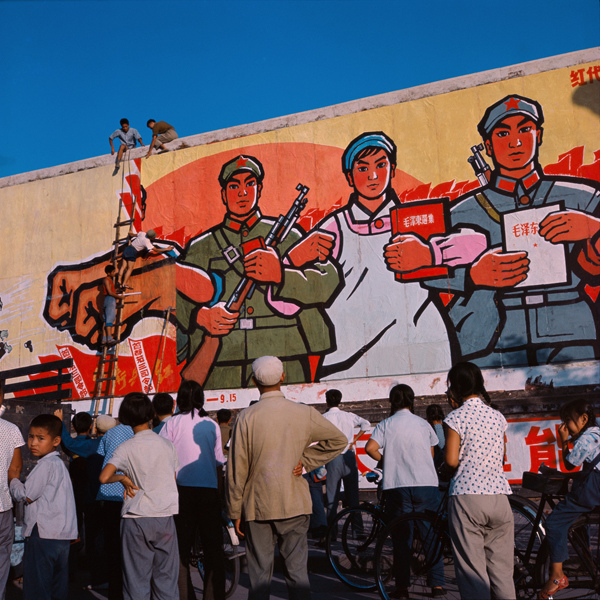 So now we would like to present three series of photos connected with the Revolution, taken by three recognized Chinese artists. All three were exposed in the 百年印象 Băinián Yìnxiàng, “A Hundred Years of Impressions” photo gallery of Beijin in recent years. 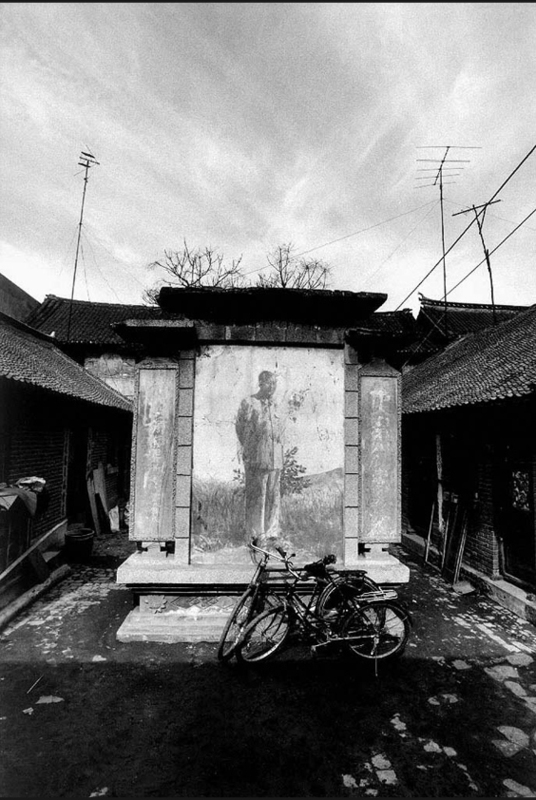 翁乃强 Wēng Năiqiáng (1936) was born in Indonesia, and arrived at China after the Communist takeover at the age of 15. 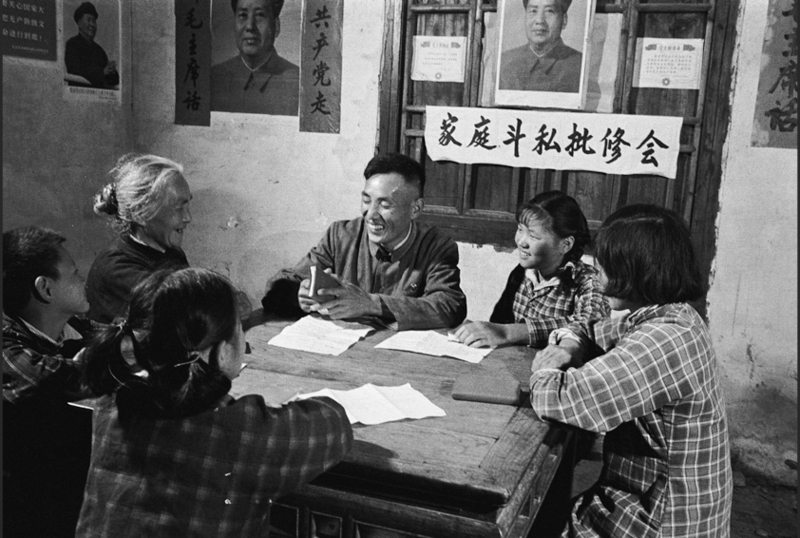 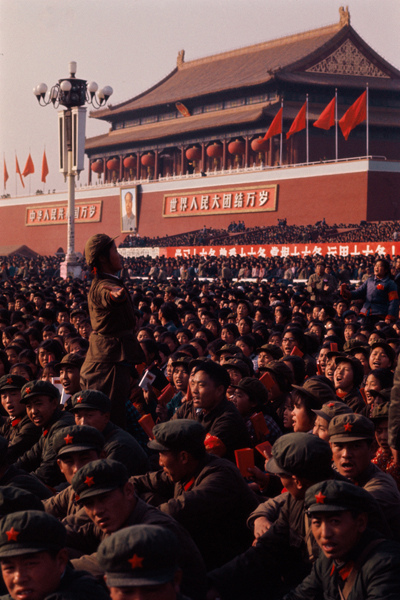 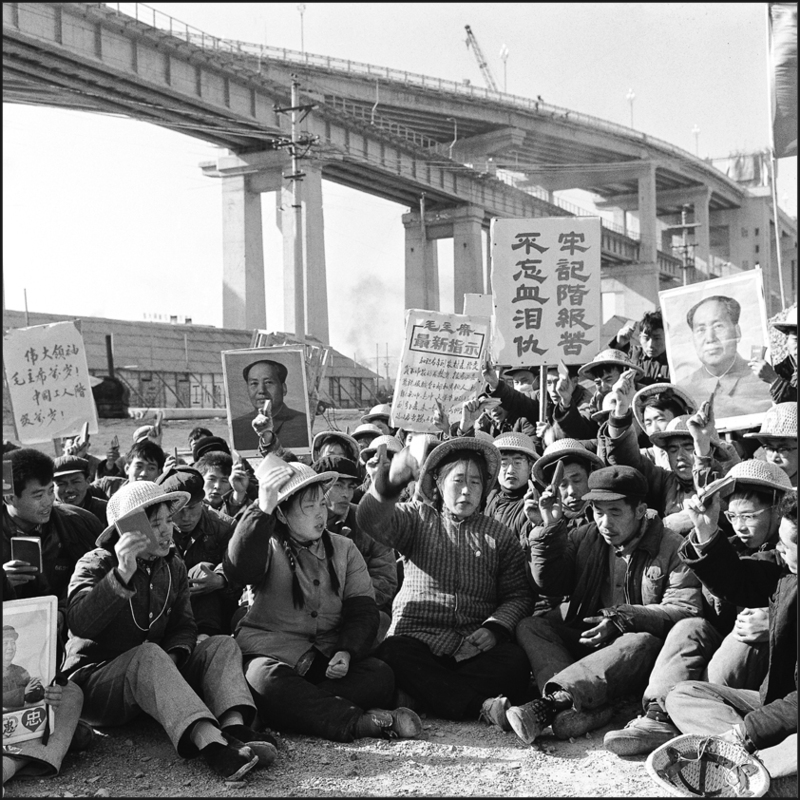 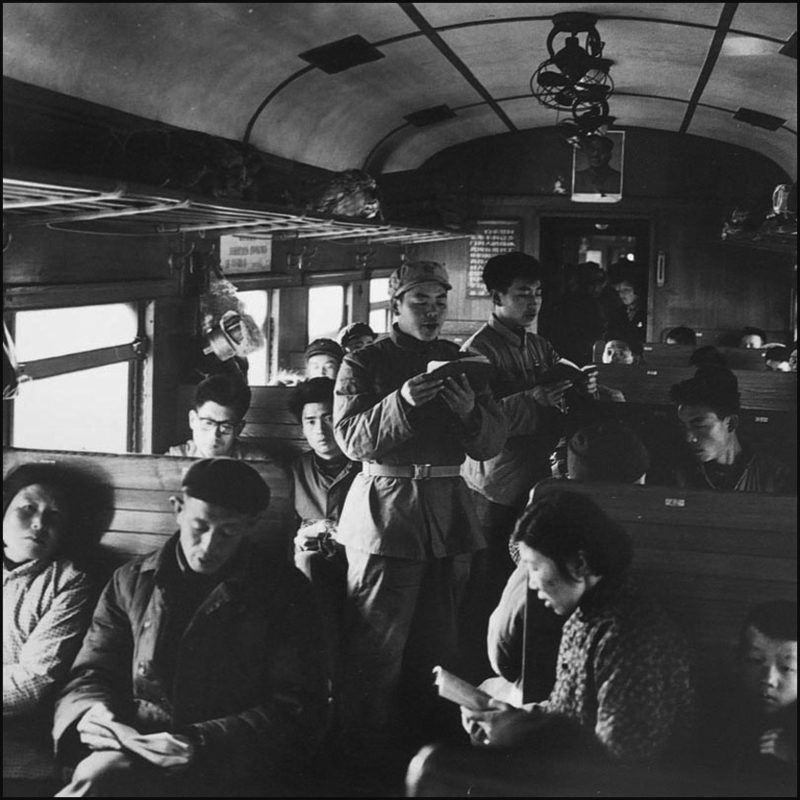 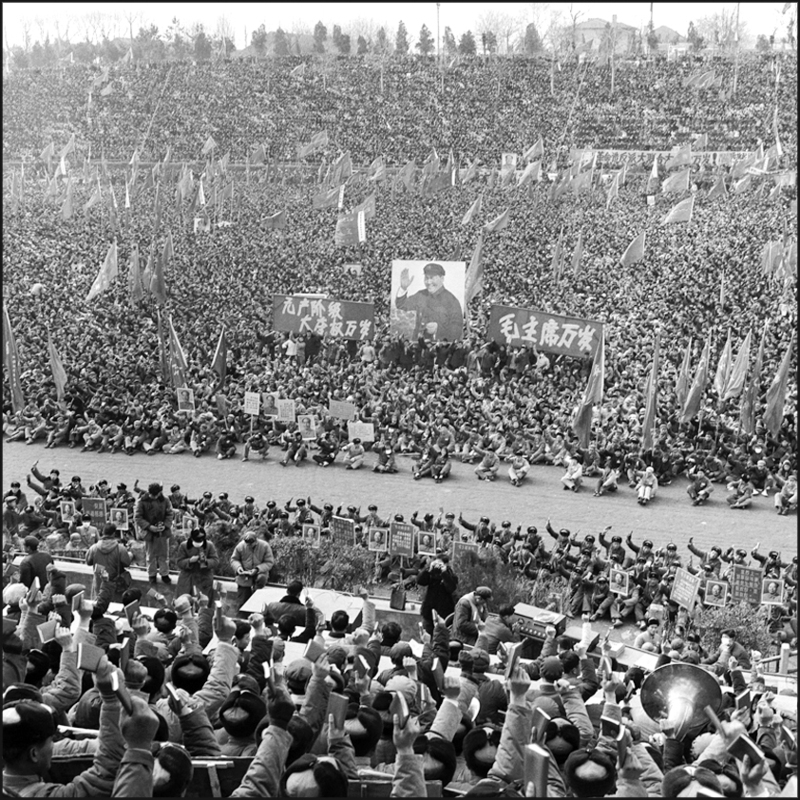 He graduated in painting and photography at the Beijing Academy of Fine Arts, and during all the Cultural Revolution he worked as a photo journalist. 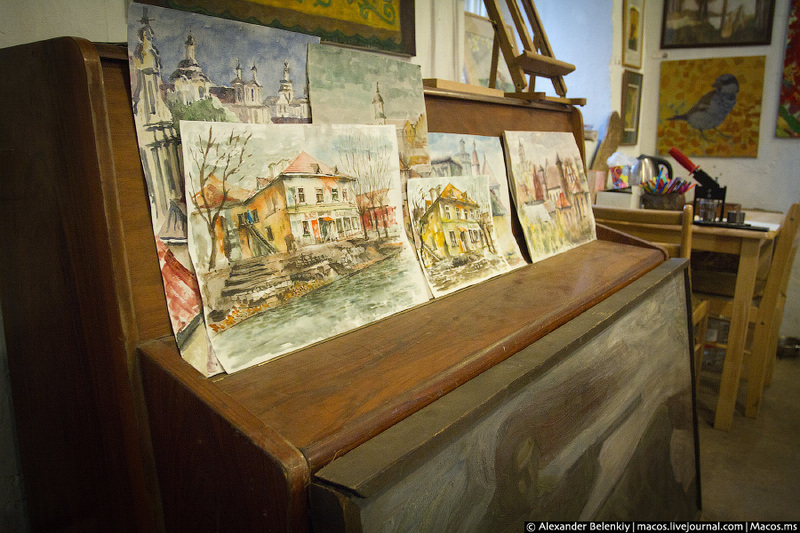 Since 1993 he teaches at the Academy of Fine Arts. 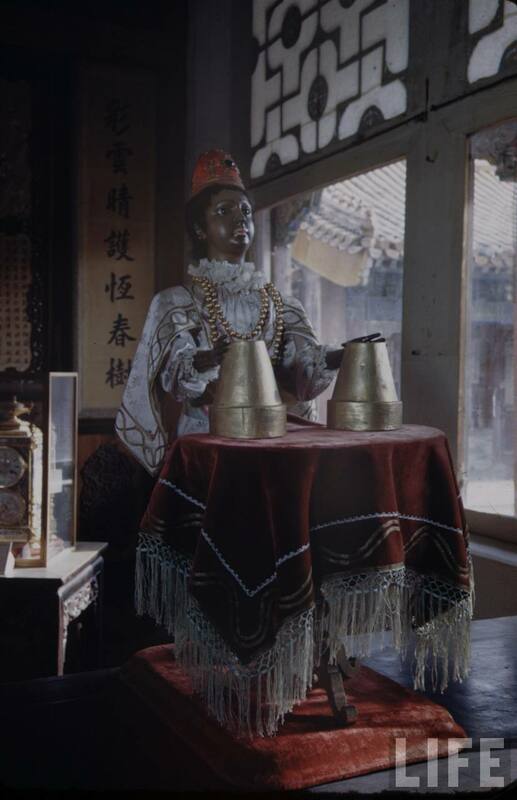 His color (!) 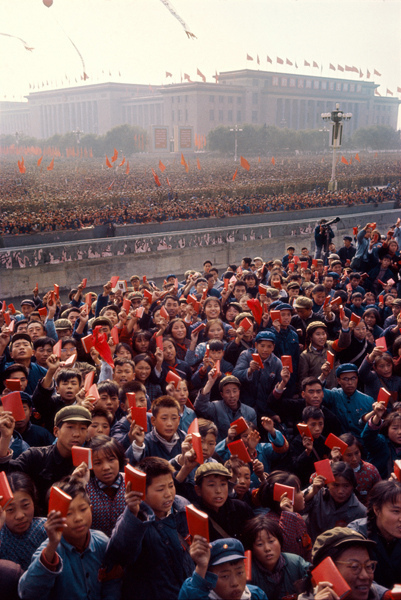 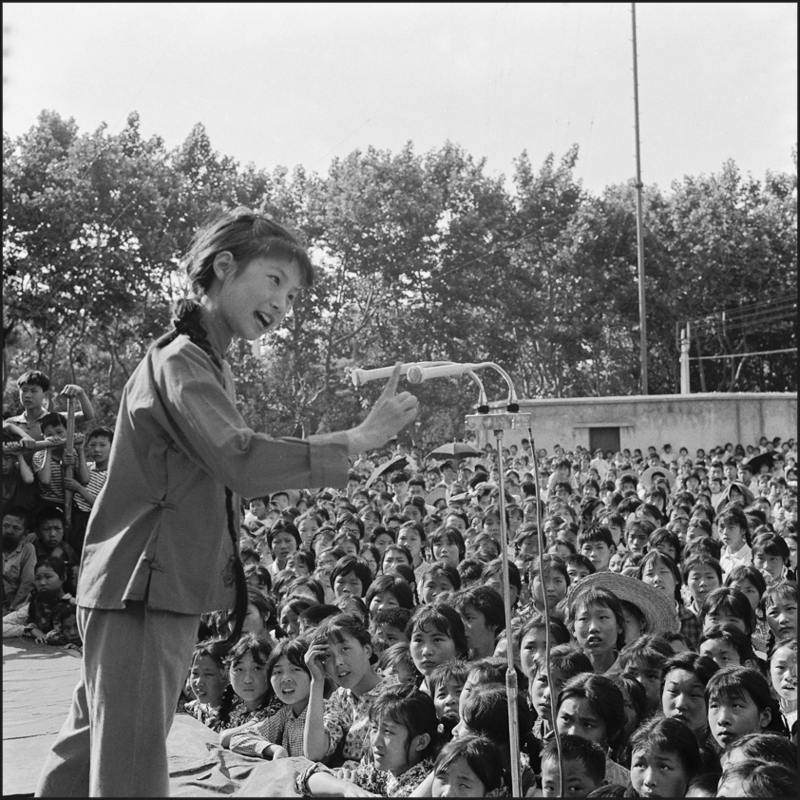 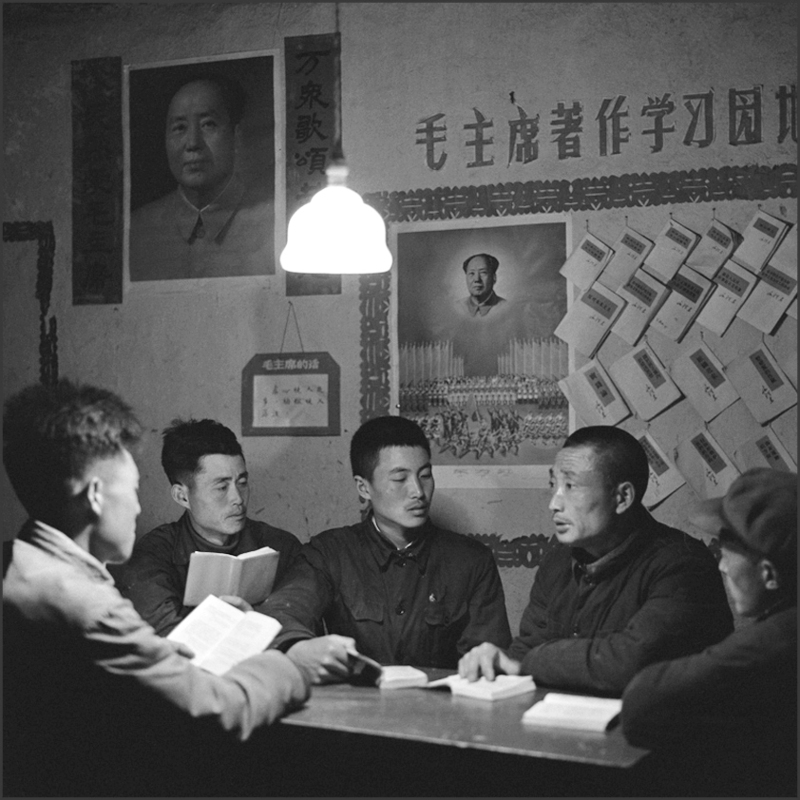 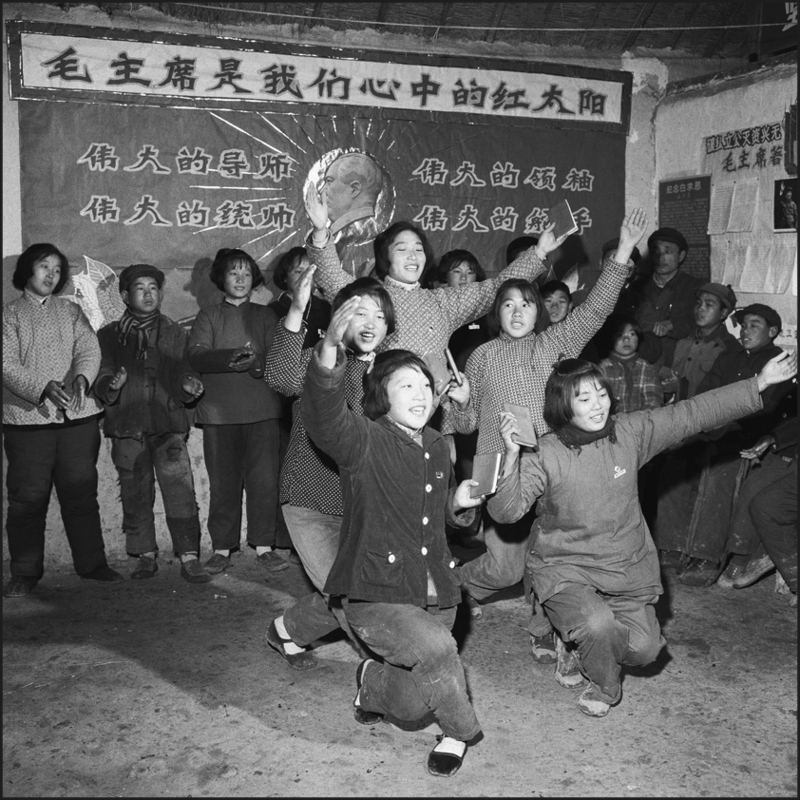 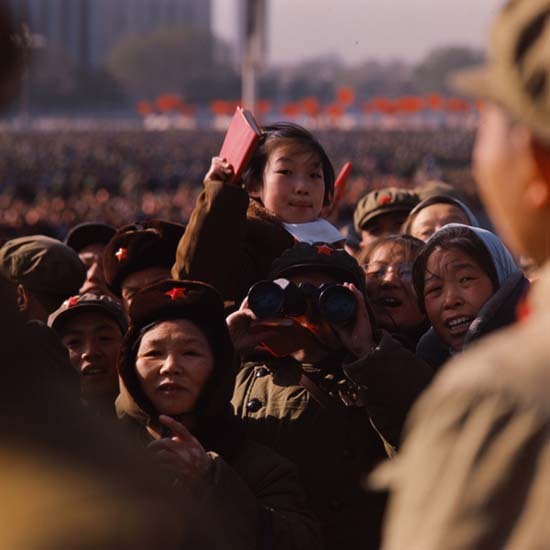 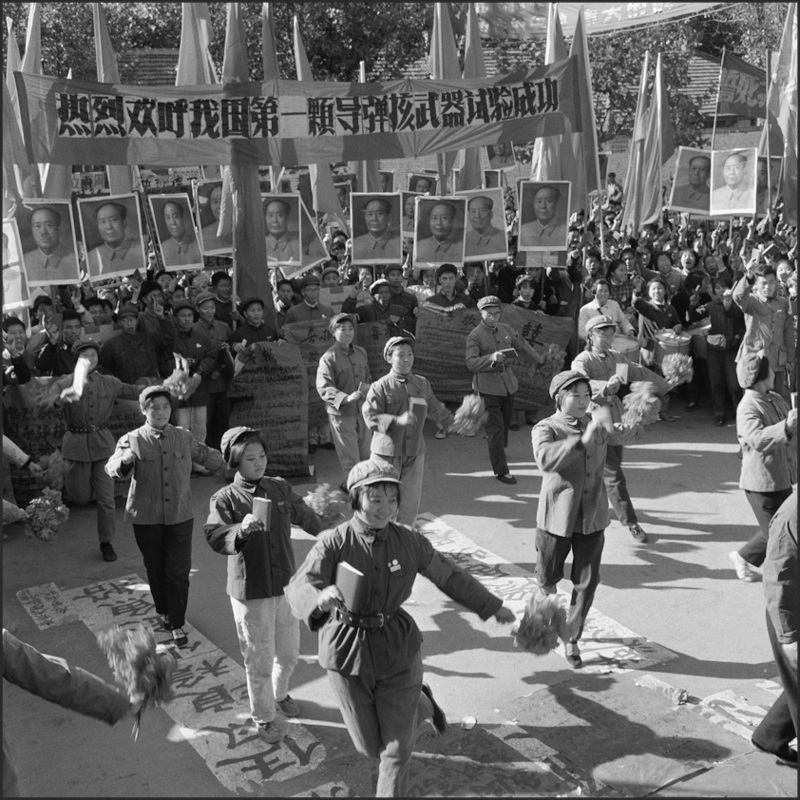 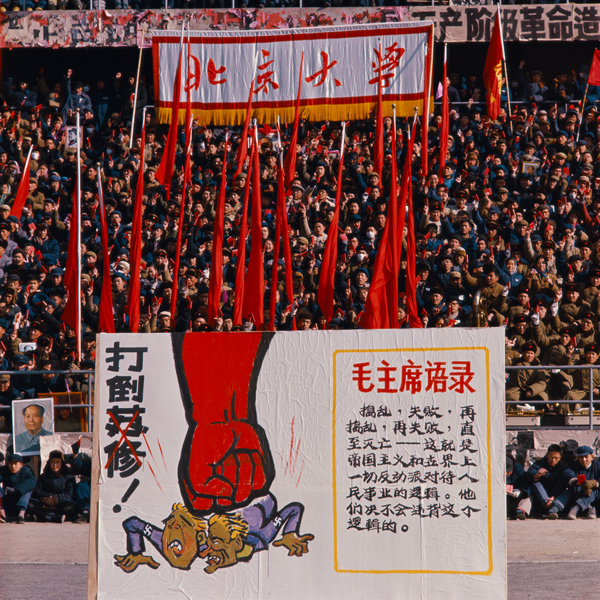 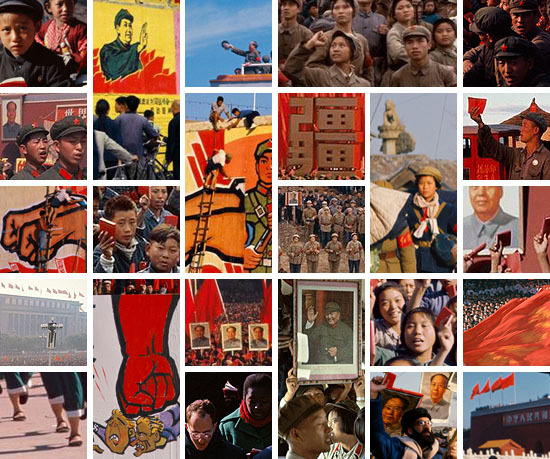 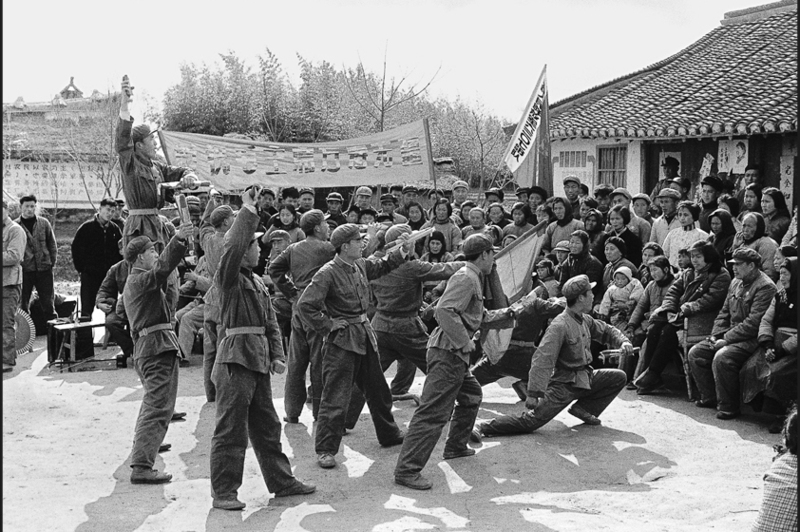 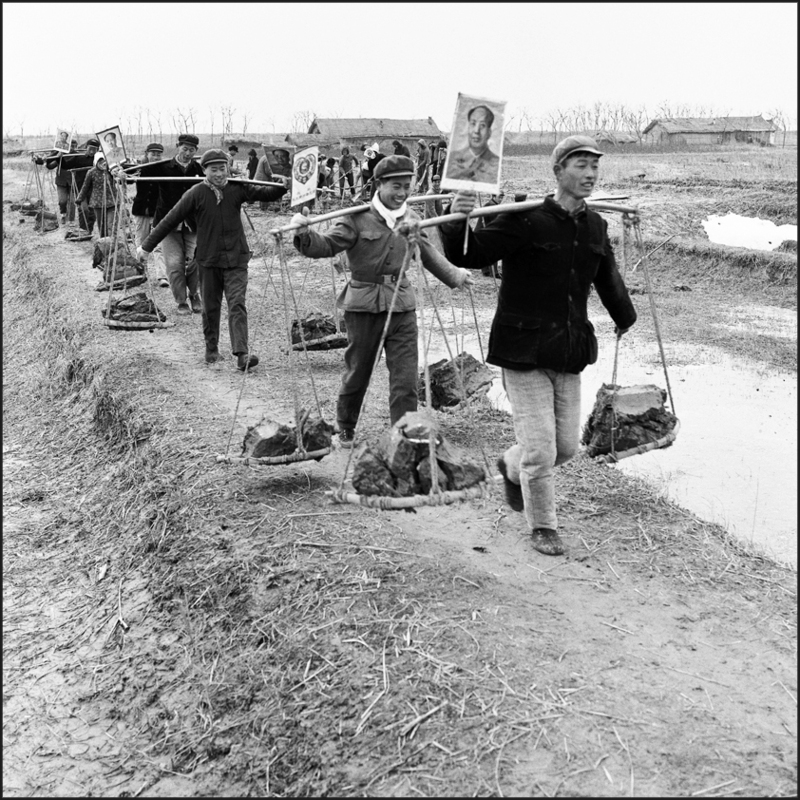 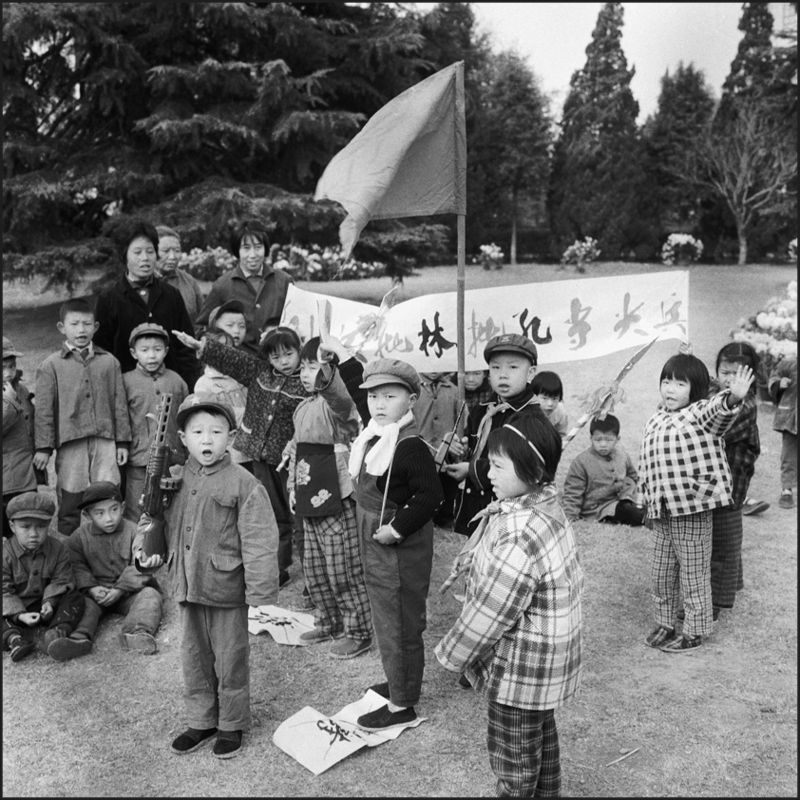 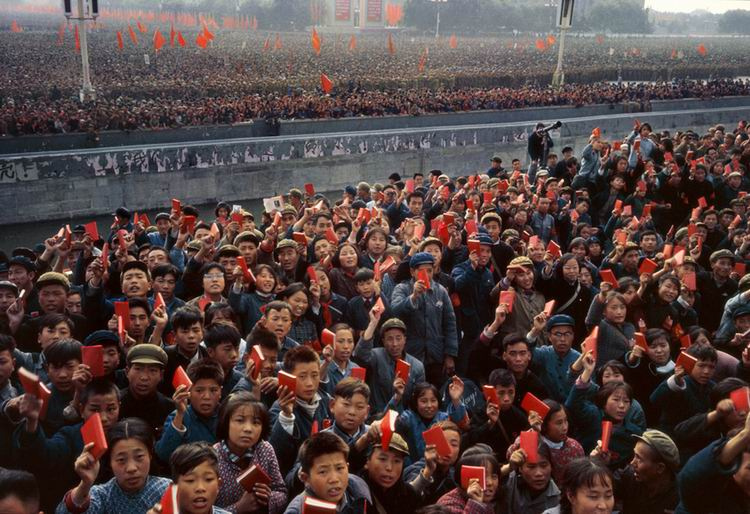 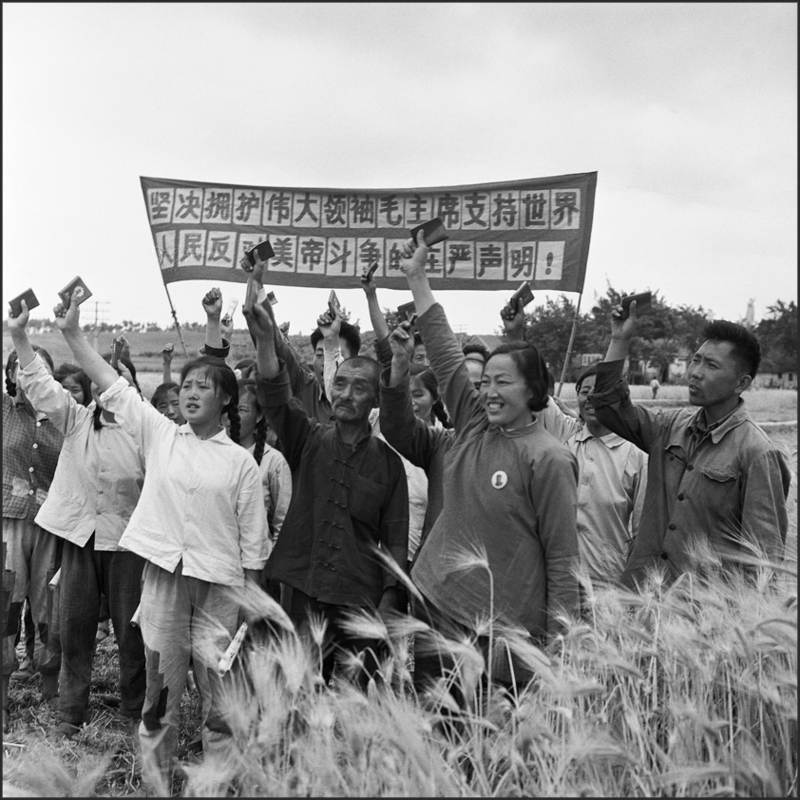 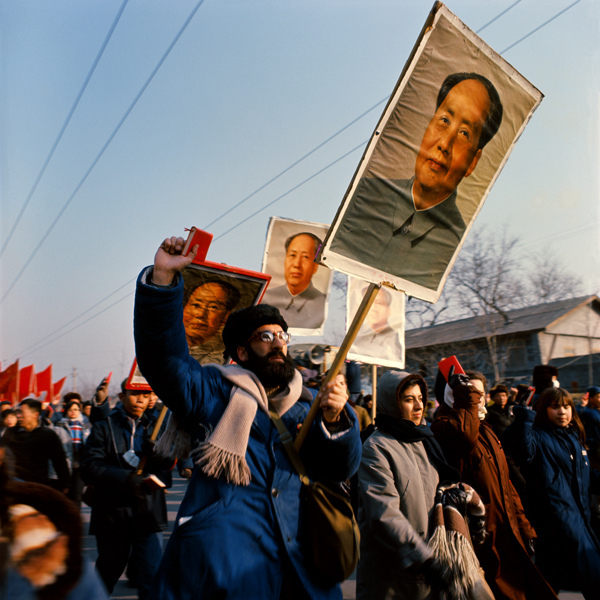 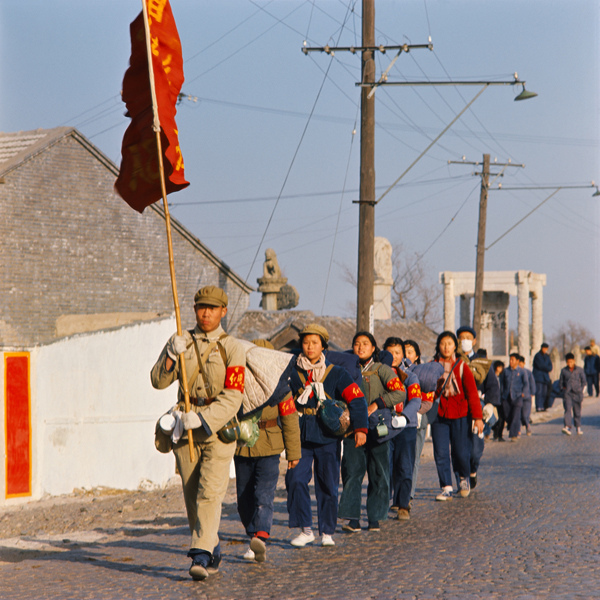 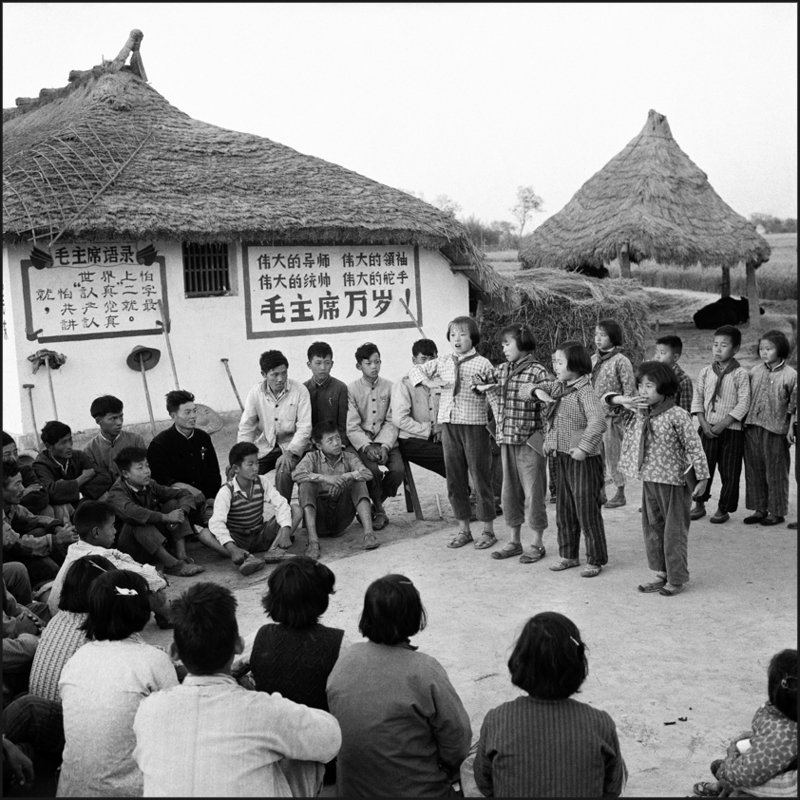 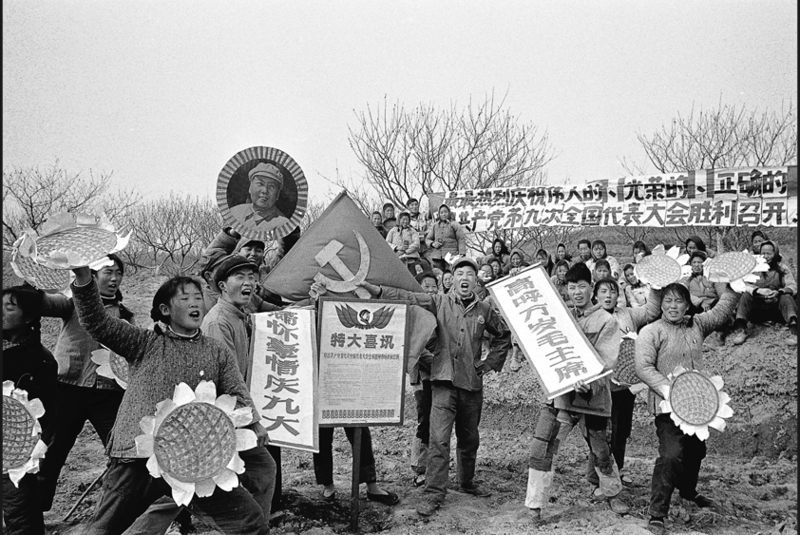 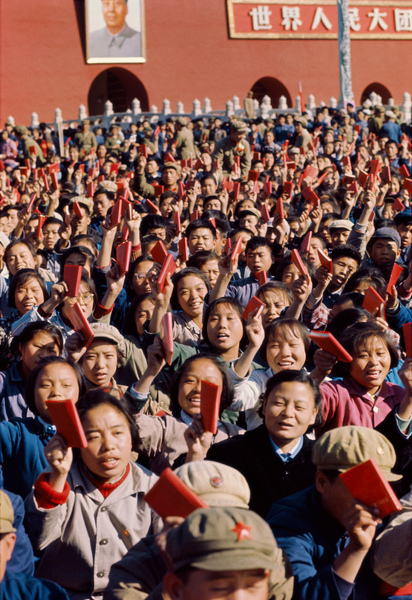 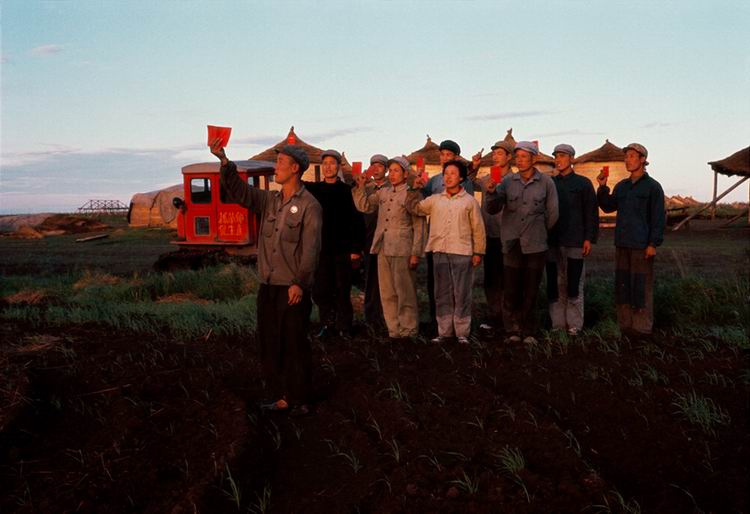 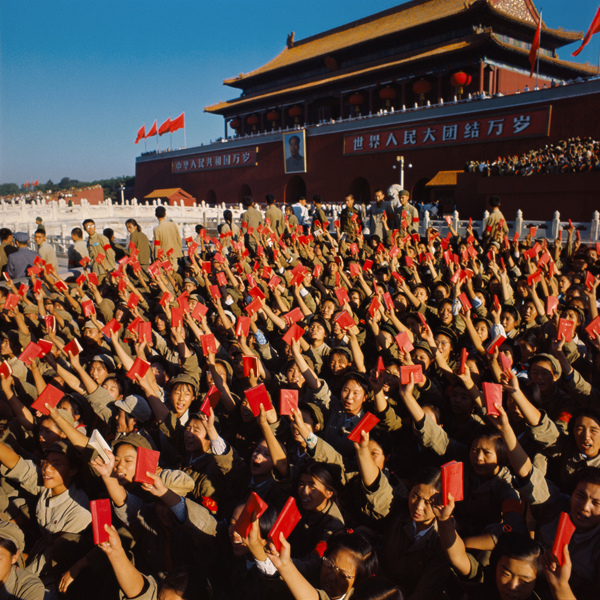 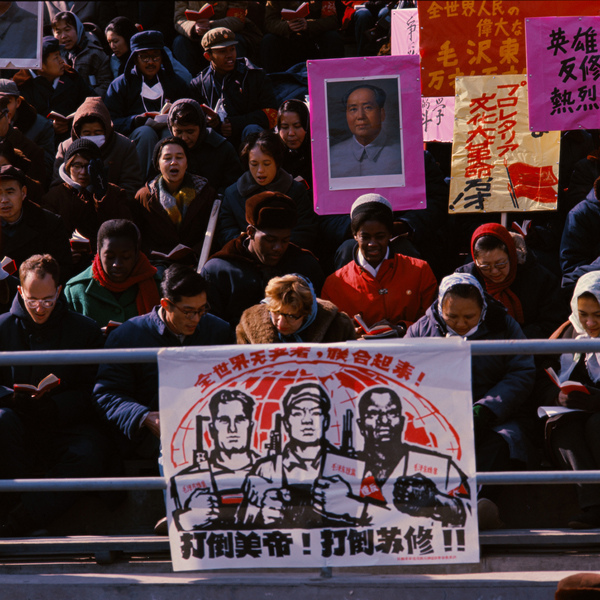 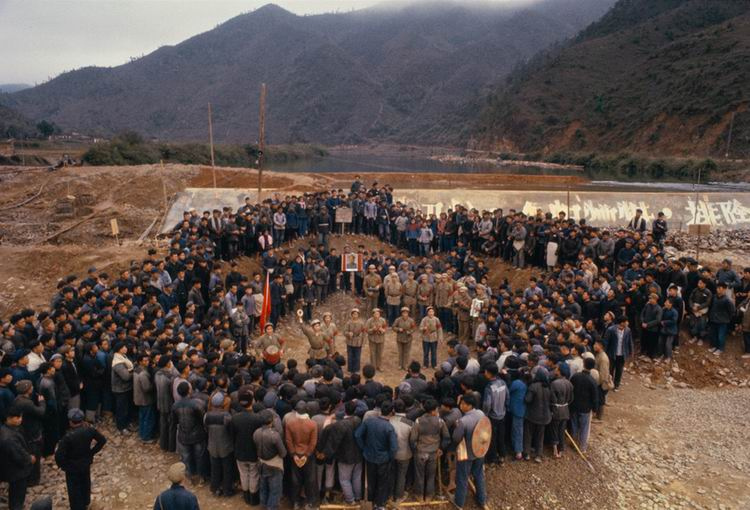 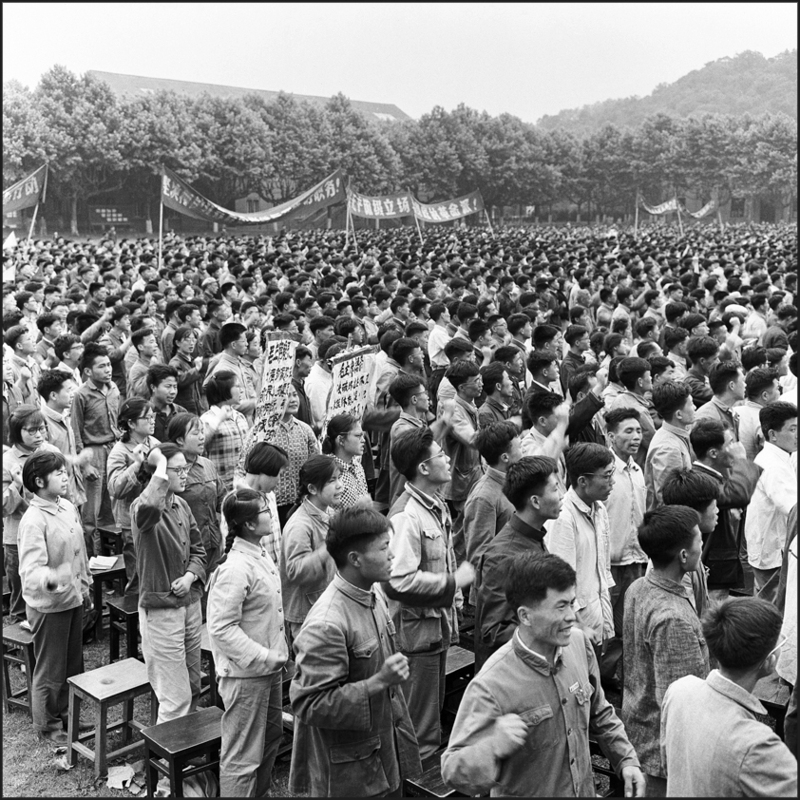 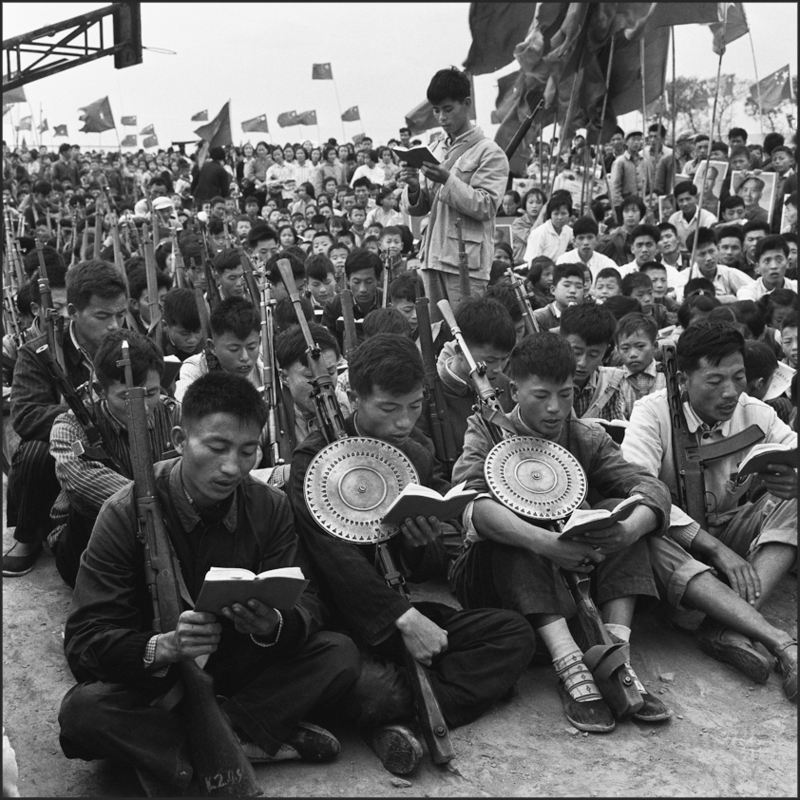 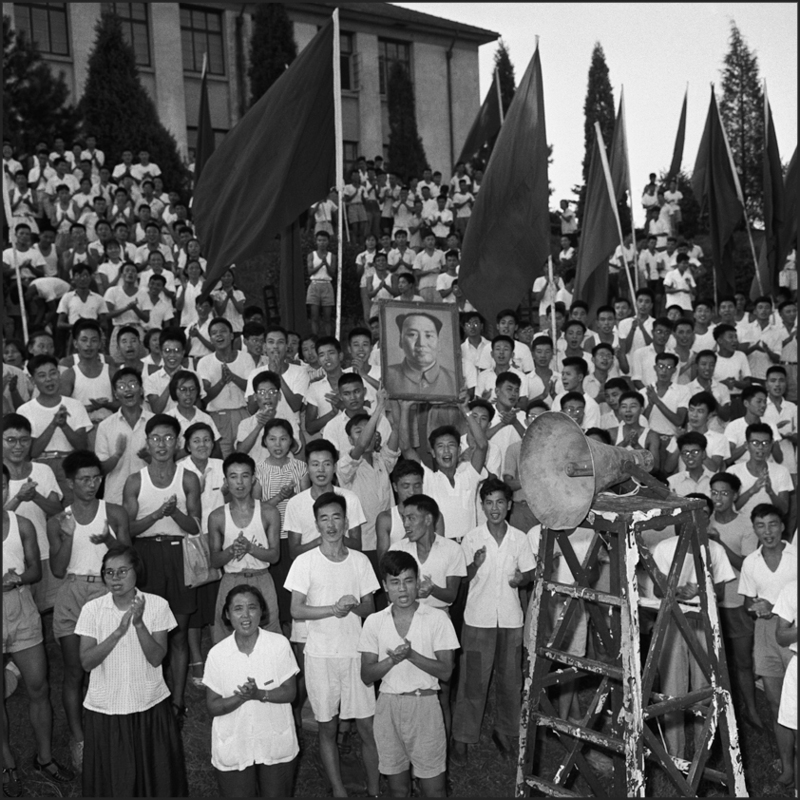 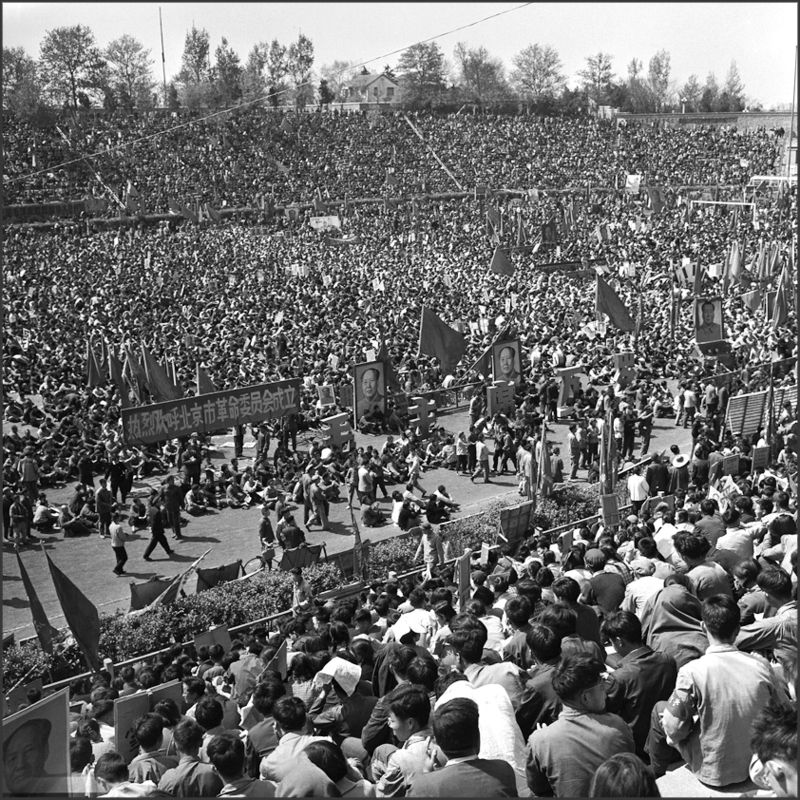 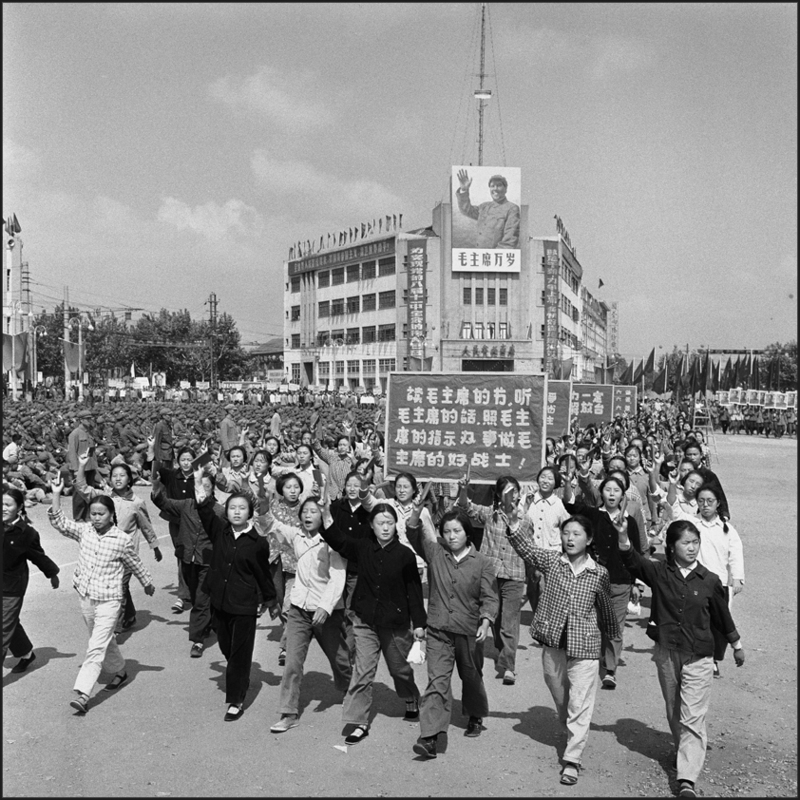 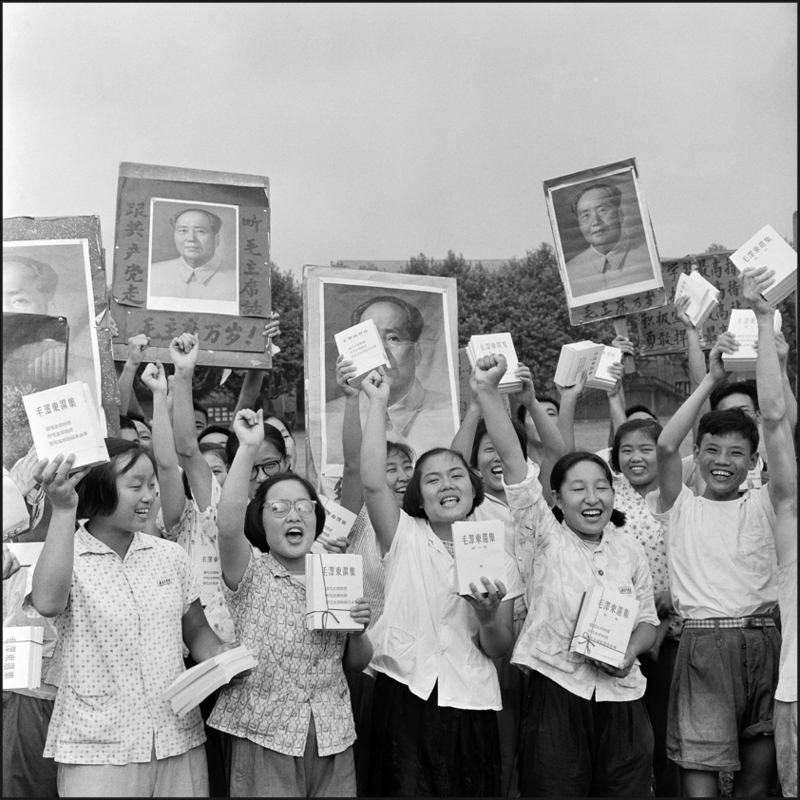 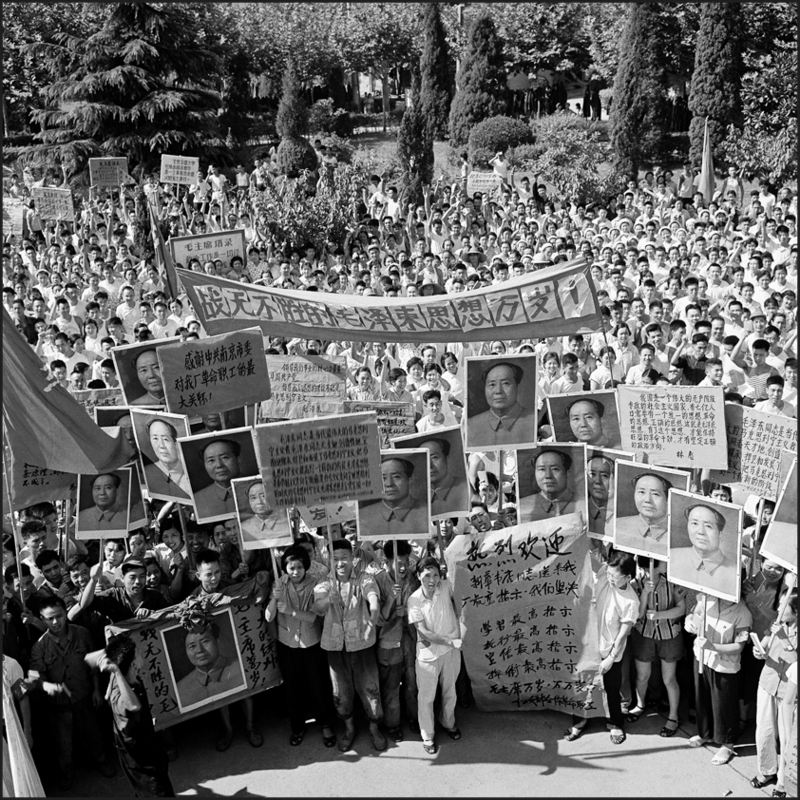 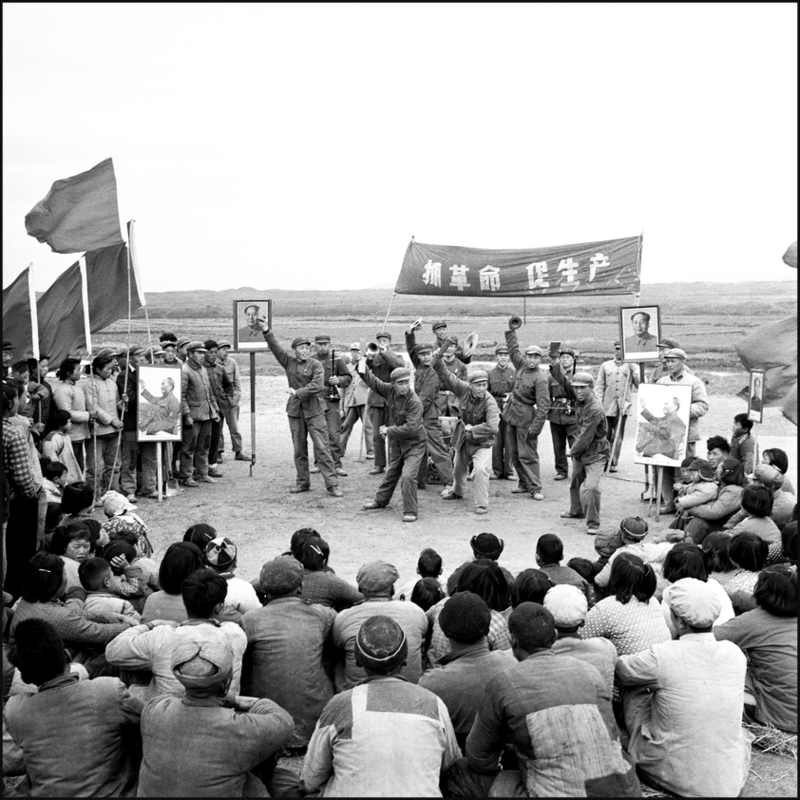 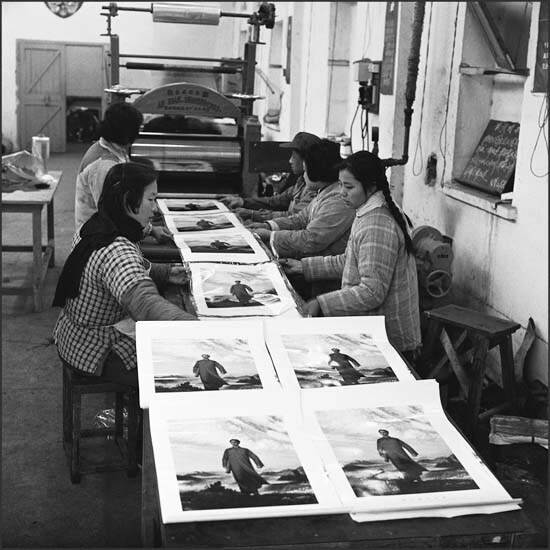 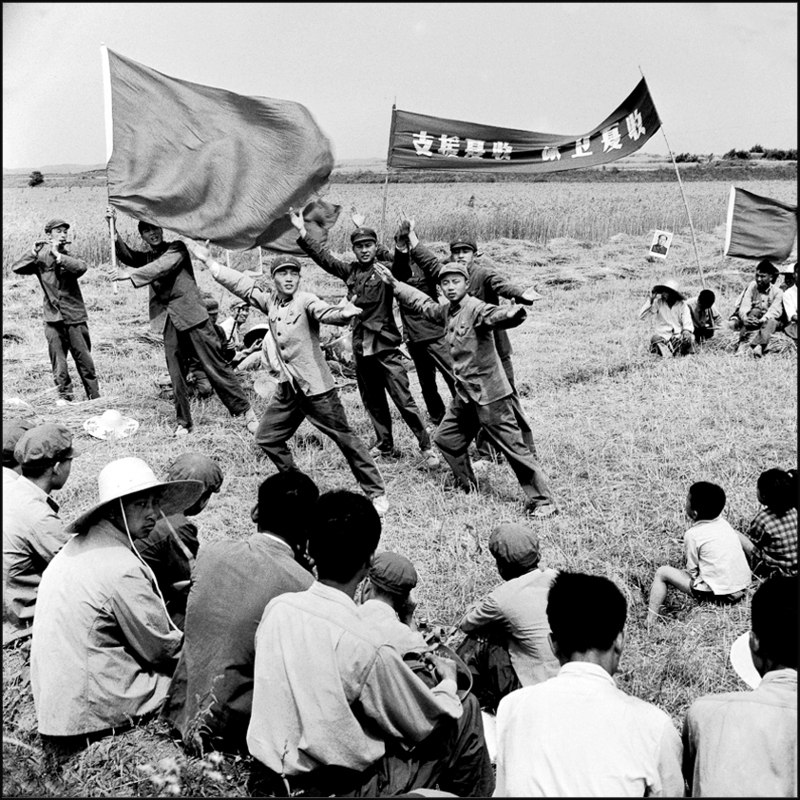 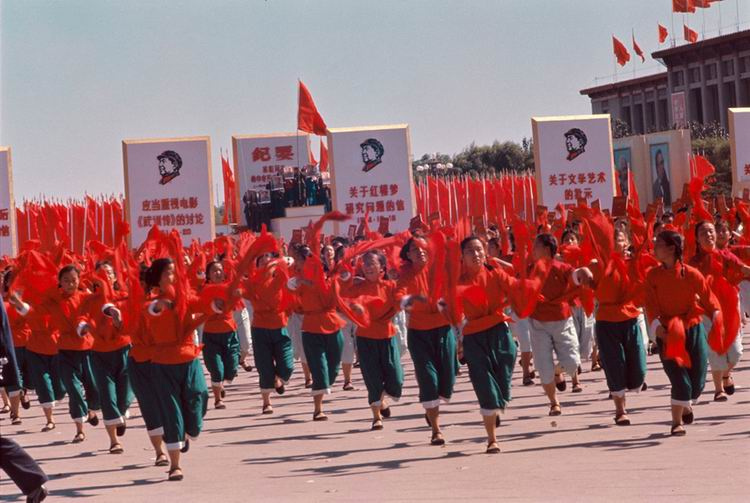 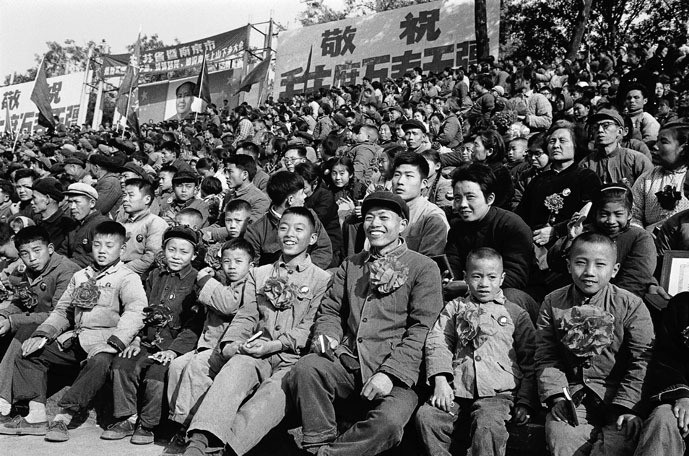 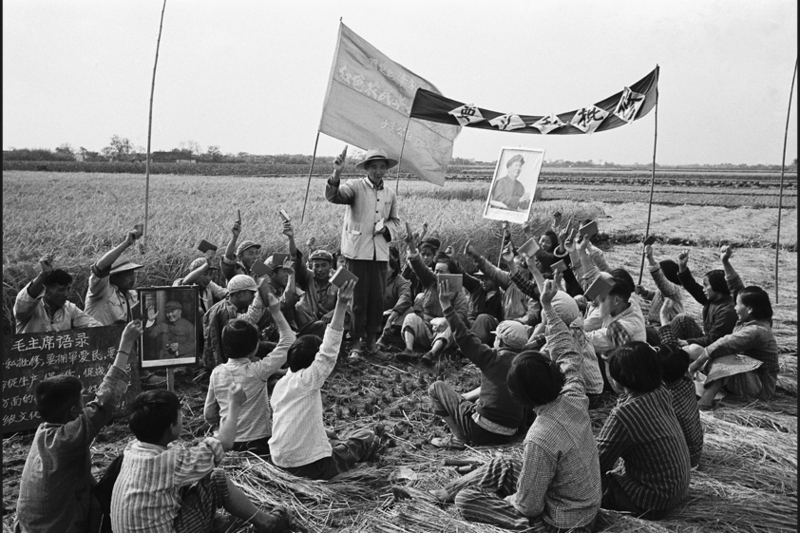 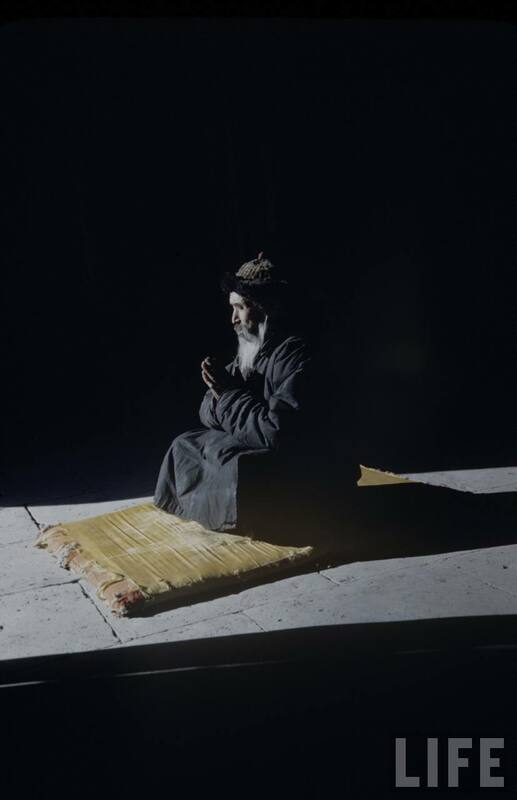 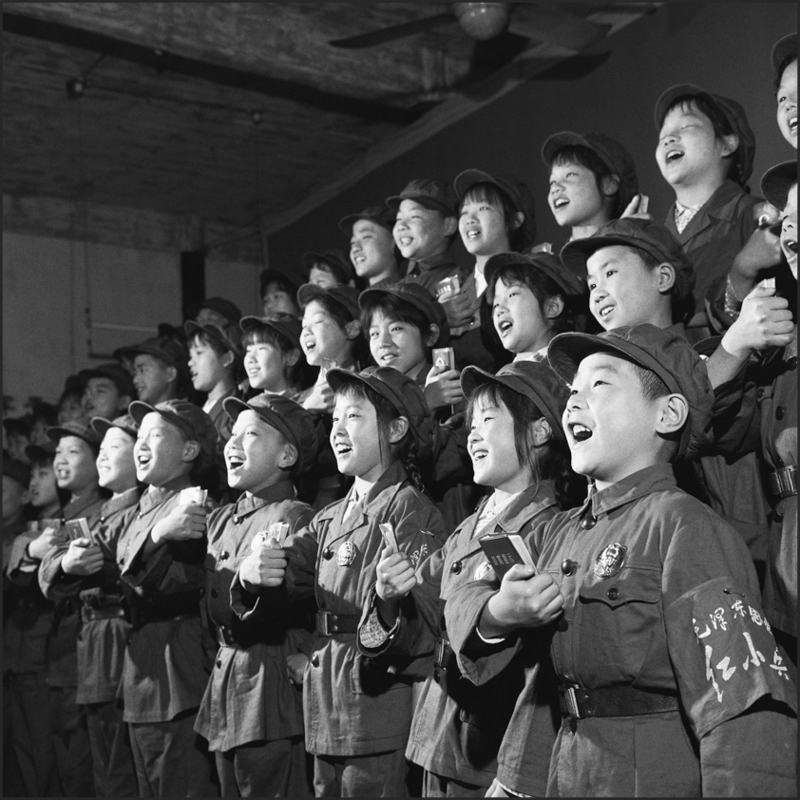 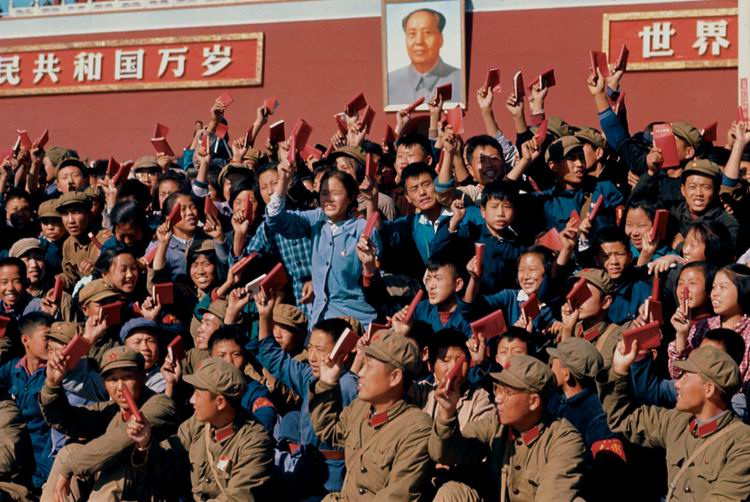 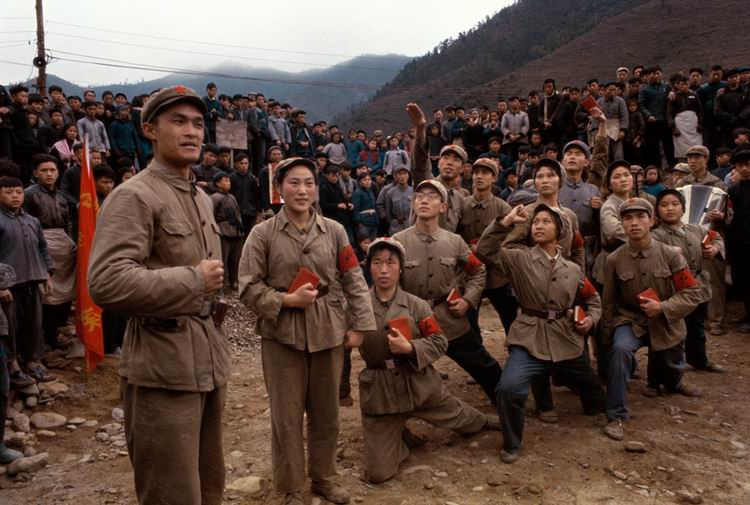 photos taken for the central journals depicted on a high professional level the iconic scenes and gestures of the Cultural Revolution, from swinging the little red book through the marching of the Revolutionary Guards to the revolutionary theater performances. 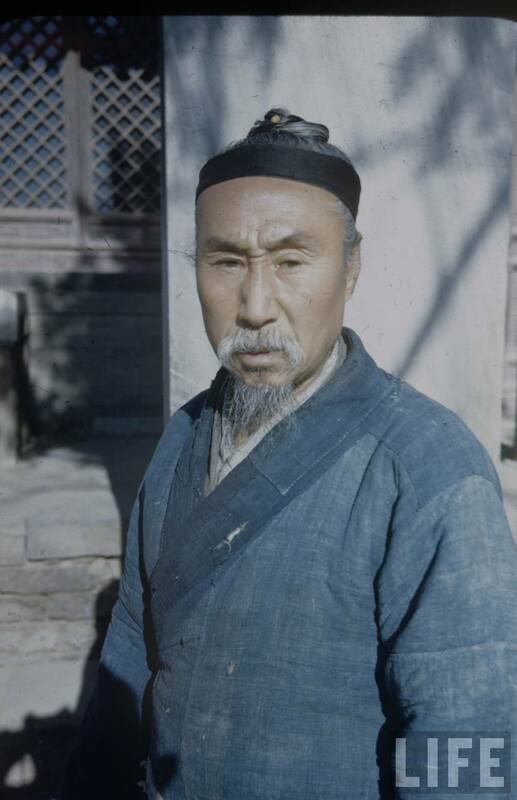 晓庄 Xiăo Zhuāng (1933) went to guerilla fight against the Kuomintang at the age of 16. 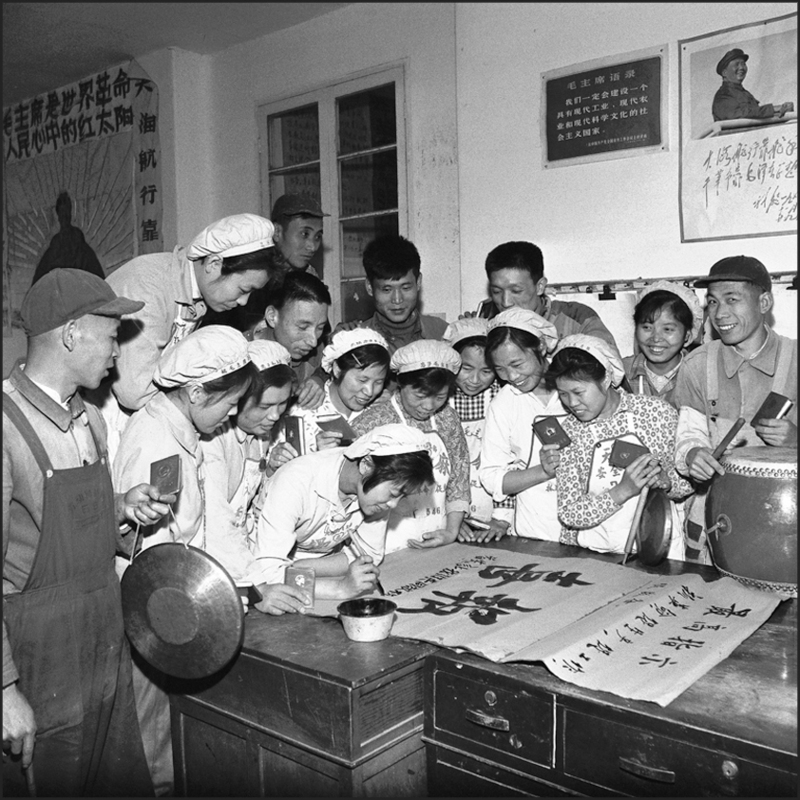 From 1950 she worked for the newspaper of the army, and from 1952 for the Xin Hua News Agency. 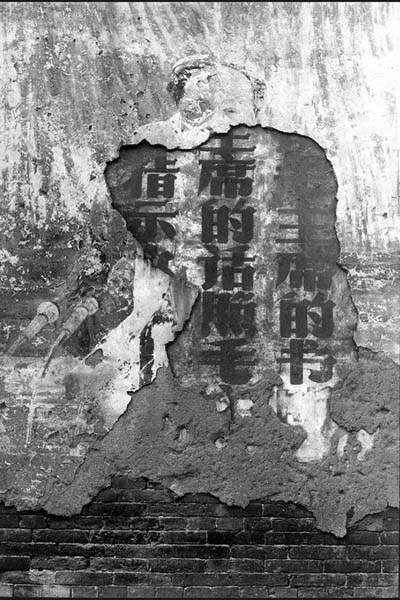 She held several high posts at various newspapers, and from 1980 she was chief redactor of the journal of Chinese photographers. 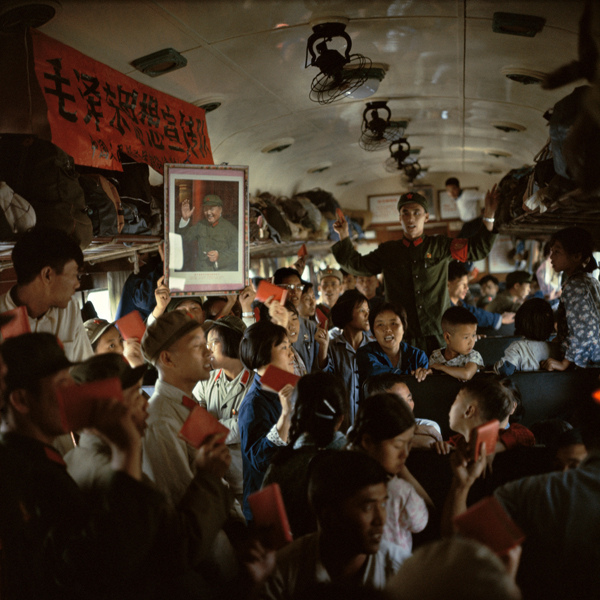 Her pictures show the same iconic scenes obviously through a female eye, very sensitively, focusing on the single persons and on the sight rather than on the political theme. 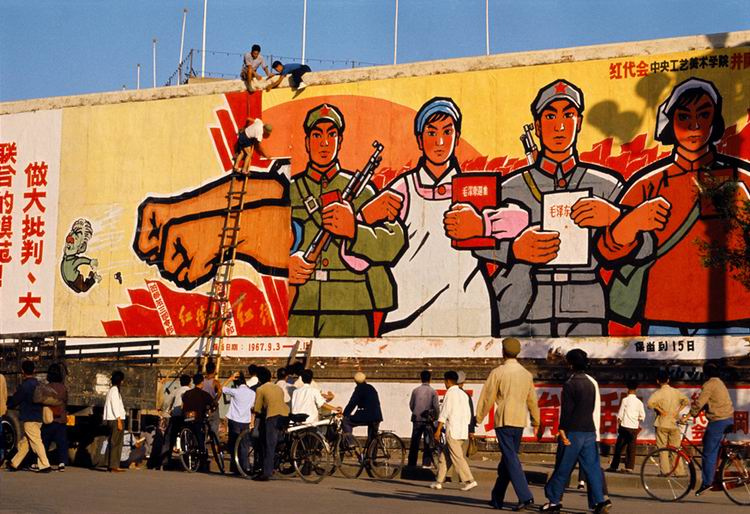 These pictures are not the didactic propaganda illustrations we are accustomed to. 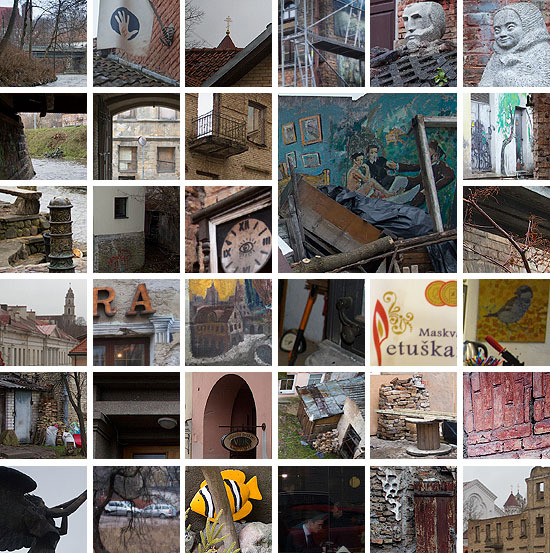 These pictures are very good photos. 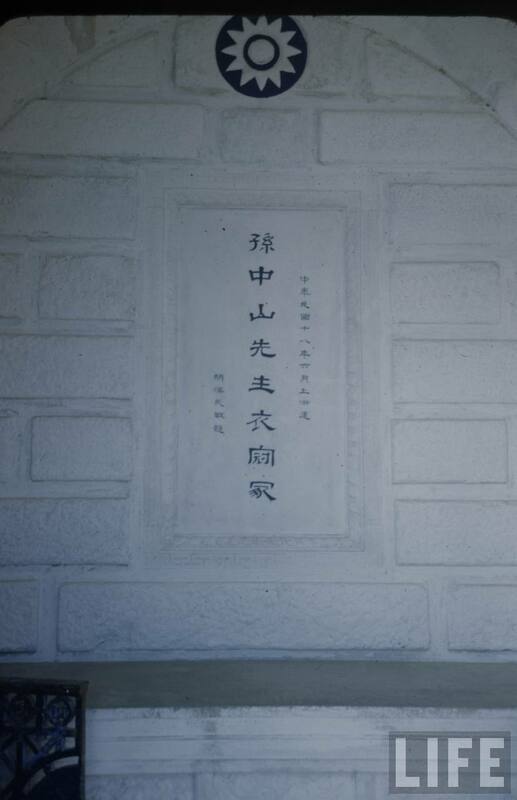 And therefore very dangerous ones. 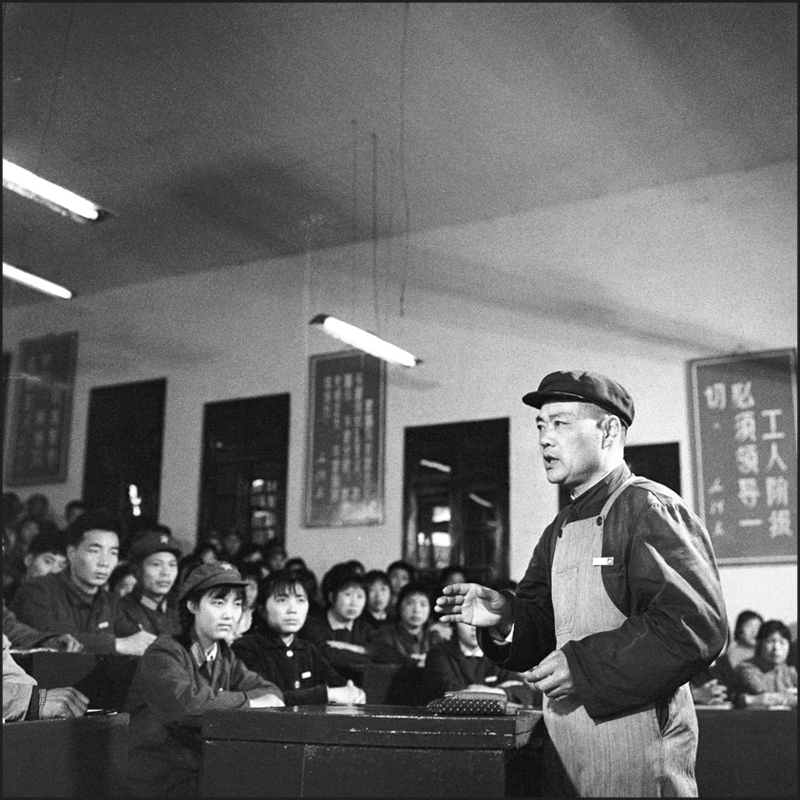 王彤 Wáng Tóng (1967) graduated at the Arts College of Henan. 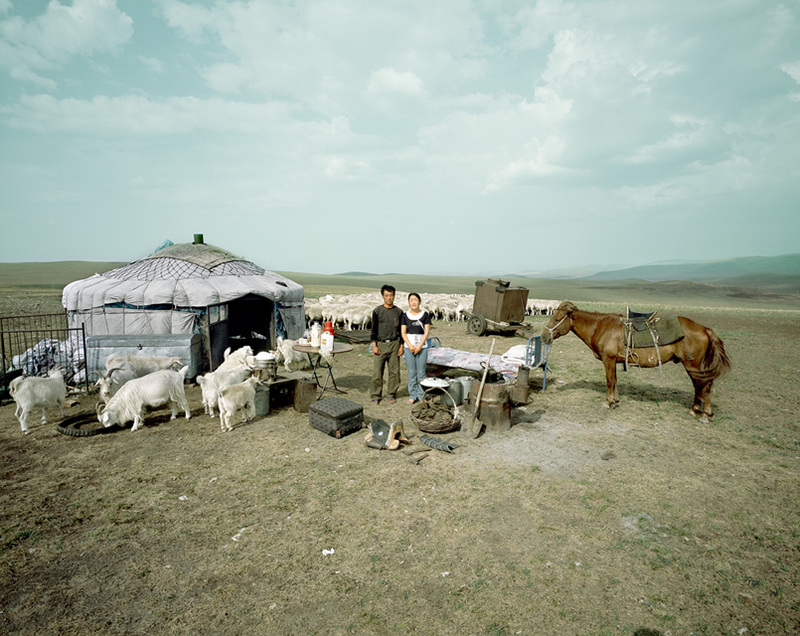 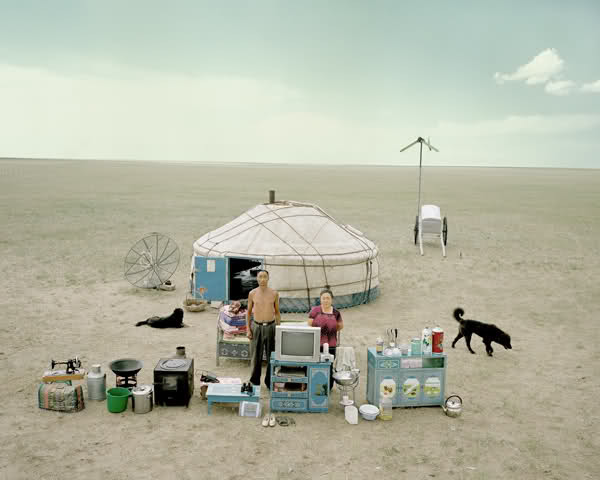 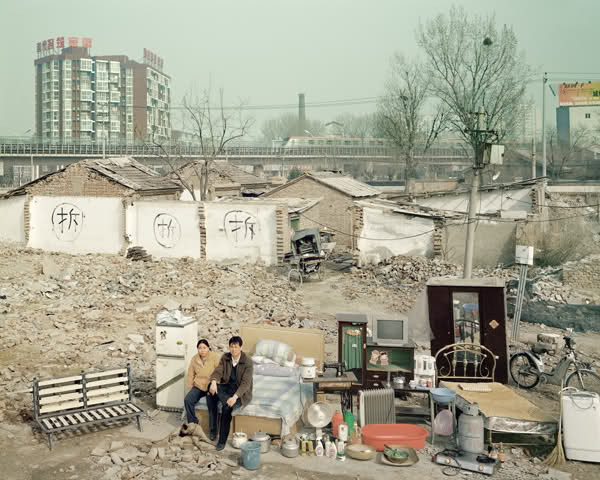 He started to take photos in 1989, and today he is the director of photography of the Chinese National Geographic. 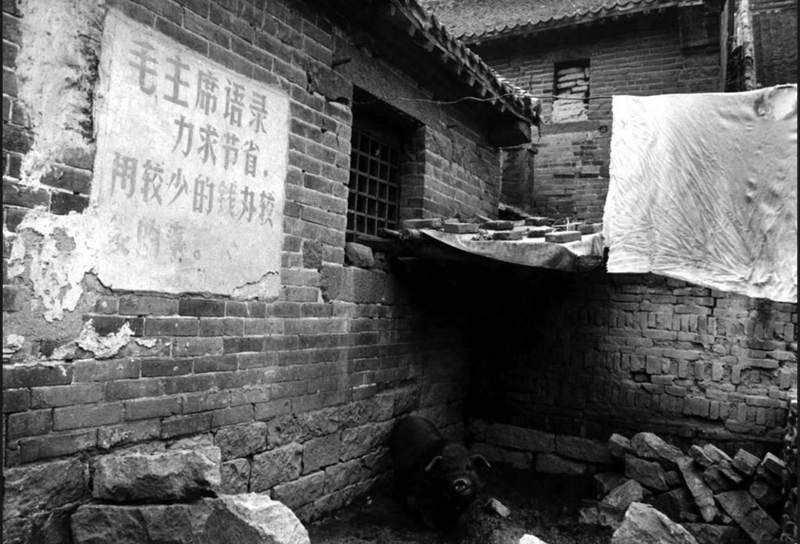 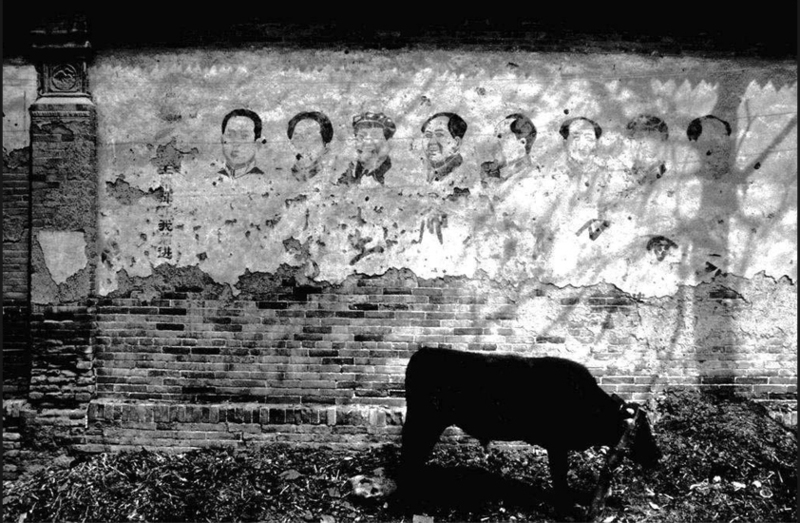 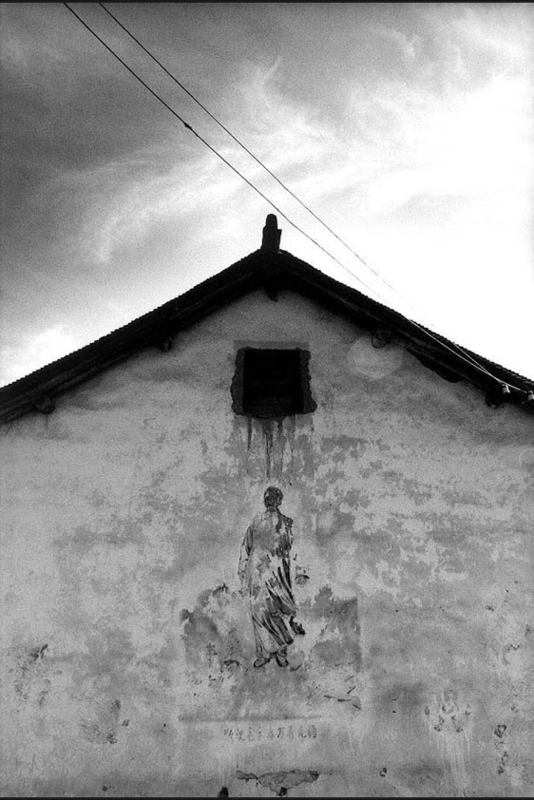 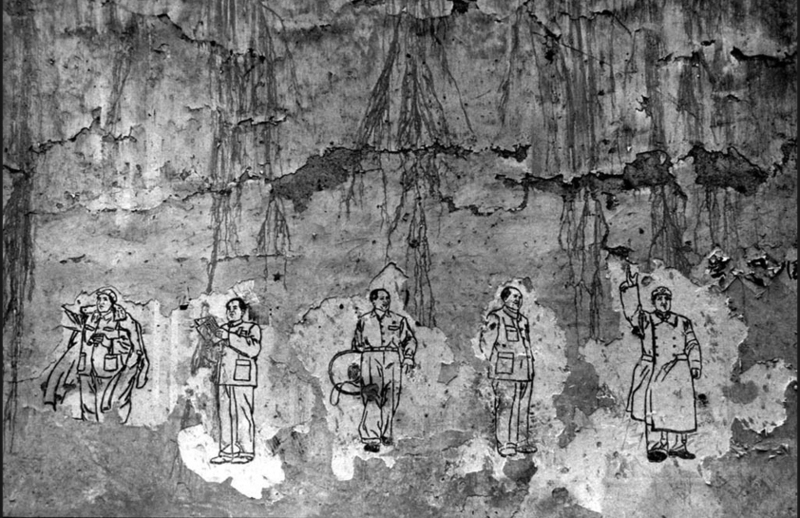 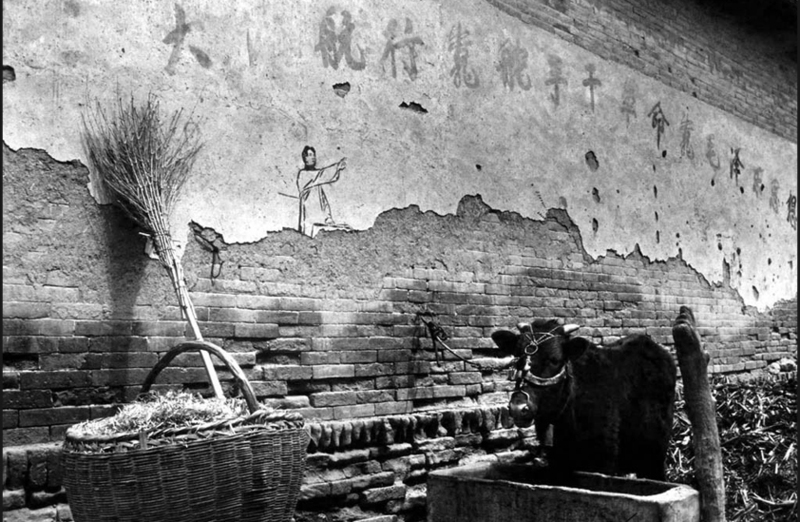 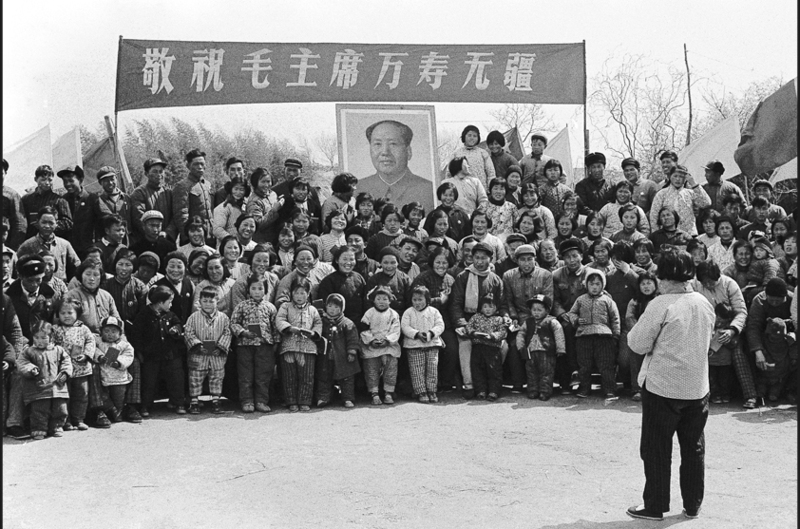 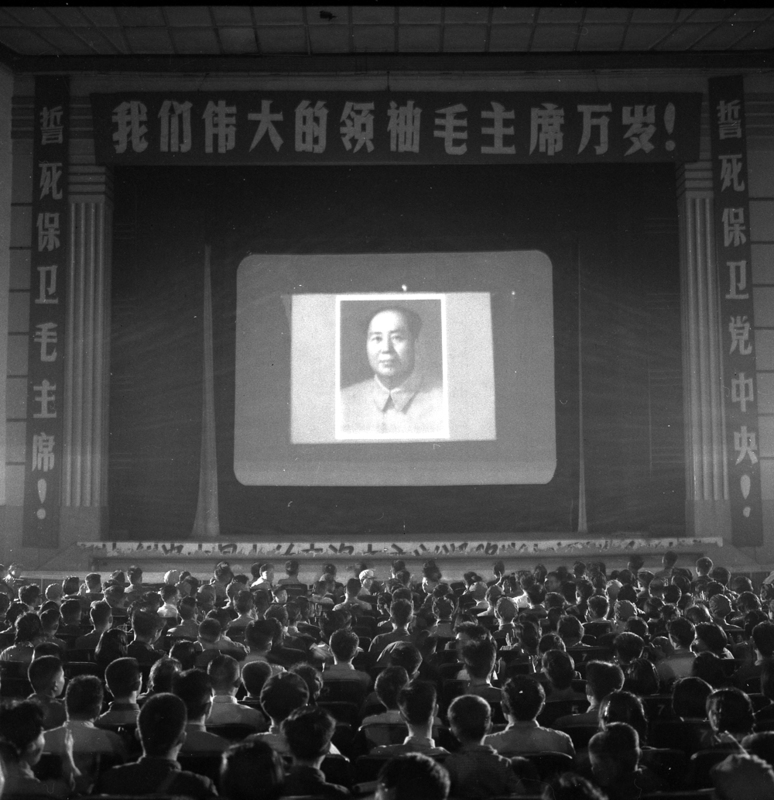 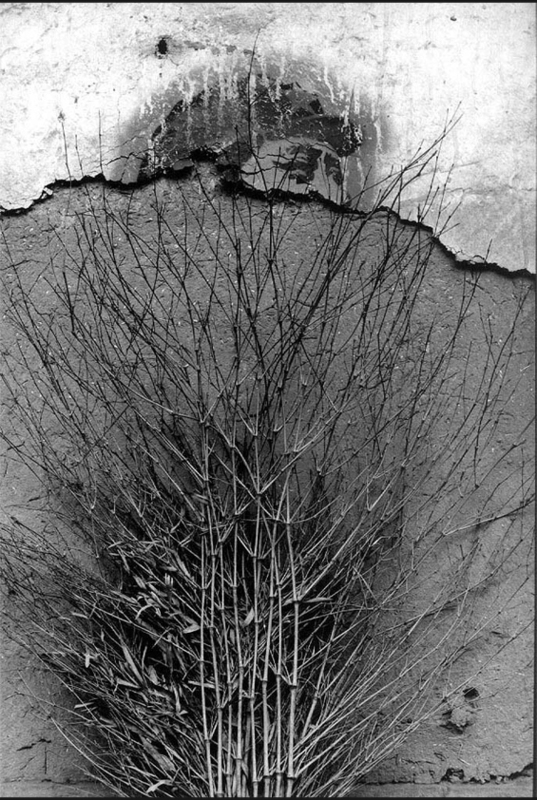 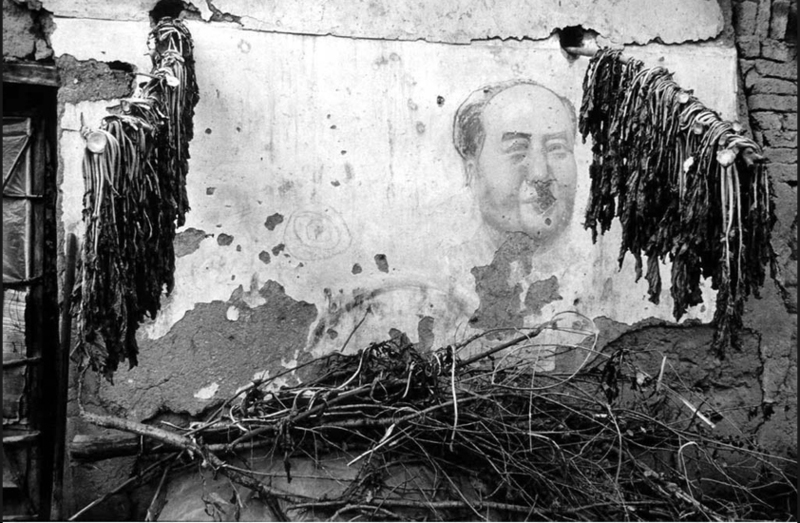 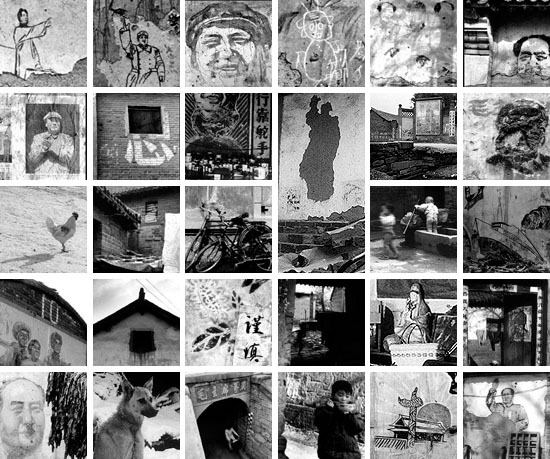 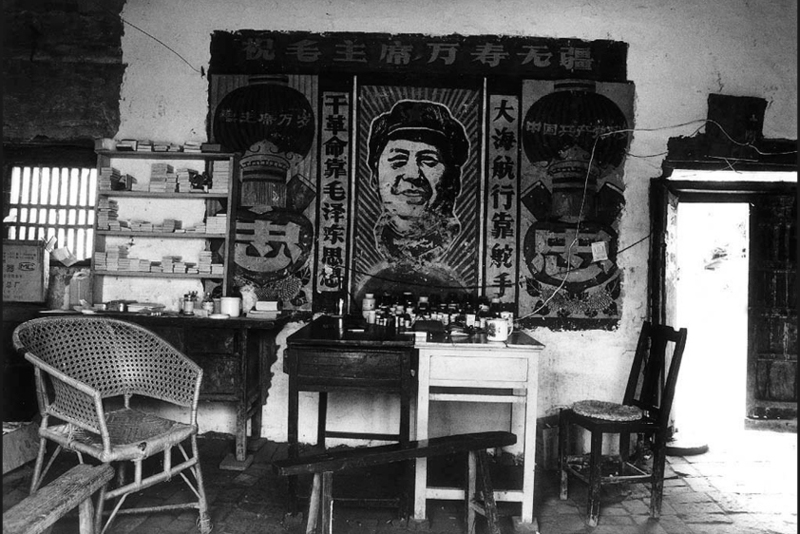 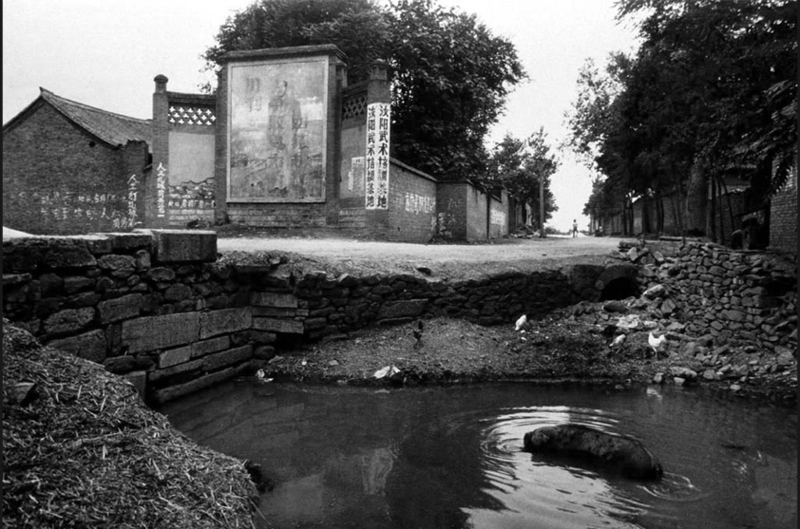 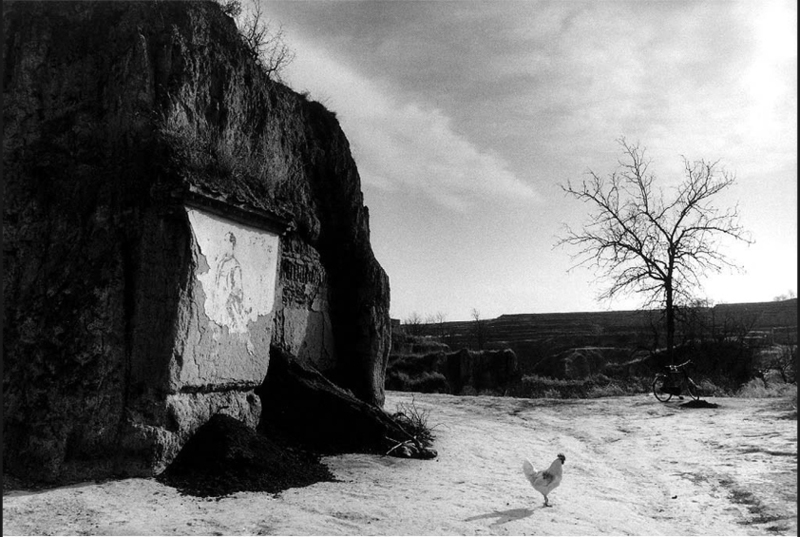 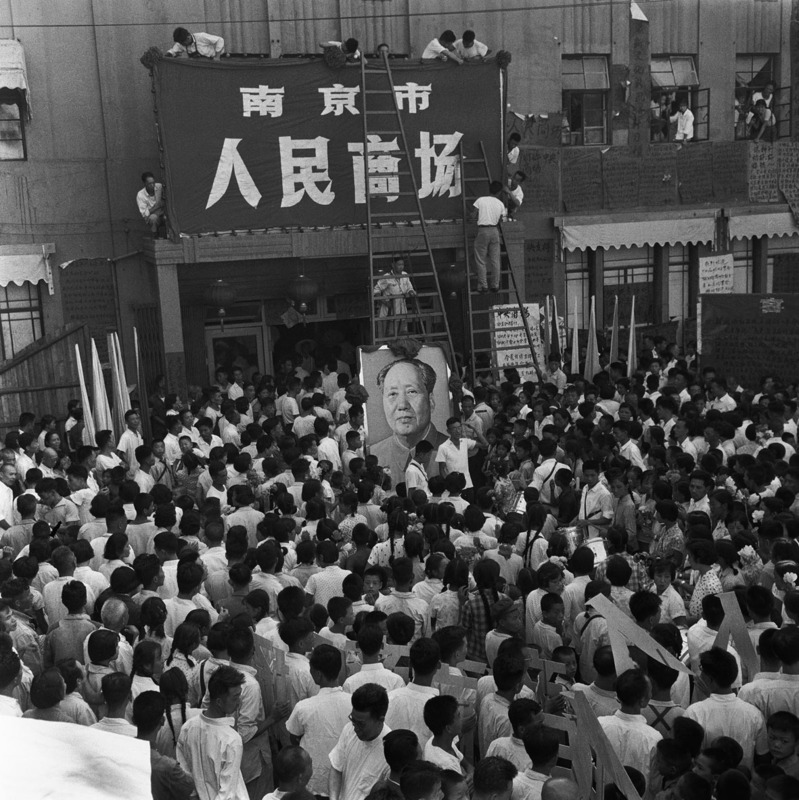 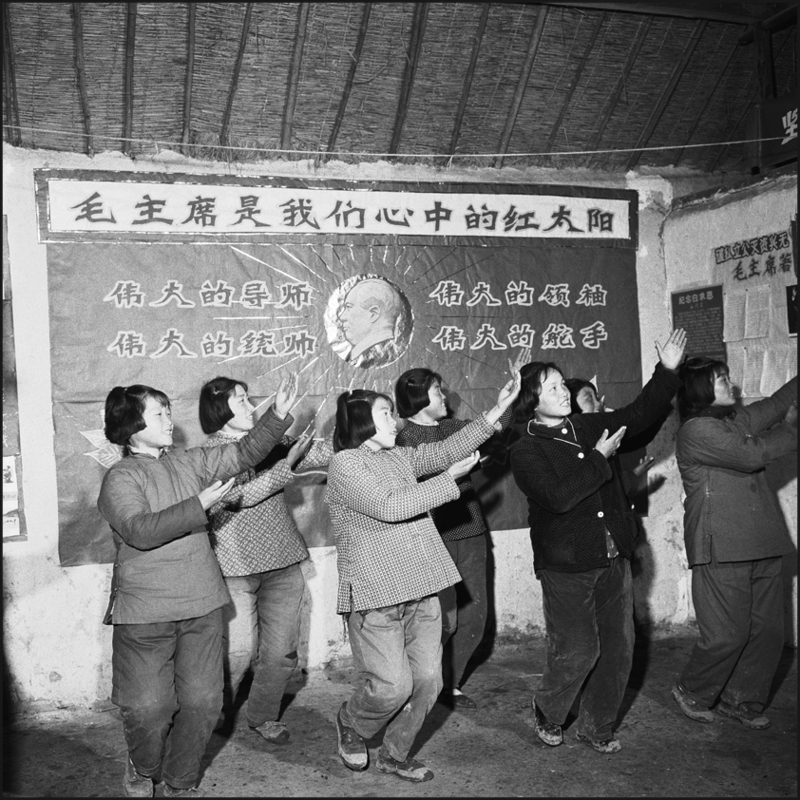 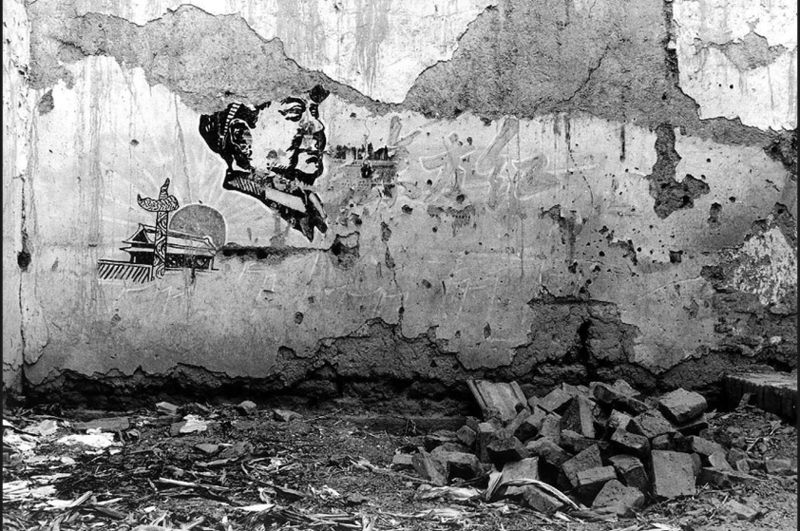 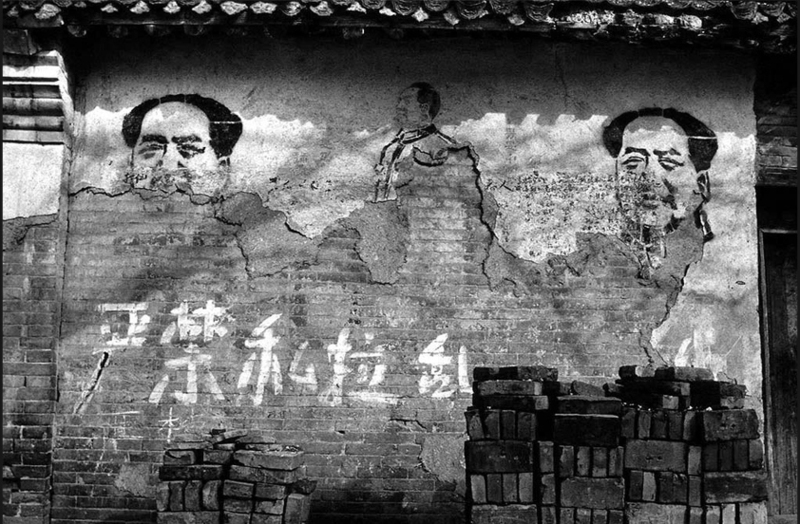 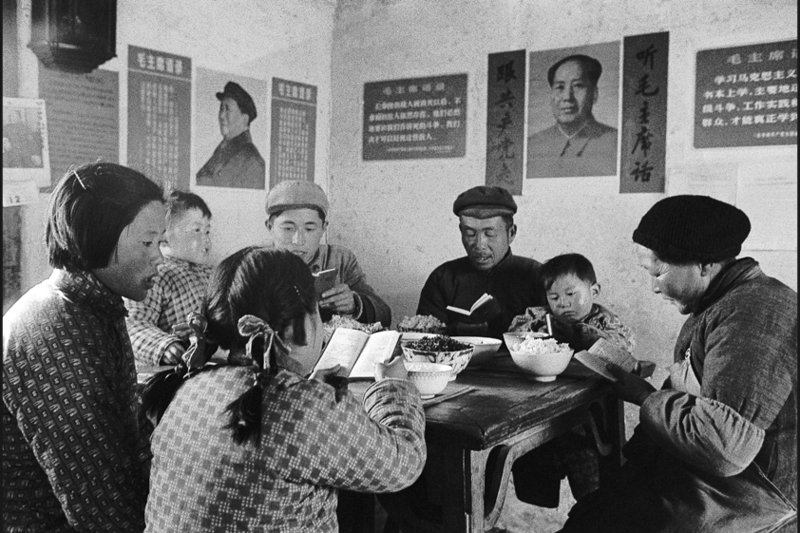 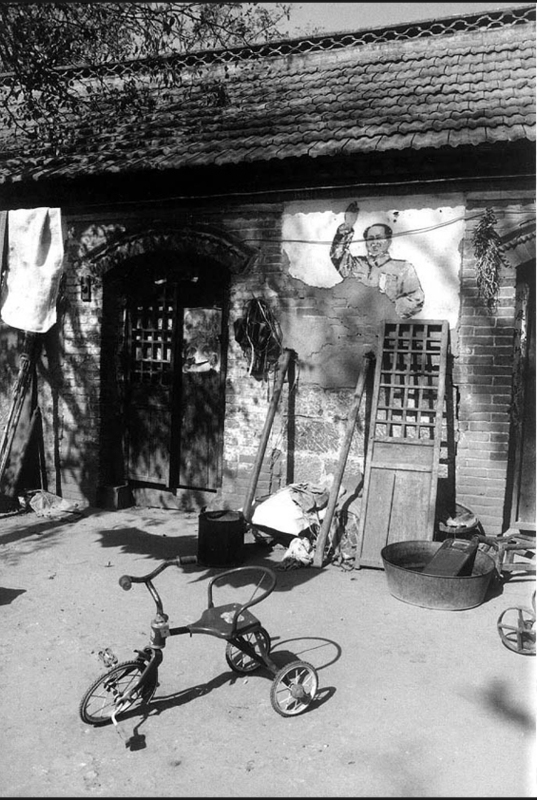 He took the following photos back in 1996 as a beginner, on one of the last visual memory of the Cultural Revolution living with us, the Mao representations surviving on the walls. 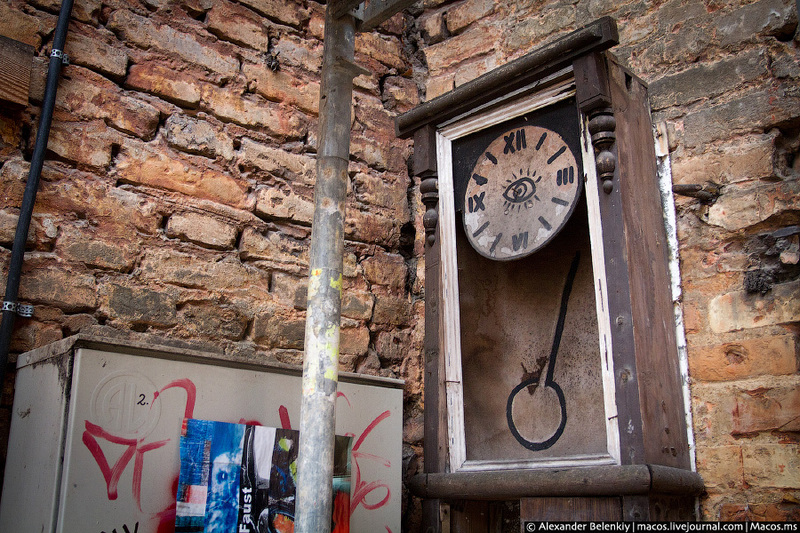 Probably in the last minute. 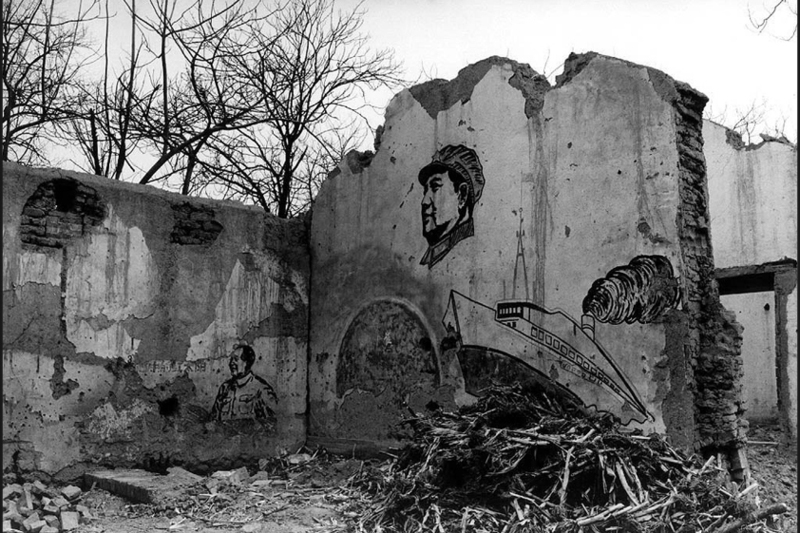 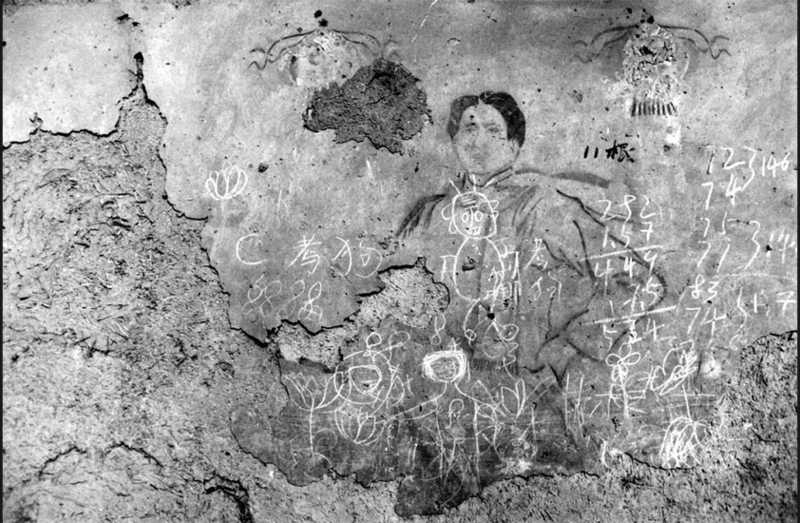 The images and inscriptions which did not disappear of themselves by the time, were destroyed together with the wall and with all old Beijing by the heirs of Mao and the Cultural Revolution. 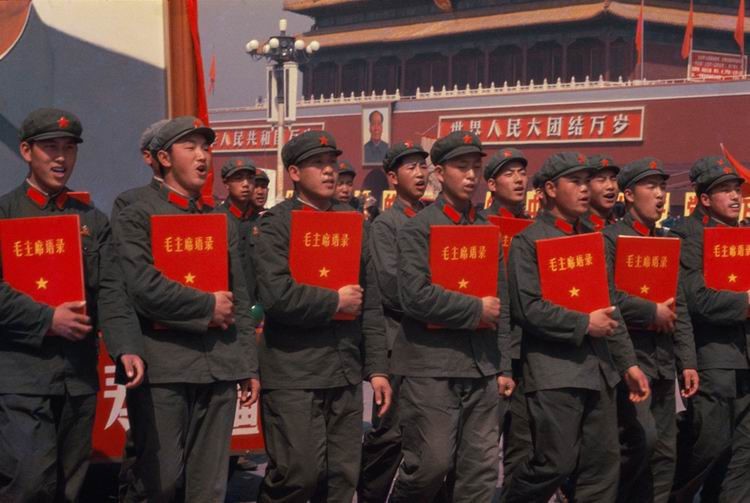 «Como todos los Fillyjonks, también ella estaba rodeada de un buen montón de baratijas. 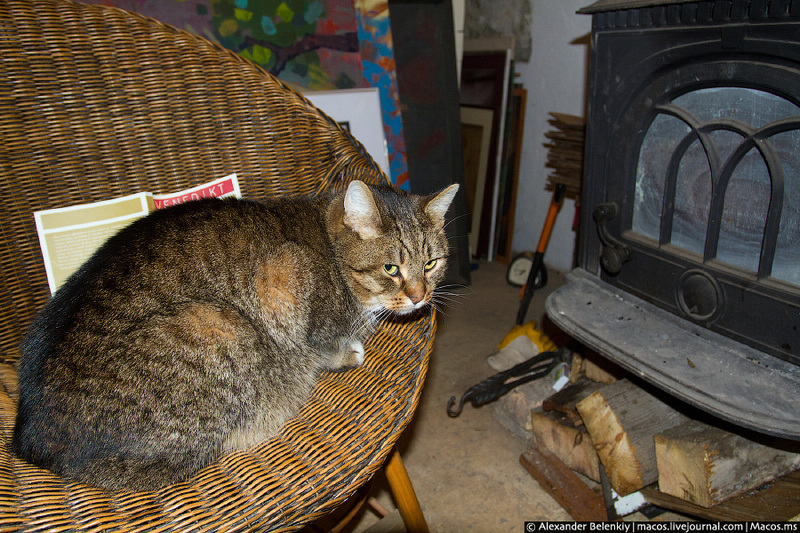 Pequeños espejos y fotos de familia sobre terciopelo en marcos de concha, gatitos de porcelana y Hemulens sobre manteles de encaje, dichos de oro bordados en preciosa seda o plata, pequeñas copas y encantadoras cubreteteras —cierto, todo este tipo de cosas que hacen la vida más fácil, menos peligrosa y menos deprimente». 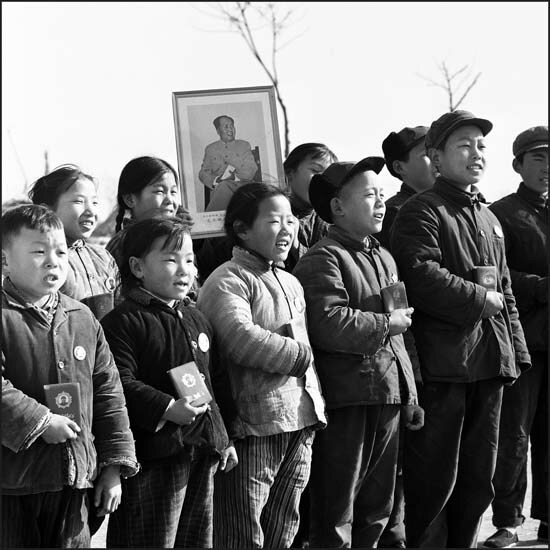 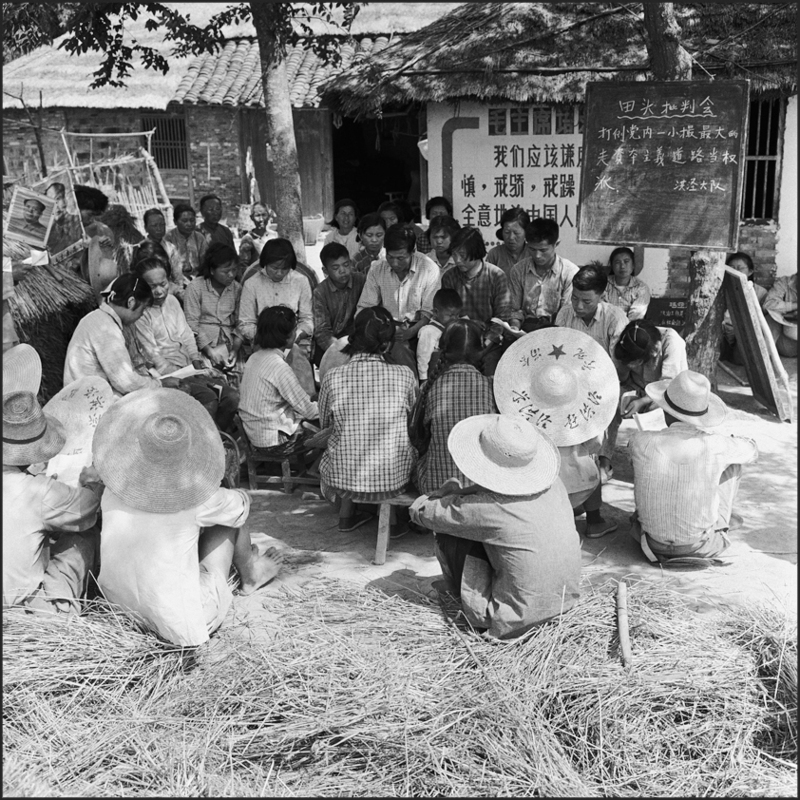 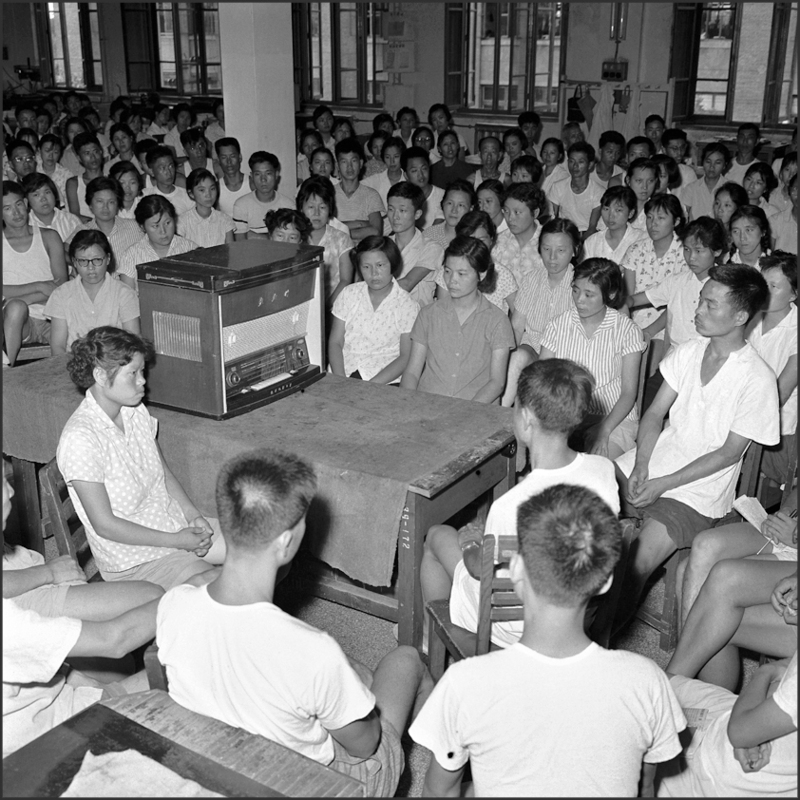 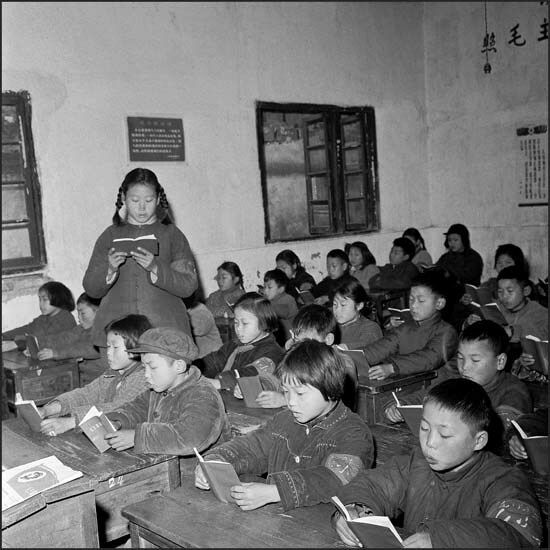 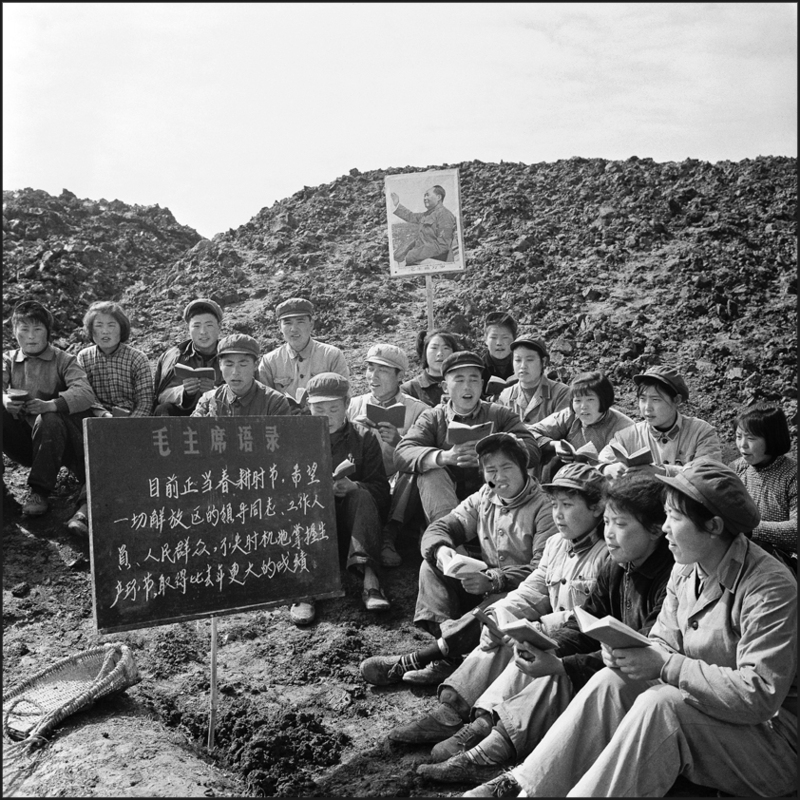 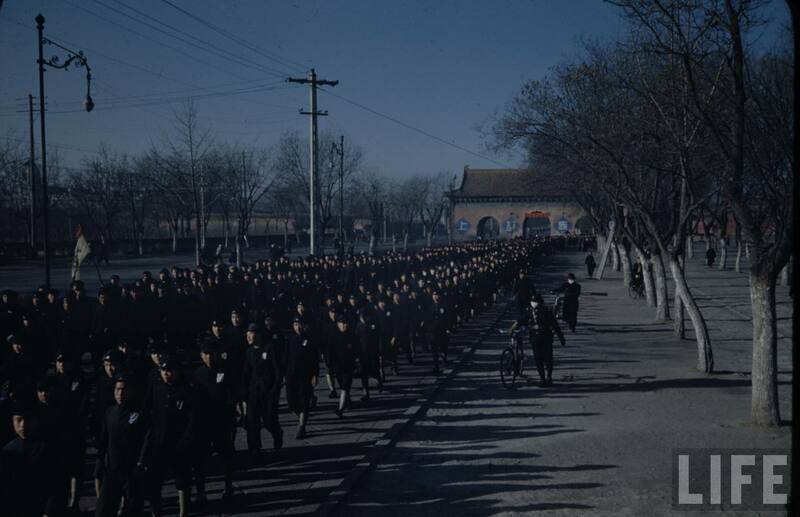 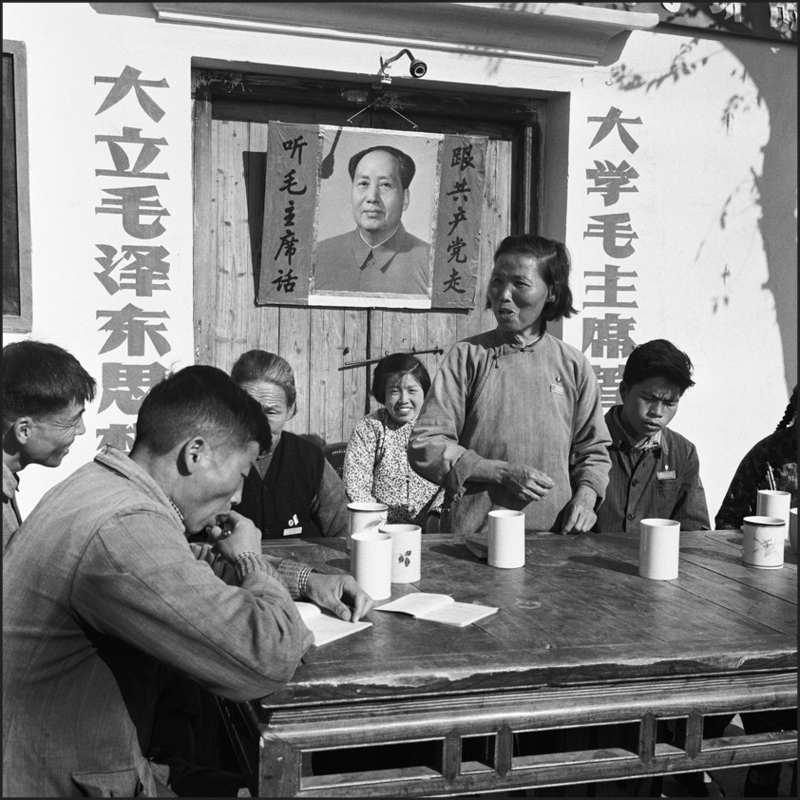 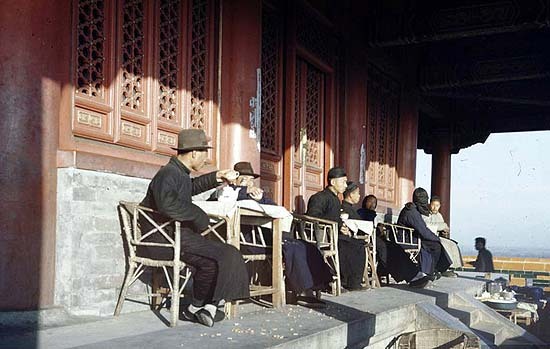 Los fotografos de Beijing 黄庆军 Huáng Qìngjūn (1971) y 马宏杰 Mă Hóngjié (1963) han estado recorriendo durante años casi toda China intentando convencer a una familia en cada provincia —cosa que, dicen, no ha sido tarea fácil— de que expusieran sus propiedades delante de la casa y se colocaran entre ellas, y de que les dejaran sacar luego una foto del conjunto. 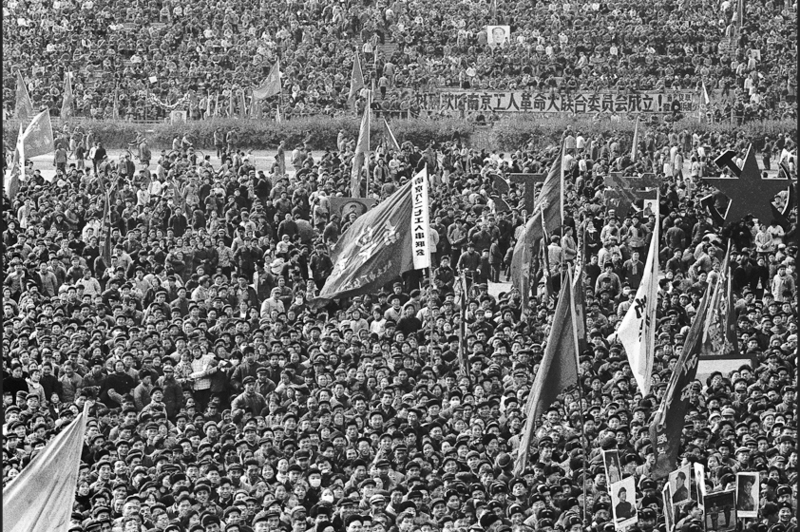 No sabemos si también sugerían cómo organizar los objetos. 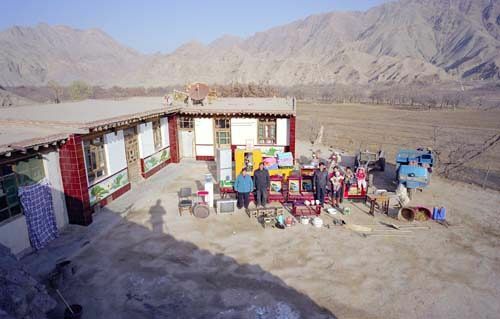 De no ser así, es sorprendente cómo se repiten patrones similares en la presentación de las propiedades, desde la estepa de Mongolia Interior hasta las aldeas Miao y desde las montañas de Sichuán hasta el estuario del Yangtzé. 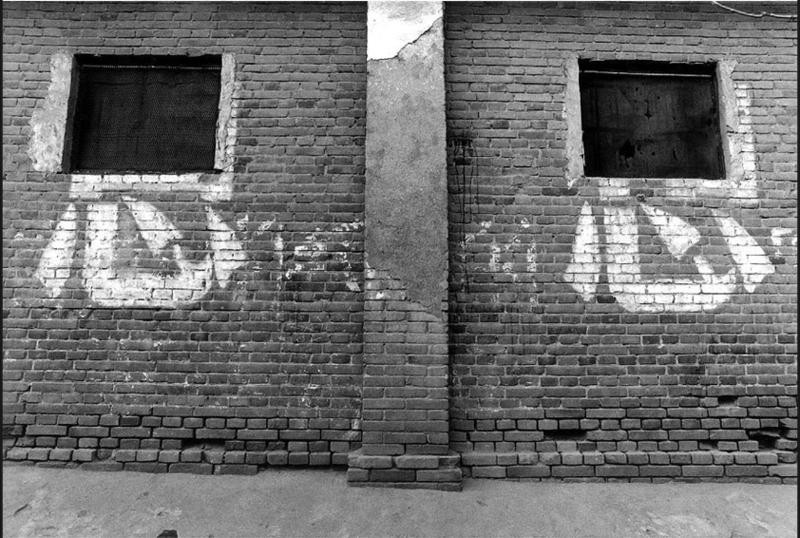 Las disponen en una amplia línea frontal, para hacer bien visible el mayor número e intentando, y casi siempre consiguiendo, que quepan en una única hilera. 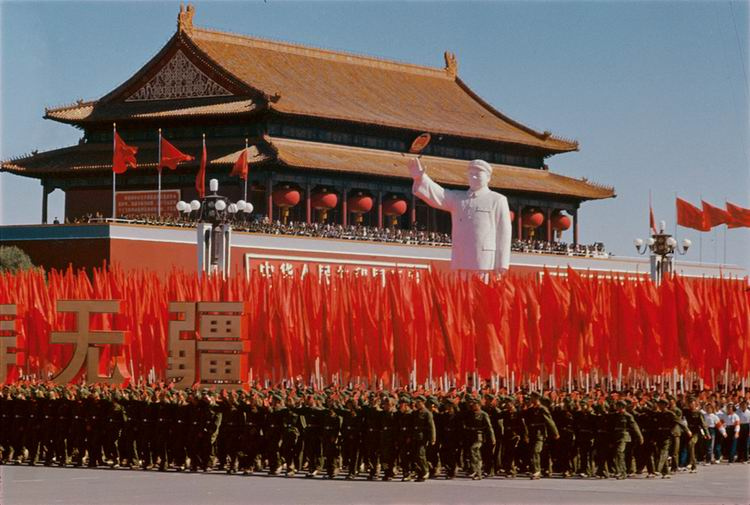 Normalmente no las apilan, sino que las presentan una por una, del mismo modo como las adquirieron. 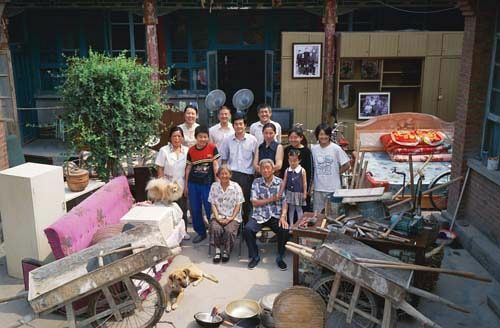 La familia está casi siempre sentada o de pie en el medio. 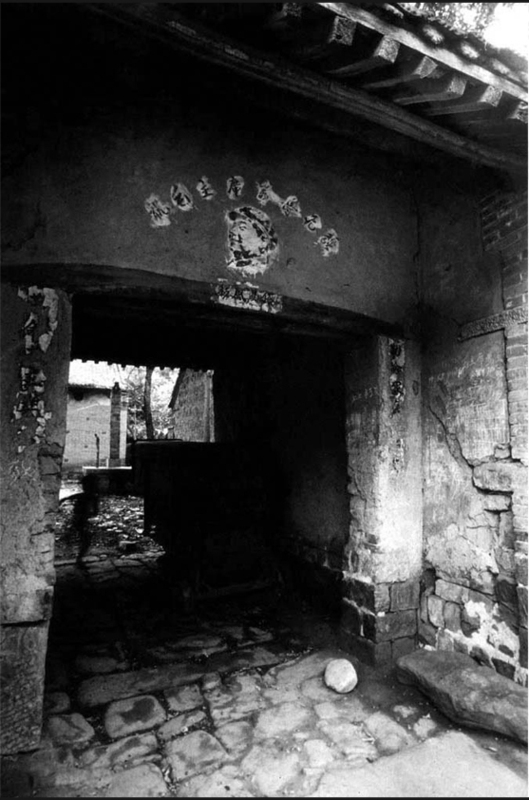 Es así incluso en las dos o tres excepciones en que se desplazan hacia la casa como centro. 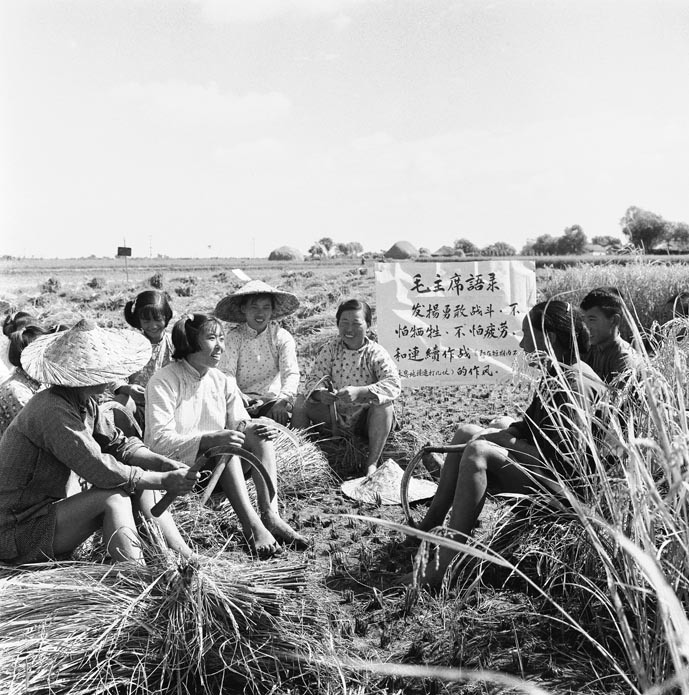 En los casos en que tienen reservas de alimentos, sacos de arroz, maíz, las ponen en primer plano como símbolo de abundancia. Así como a los animales. Viendo las fotos, la primera impresión es «he aquí todo esto». 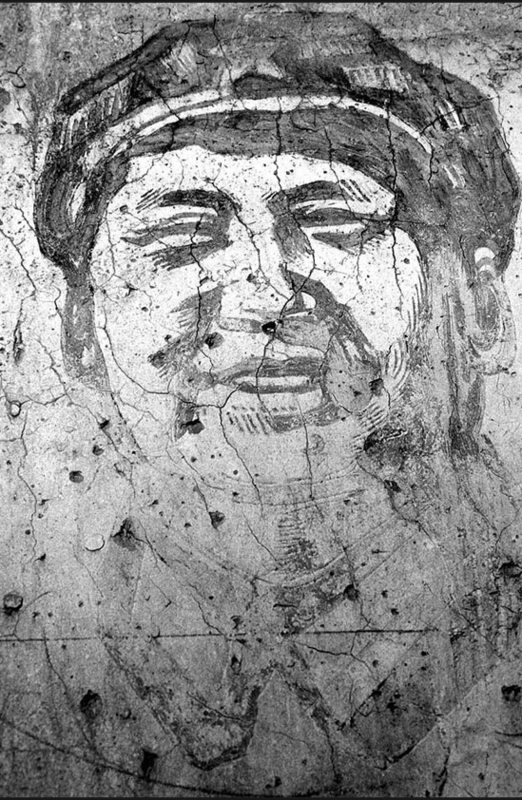 Aquí tenemos todos los objetos que rodean a estas personas desde su nacimiento hasta su muerte, las cosas cuya presencia esperan y necesitan encontrar en su lugar correspondiente, repartidas dentro o fuera de la casa. 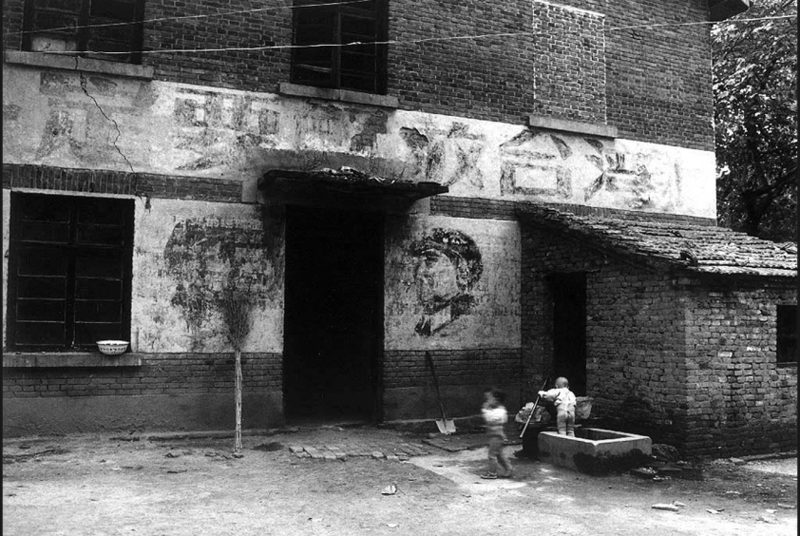 Su peso como entidad conjunta, como si se tratara de un miembro más de la familia, solo ha de advertirse de manera clara en el momento de mudar de domicilio, o cuando se ven en la calle. 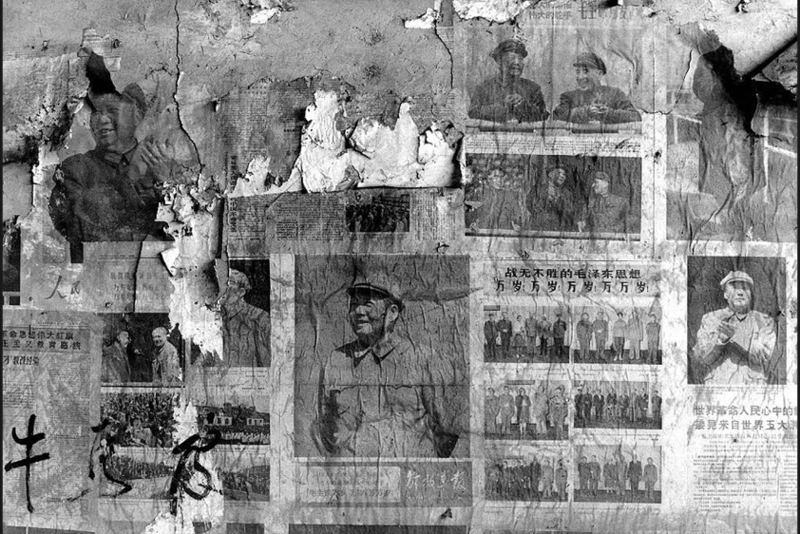 La segunda impresión es: «¿esto es todo?» ¿Se puede pasar la vida con estos pocos bienes? 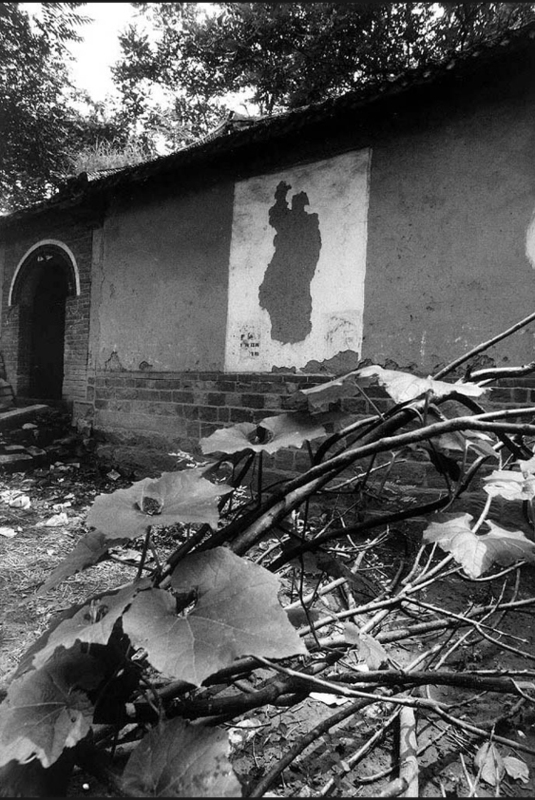 No hace mucho, en un hogar campesino se contaban unos quinientos objetos, la mayoría de uso cotidiano. 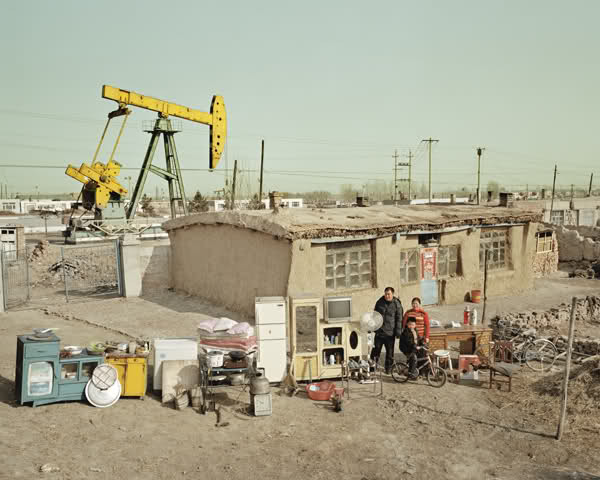 En nuestro mundo industrializado nos sumimos en hasta cien veces más objetos por hogar. 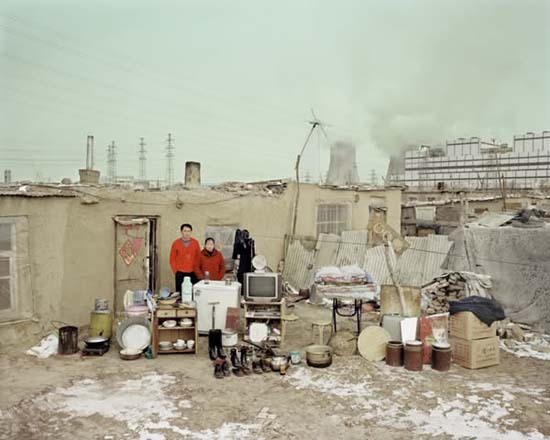 No importa lo mucho que deseemos una vida más simple ni que queramos eliminar todas las fruslerías innecesarias de nuestro entorno: un grupo de objetos de uso cotidiano reducido a tal extremo significaría para nosotros pobreza, y sin tener en cuenta la condición de las casas. 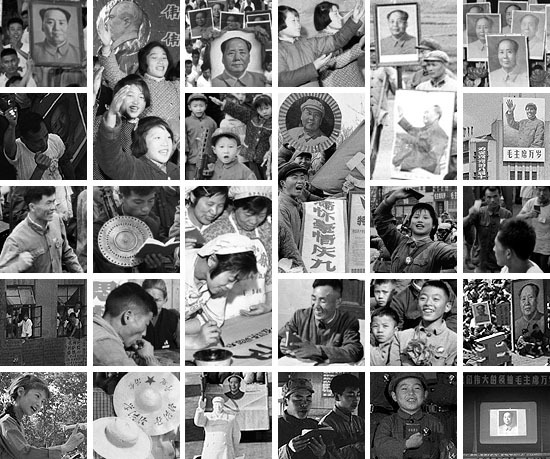 Sin embargo, los dos fotógrafos destacan en los textos con que acompañan su trabajo cómo nos encontramos ante un increíble avance en la riqueza de una inmensa mayoría de familias chinas, que ahora pueden poseer tantas cosas. 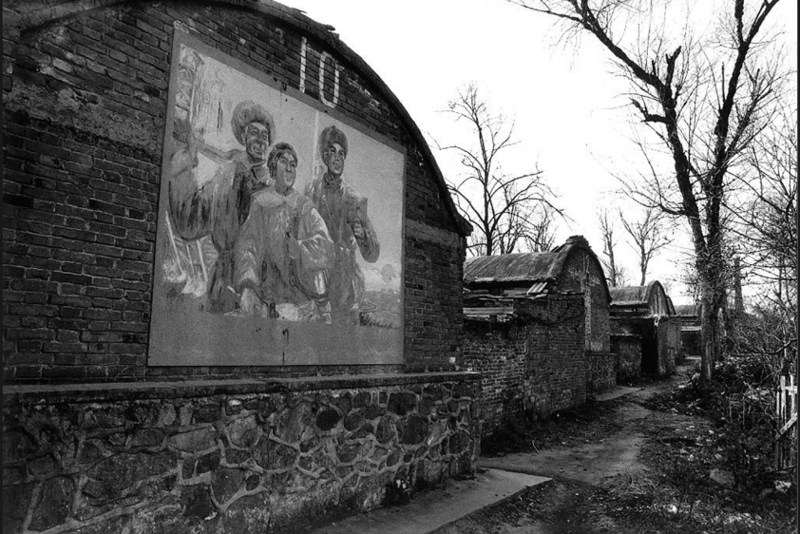 Para ellos, dicen, esta exhibición es la prueba de las oportunidades y el progreso sin ataduras que les ha traído el Partido después de tantas décadas de promesas. 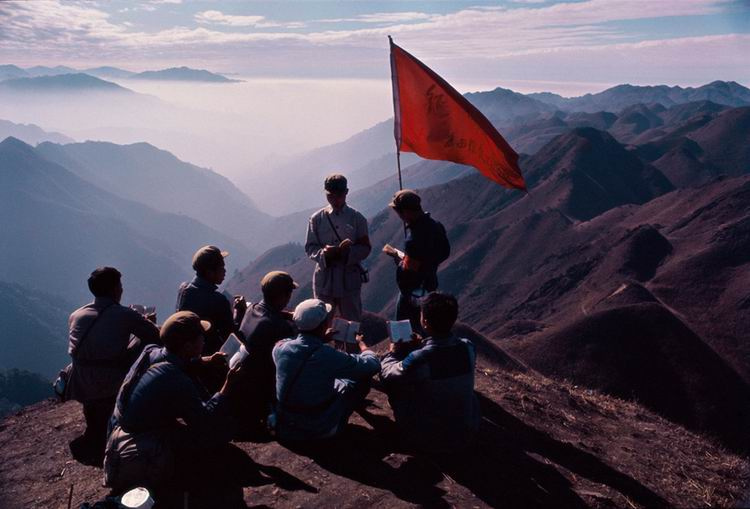 A menudo olvidamos la distancia que separa nuestros puntos de vista. 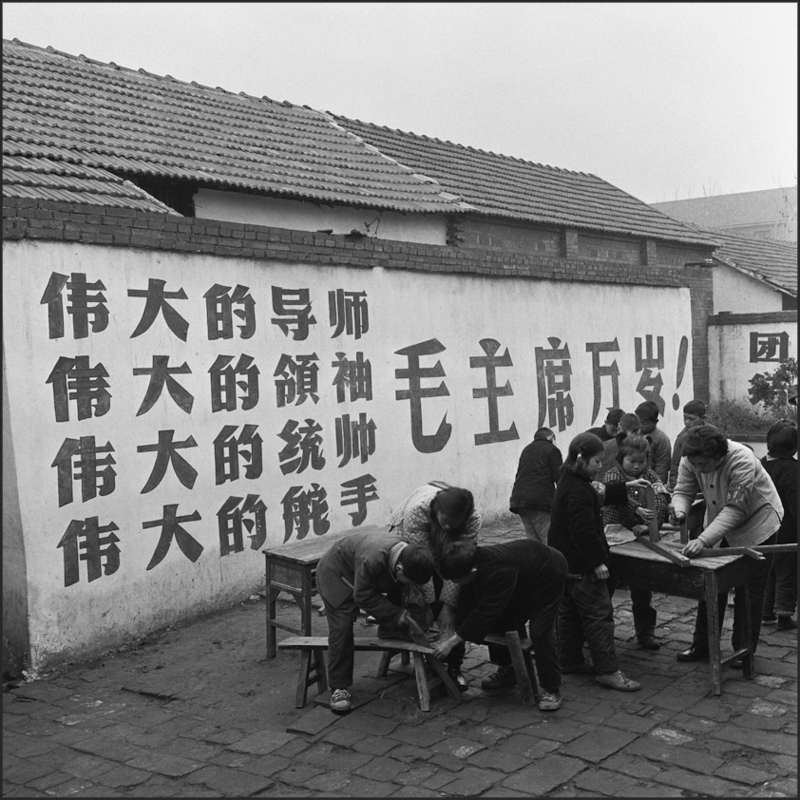 Beijing photographers 黄庆军 Huáng Qìngjūn (1971) and 马宏杰 Mă Hóngjié (1963) have been roaming about all China for years by trying to persuade a family in each province – it’s not easy, they say – to put off all their stuff in front of the house, and to sit down between them, so the photographers could take a group image of them. 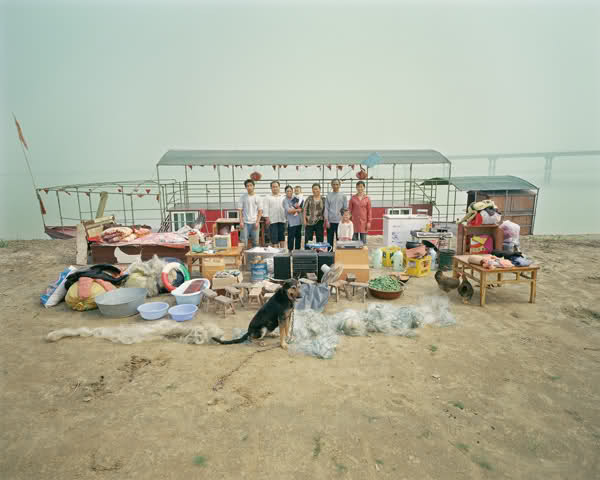 I do not know whether they also tell them how to arrange their objects. 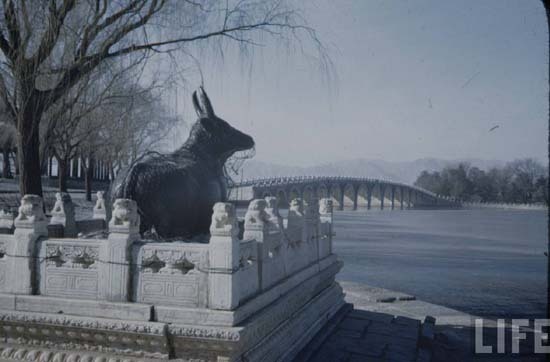 If not, then it is remarkable how similar patterns are followed in the display of things from the Inner Mongolian steppe to the Miao villages and from the mountains of Sichuan to the Yangtze estuary. 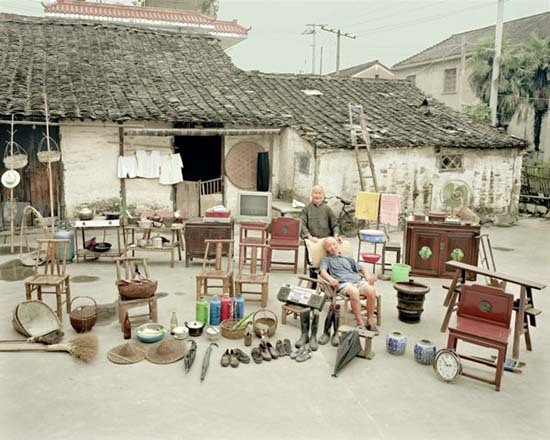 They arrange them in one single broad line, to make visible the most possible items, provided that they fit into one line, but usually they do. 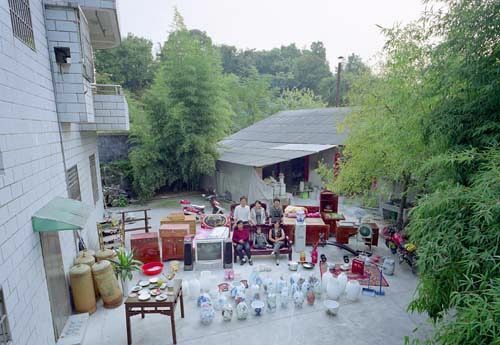 Normally they do not pile them up, but exhibit them one by one, just like they acquired them. 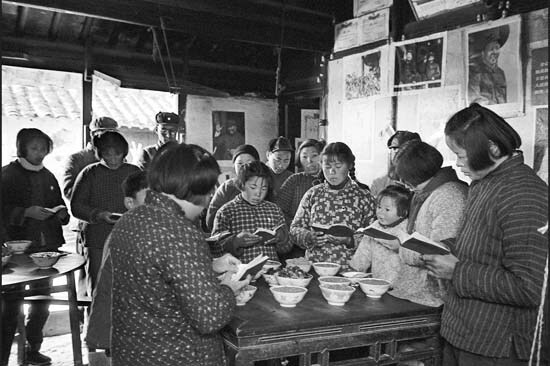 The family is almost always sitting or standing in the middle, and even in the two or three exceptions they are shifted towards the house as a center. Wherever they have food reserves, rice sacks, corn pipes, they put them in the forefront as the symbol of abundance. 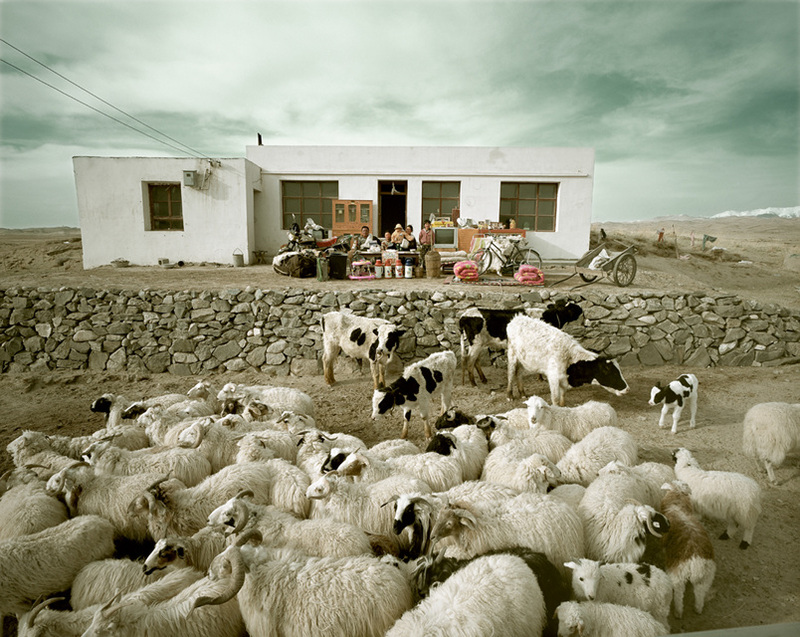 As well as the animals. 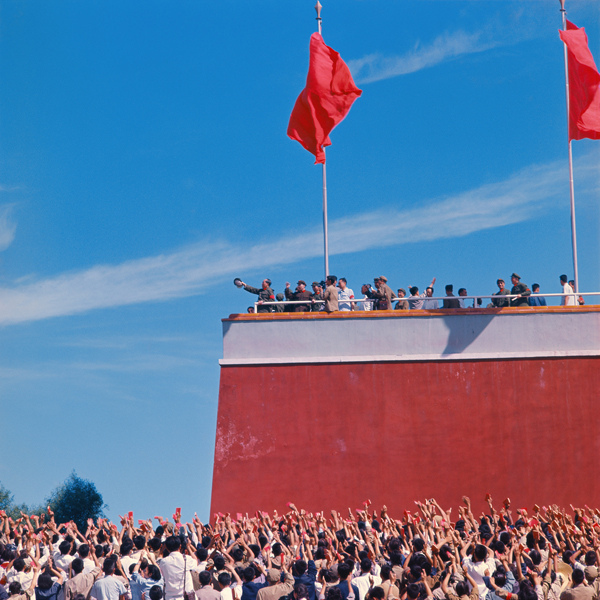 Looking at the pictures, our first impression is “this much, then”. 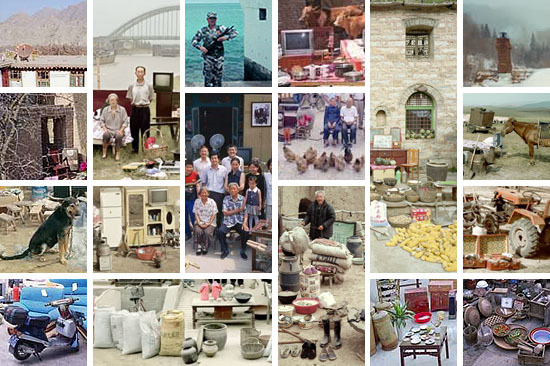 Here we have together all the objects which are touched by a person from his birth to his death, which are always waiting for this touch on the usual place in the background, scattered in and around the house, so that the weight of their joint presence, like that of an additional family member, is perceived in such a compulsive way only at the time of moving to a new house, or when one is turned out to the street from the old one. 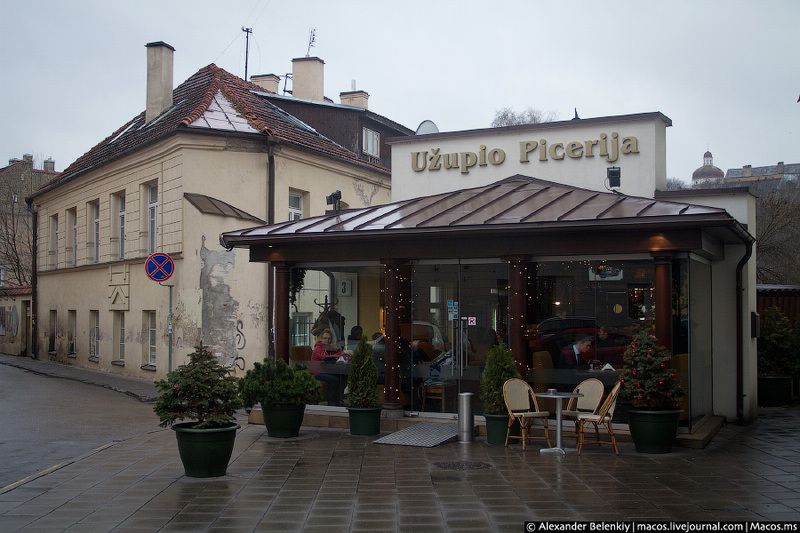 The second impression is: “this much only”? 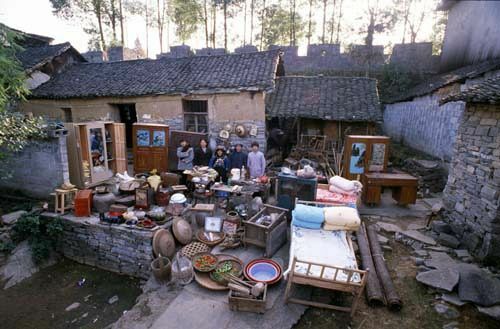 Is it possible to live a whole life with so few things? 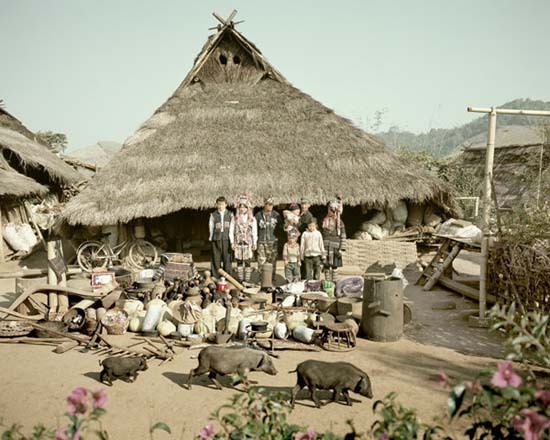 While not so long ago a peasant household had about five hundred objects, most of which were used in daily activities, in an industrialized culture we are surrounded by even a hundred times more things per household. No matter how much we want to live a simple life and try to eliminate the unnecessary frippery around ourselves, a set of everyday objects reduced to this extreme implies poverty to us even without considering the condition of the houses. 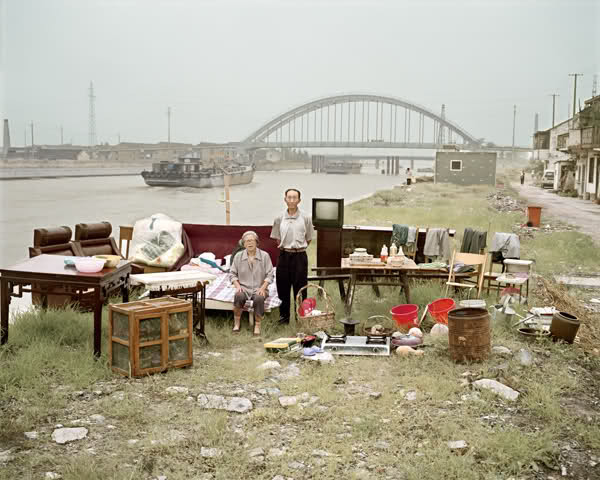 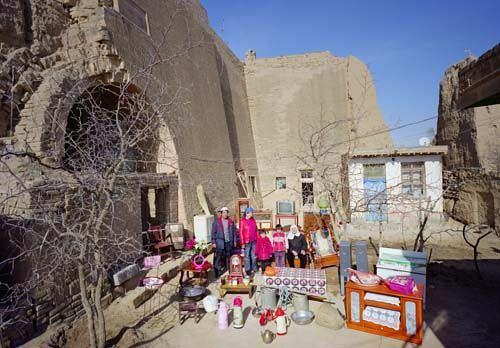 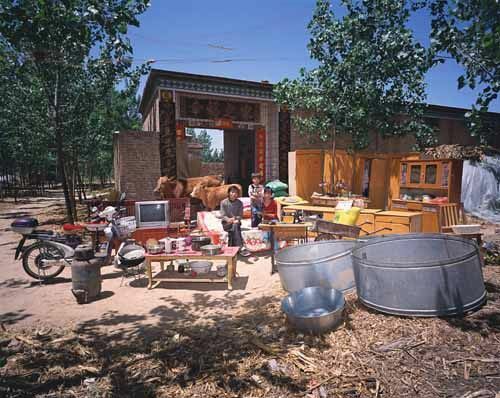 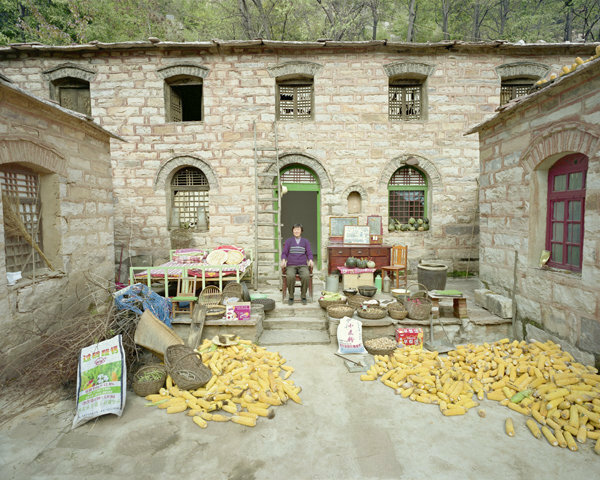 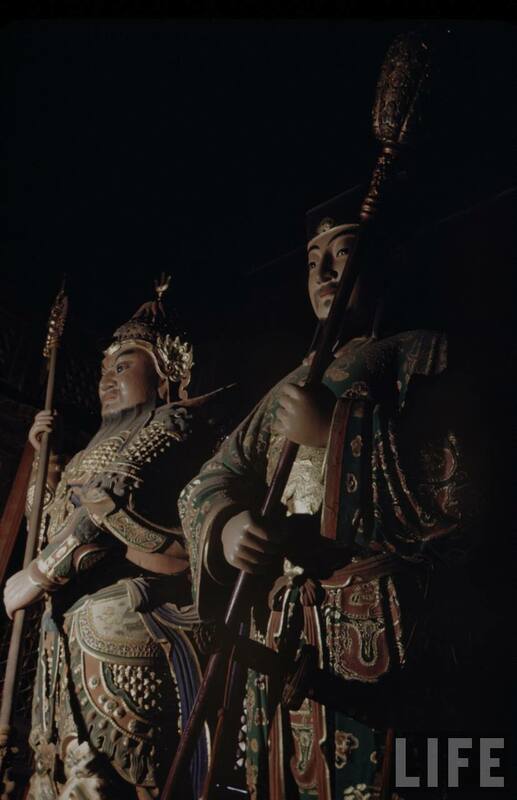 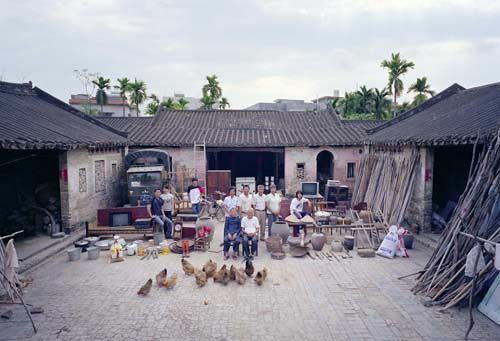 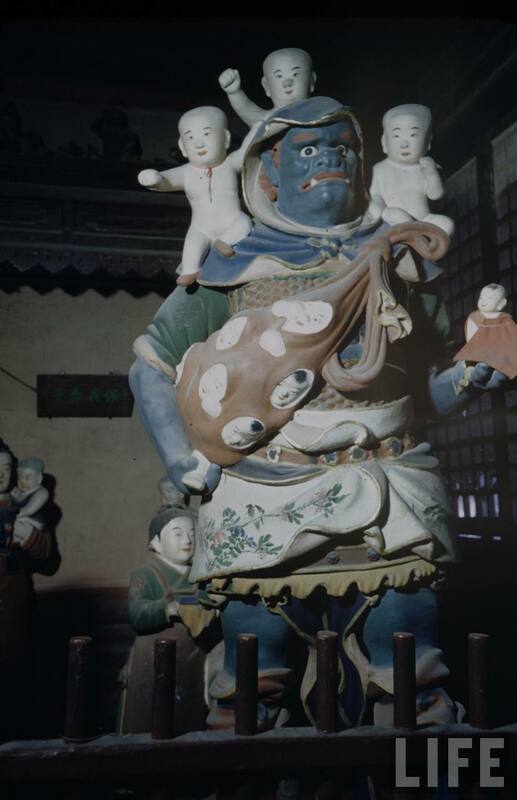 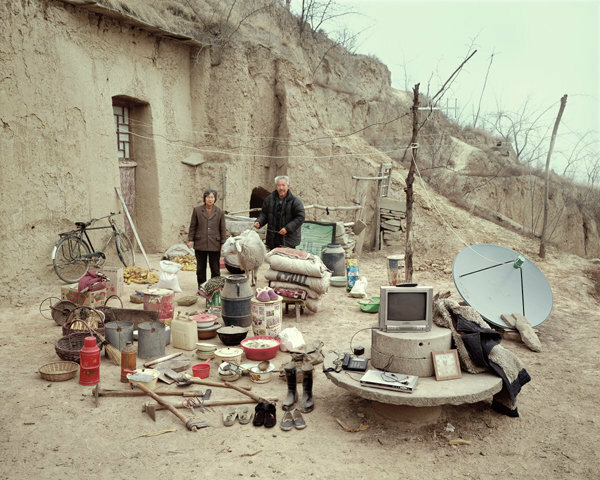 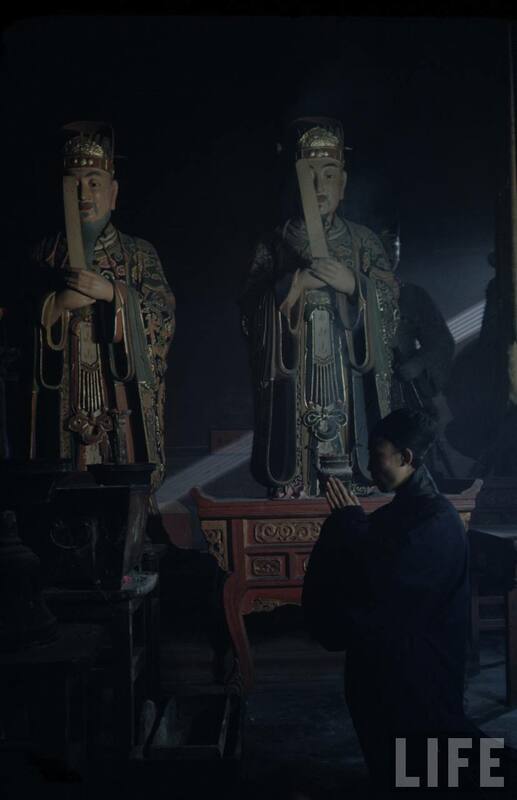 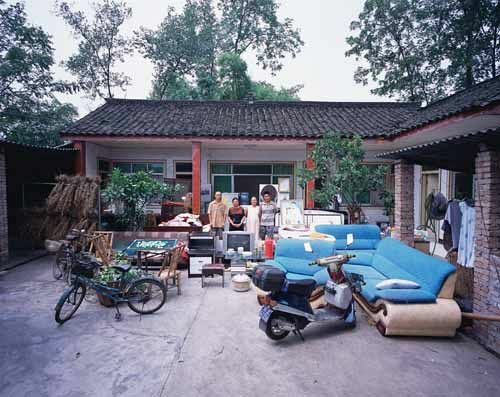 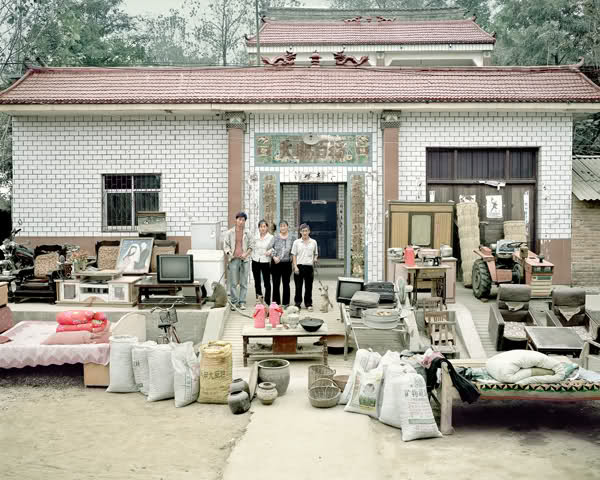 However, the two photographers stress in the accompanying text what an incredible step forward and wealth it is for the vast majority of Chinese families to possess so many objects. 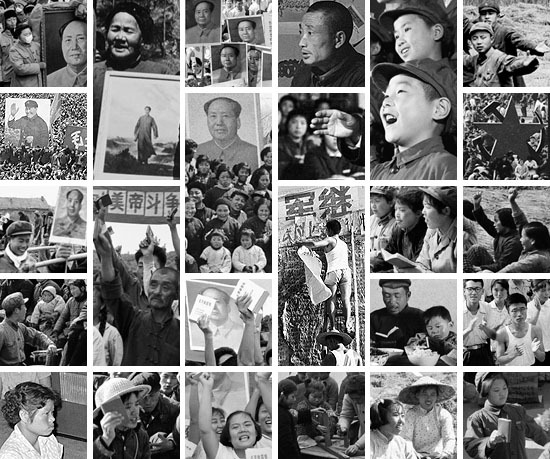 For them, they say, this exposition is a symbol of the boundless opportunities and progress brought to them by the Party after so many decades of promises. 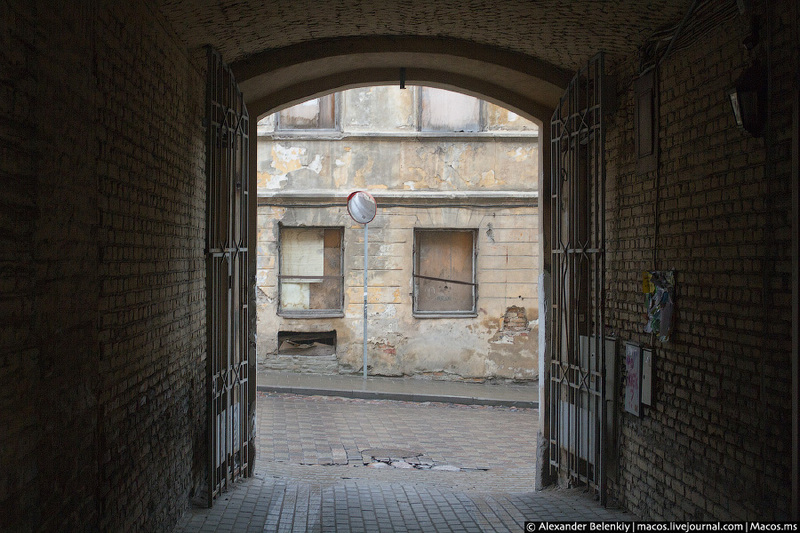 We often forget about how great differences can be between our perspectives. 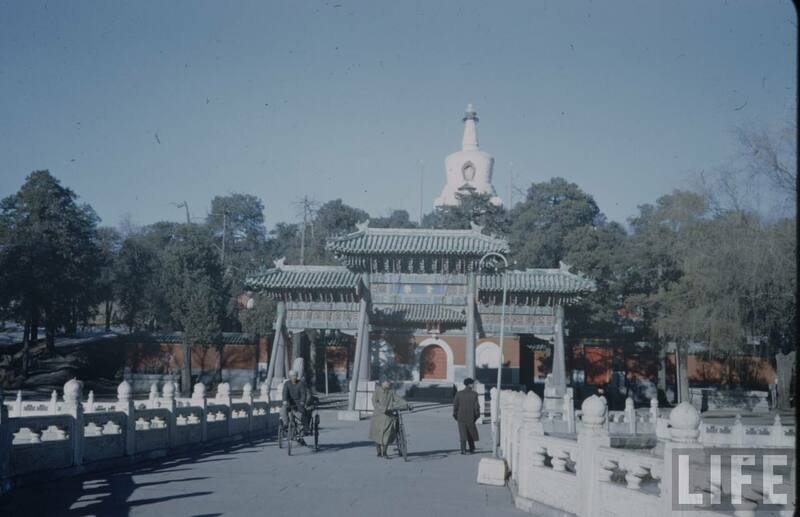 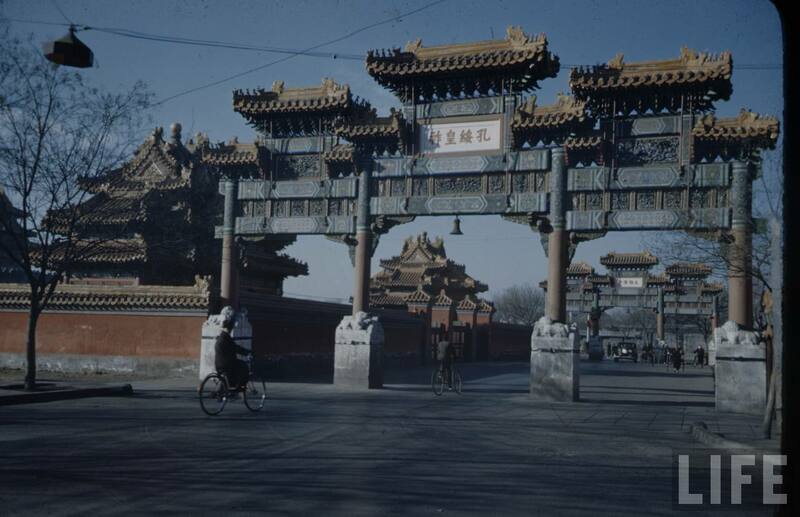 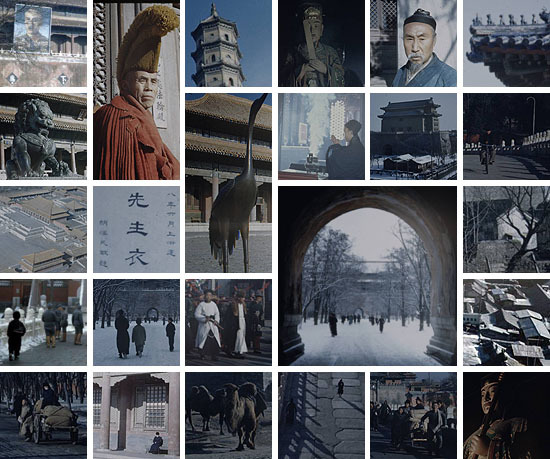 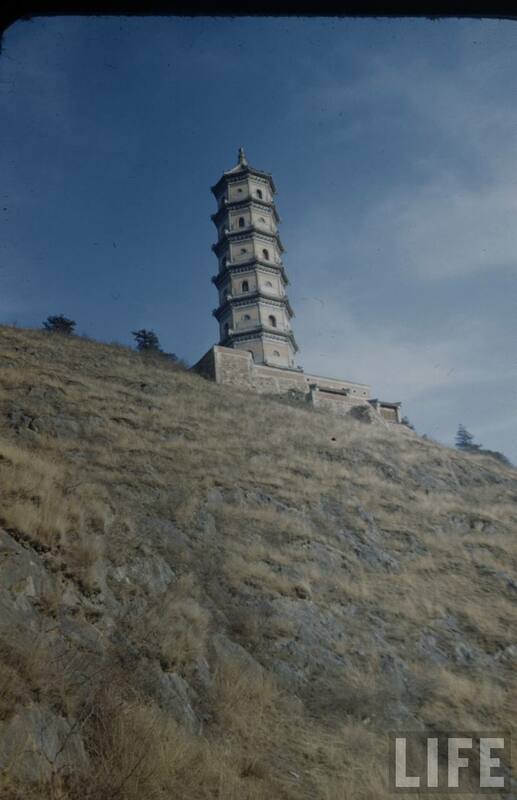 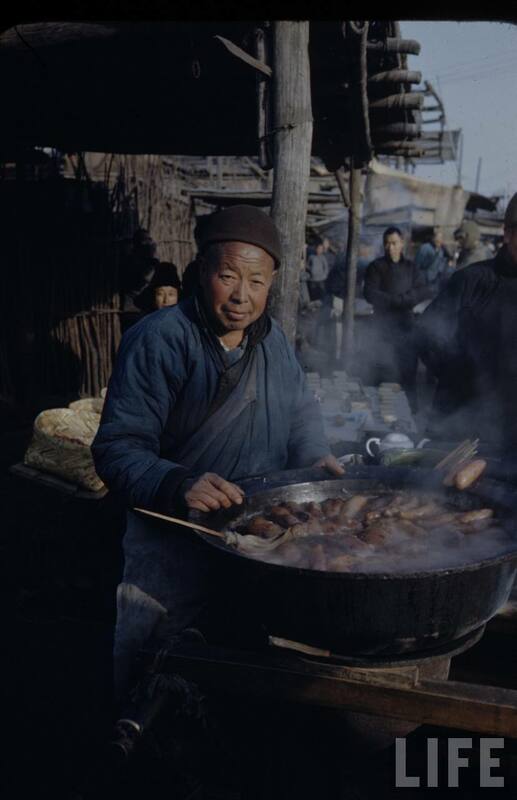 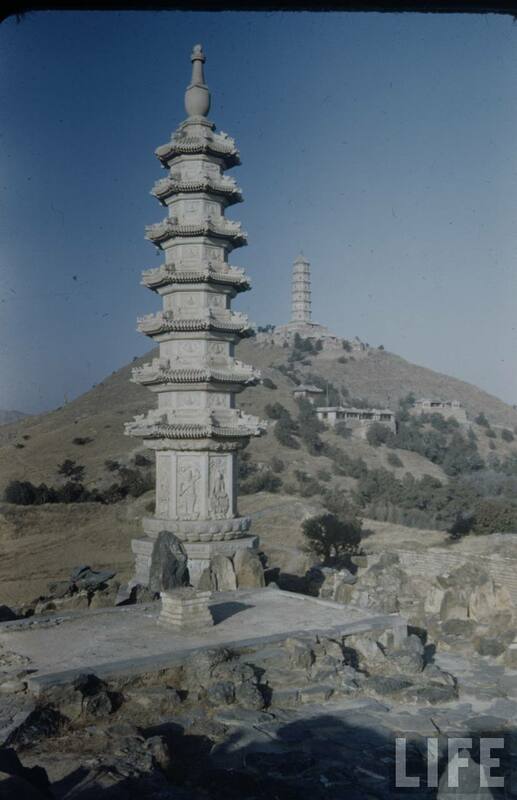 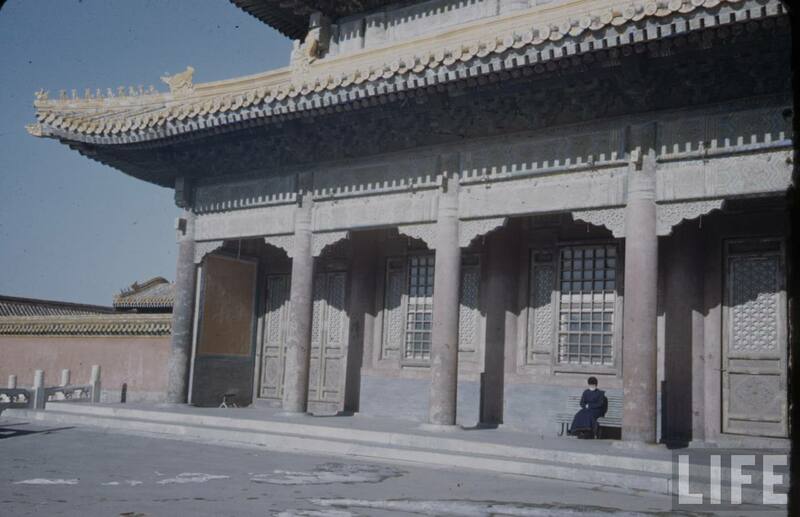 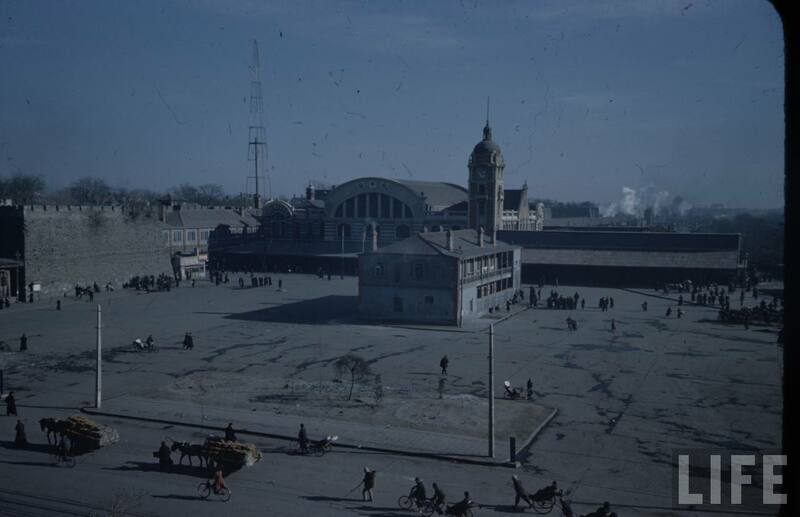 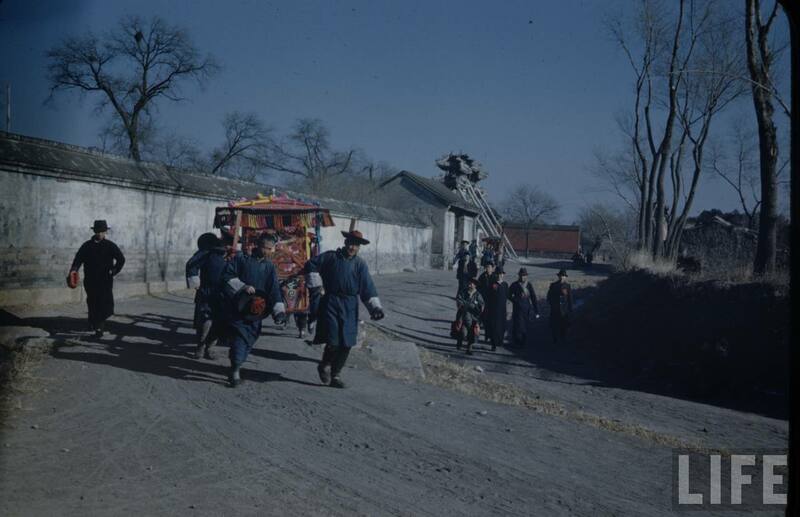 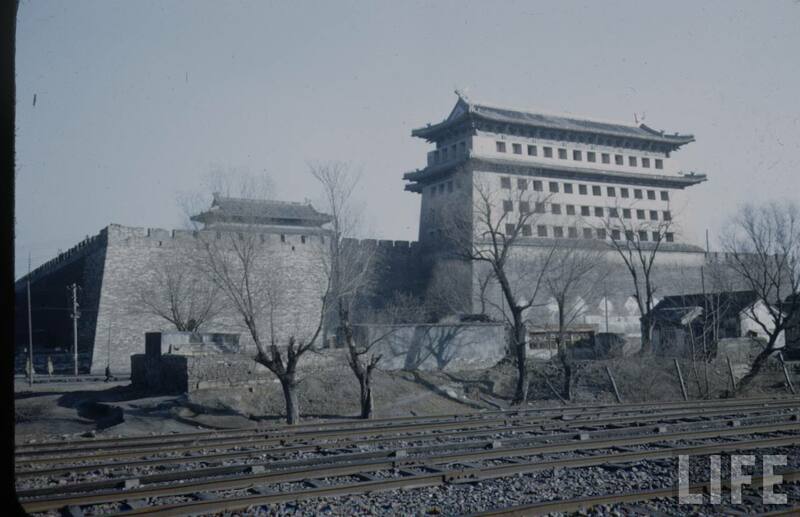 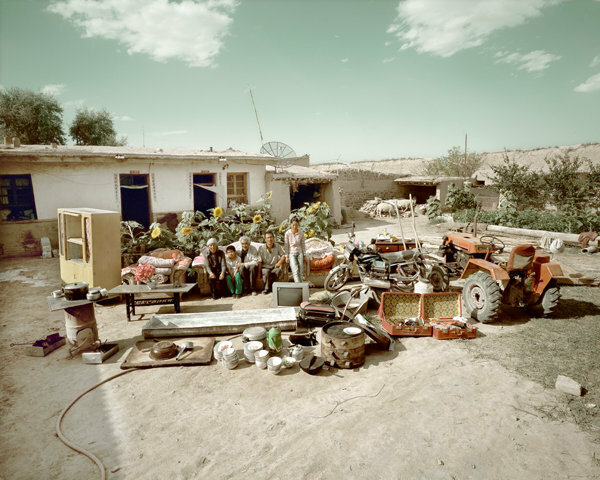 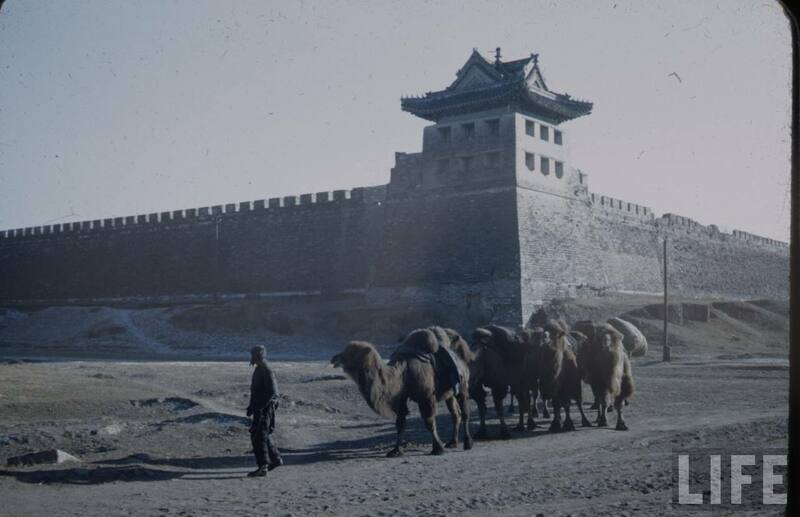 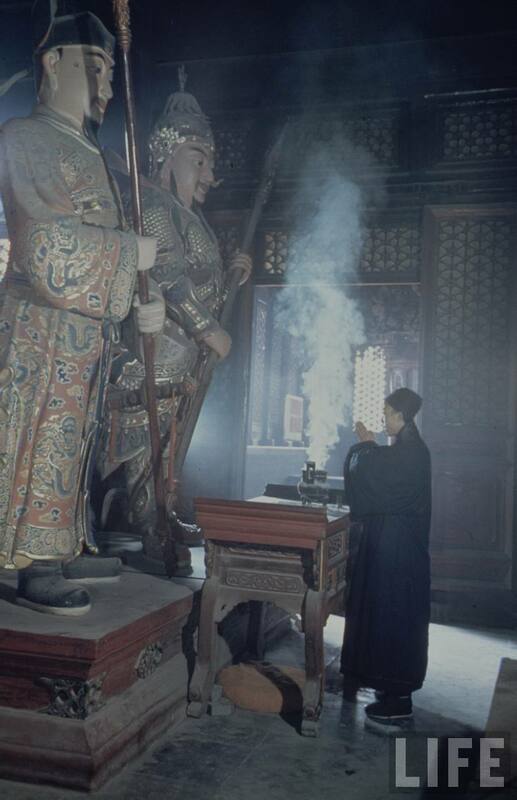 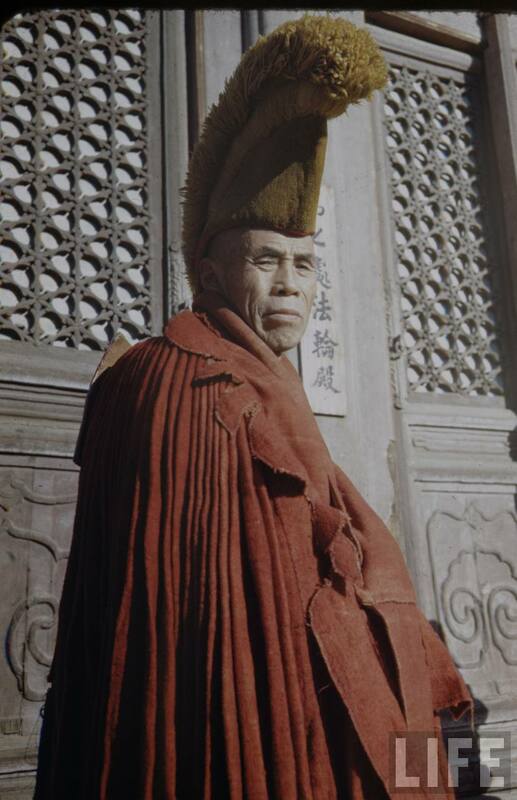 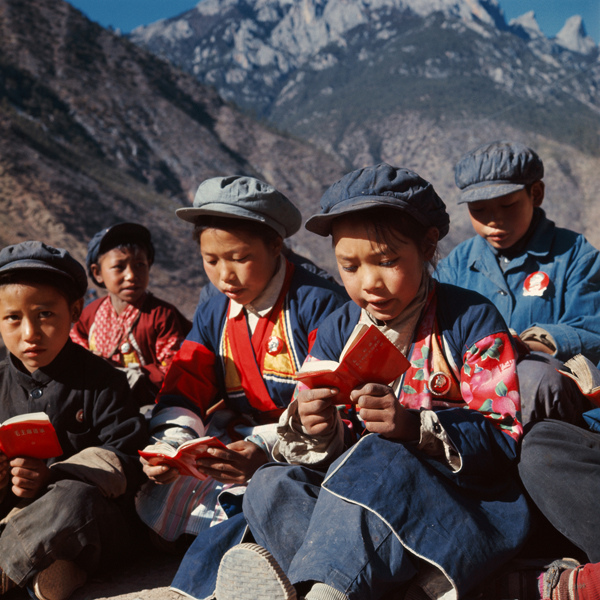 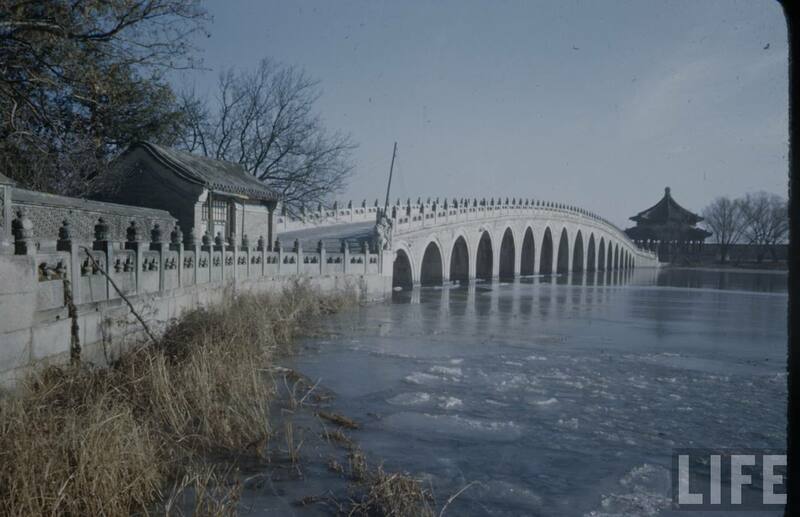 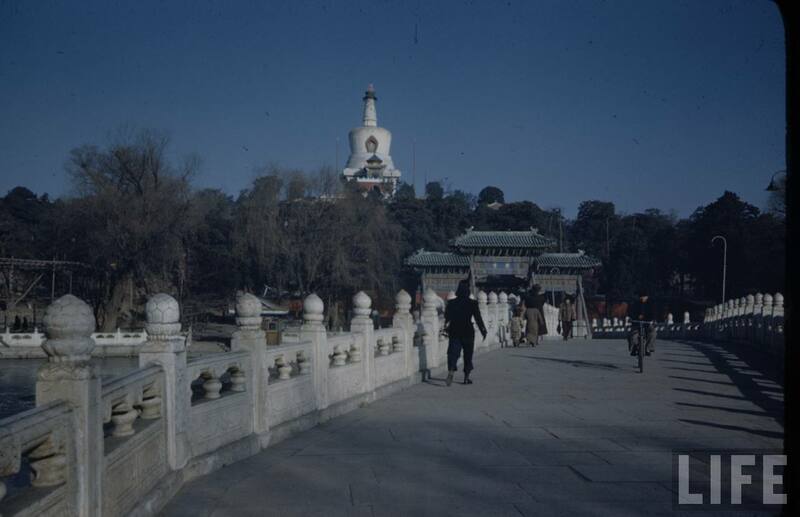 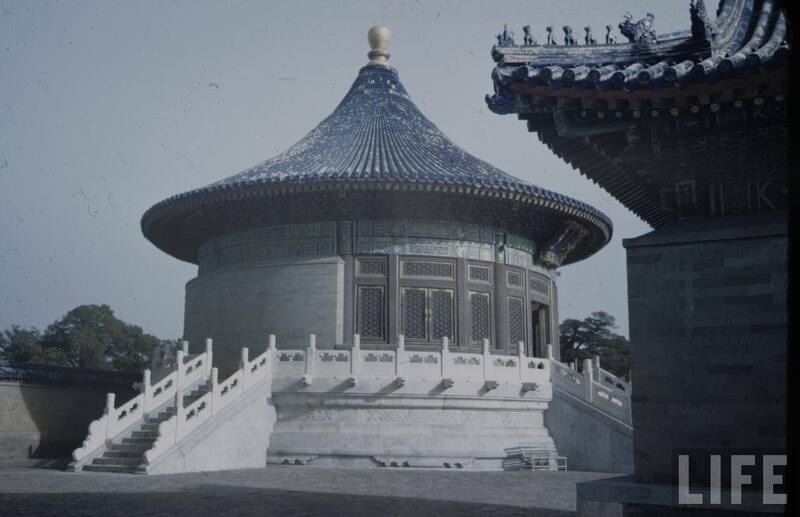 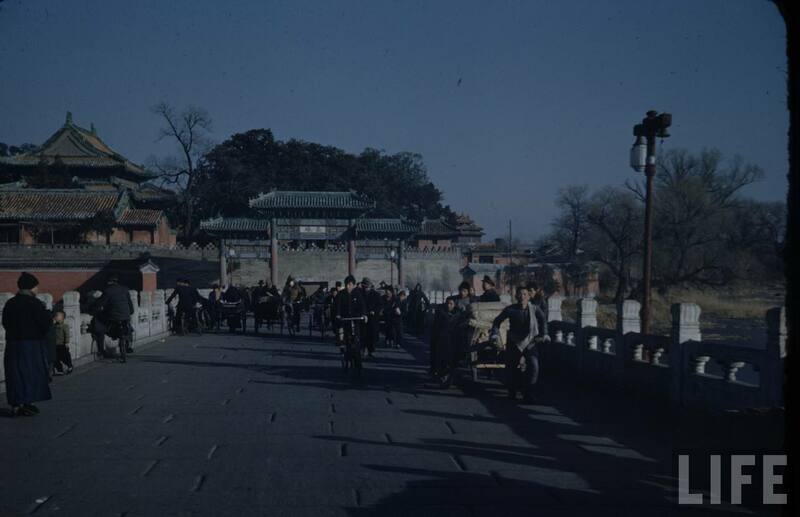 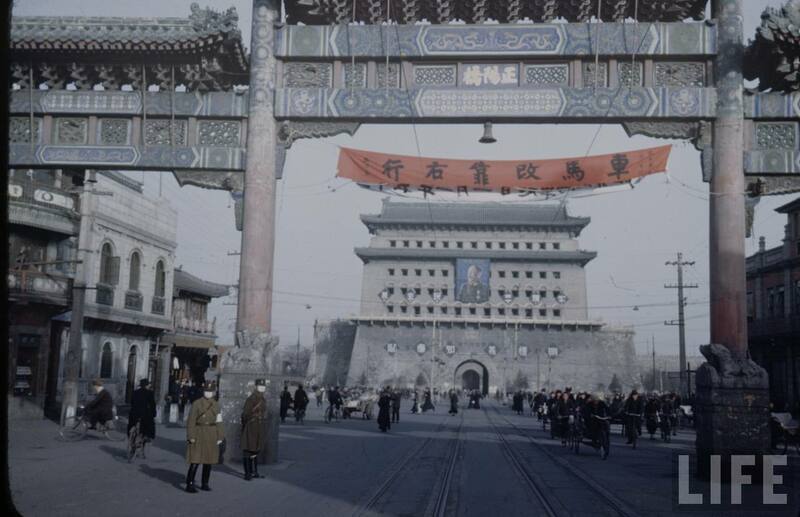 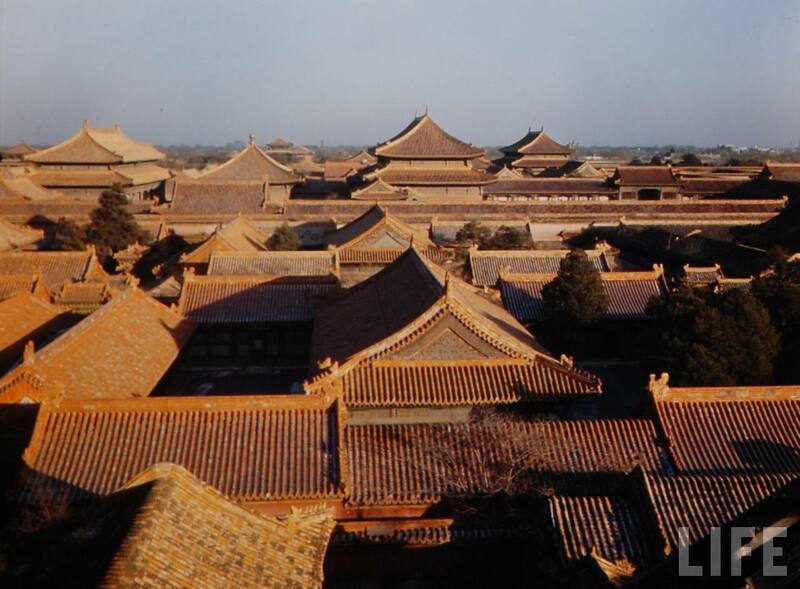 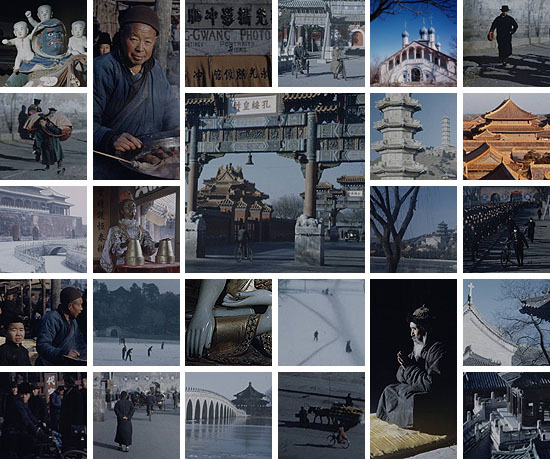 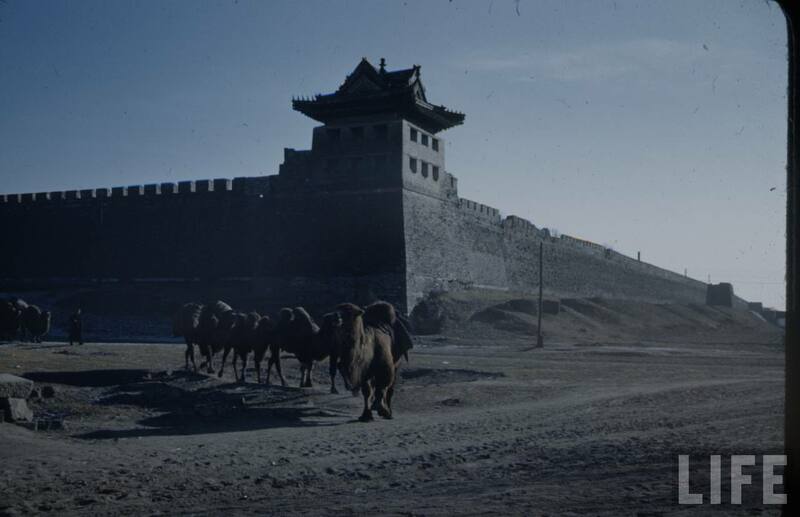 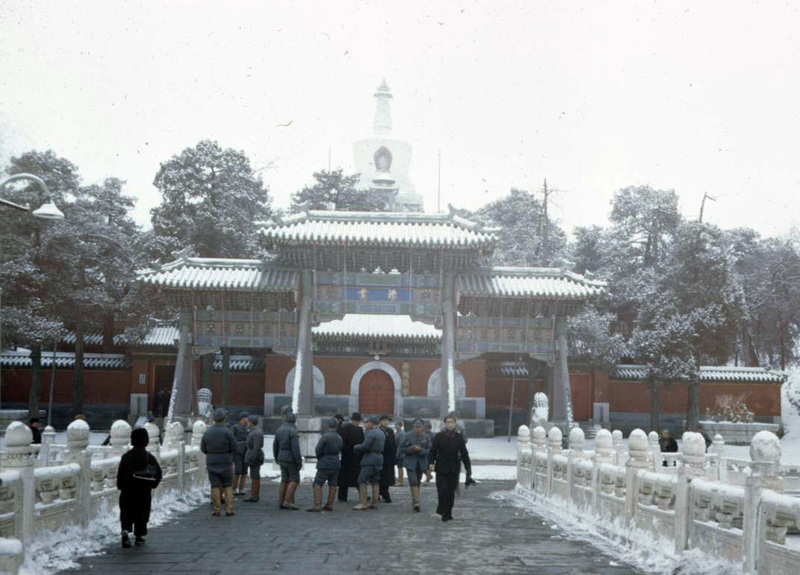 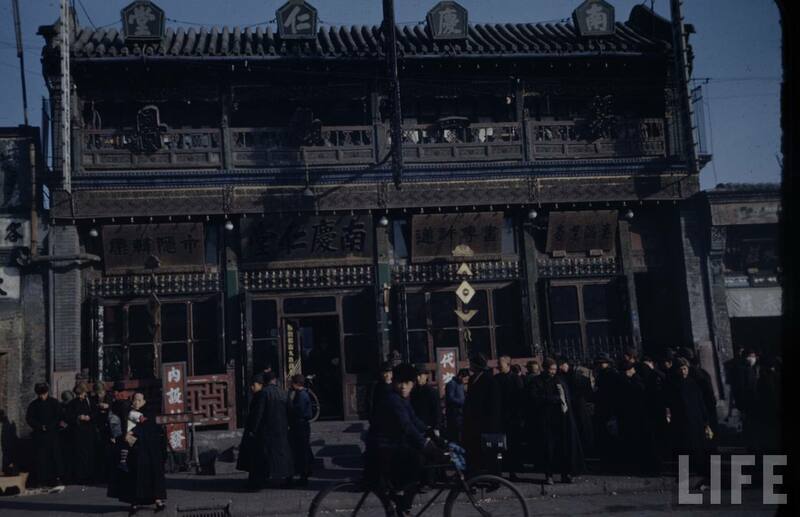 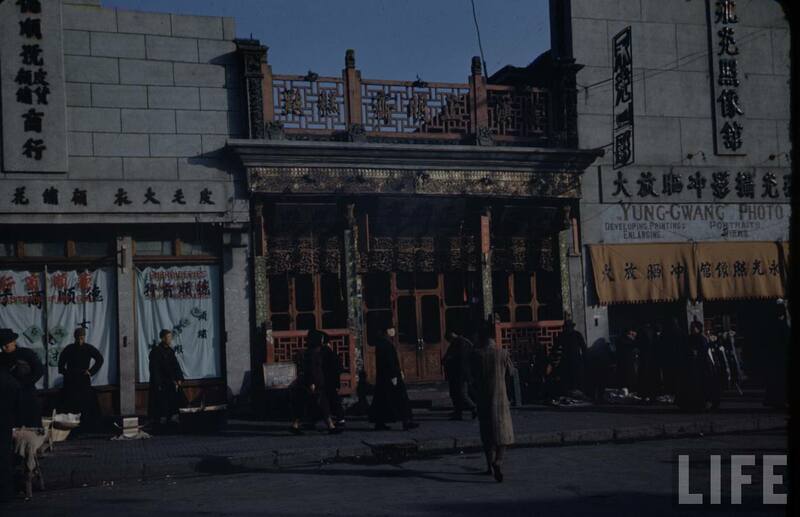 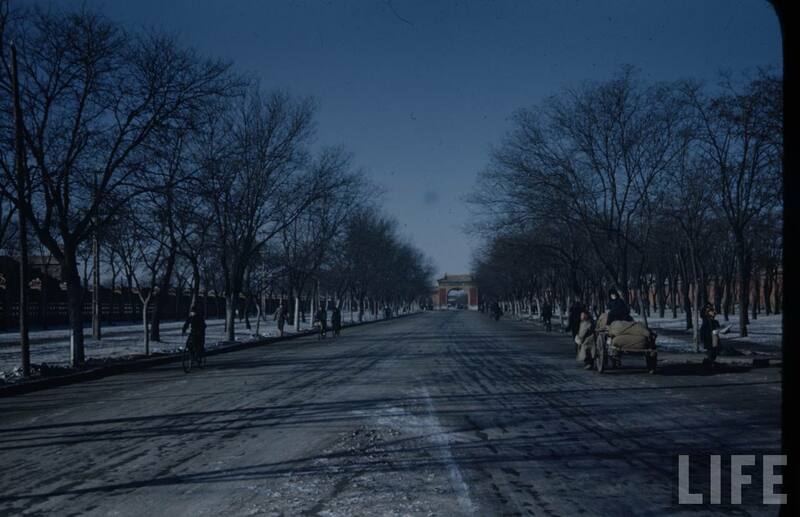 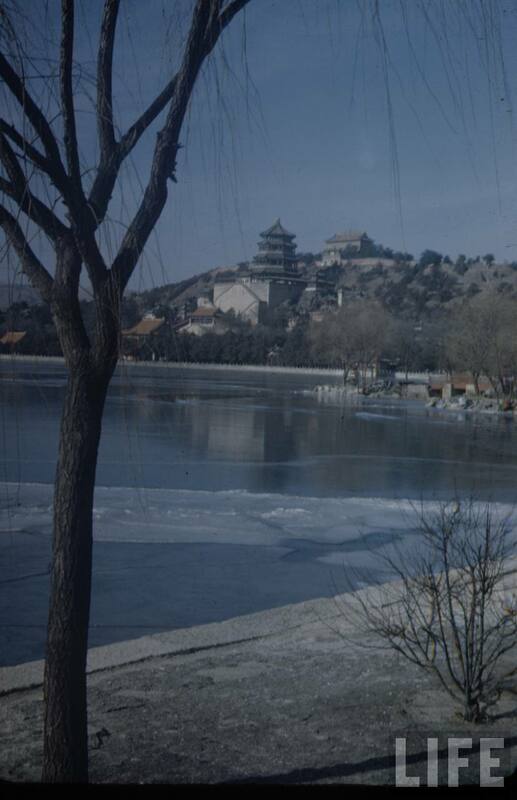 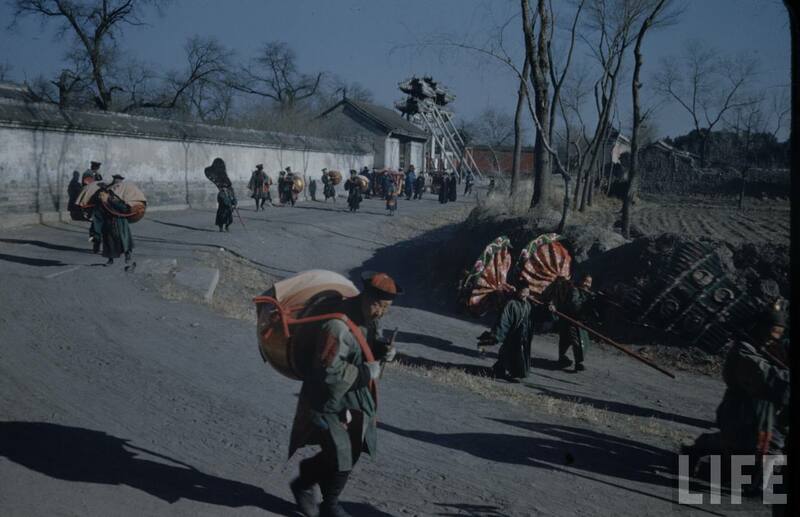 We were looking for photos to the reconstruction of the old Beijing which has been systematically destroyed since the 1950s, and this is how we found this series of several hundreds of color photos, taken by by Dmitri Kessel for LIFE in 1946. 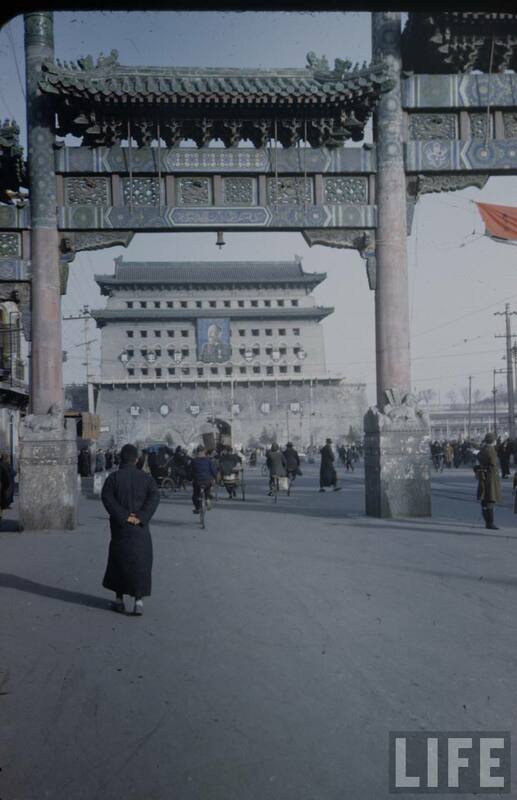 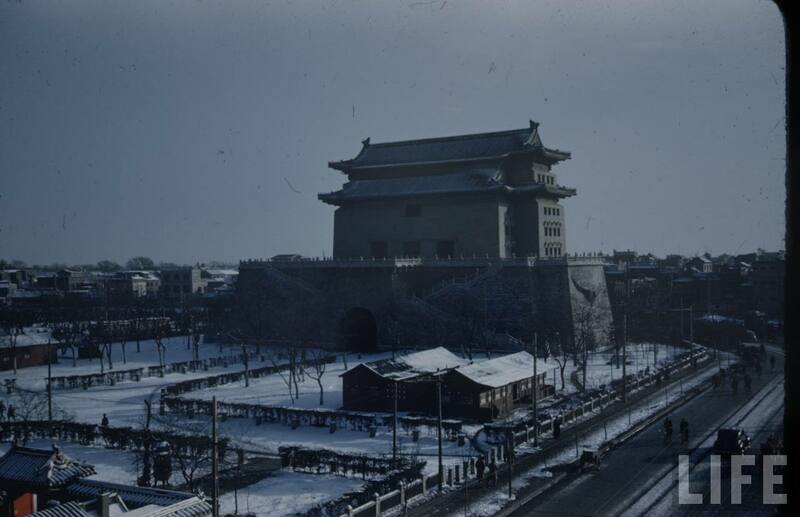 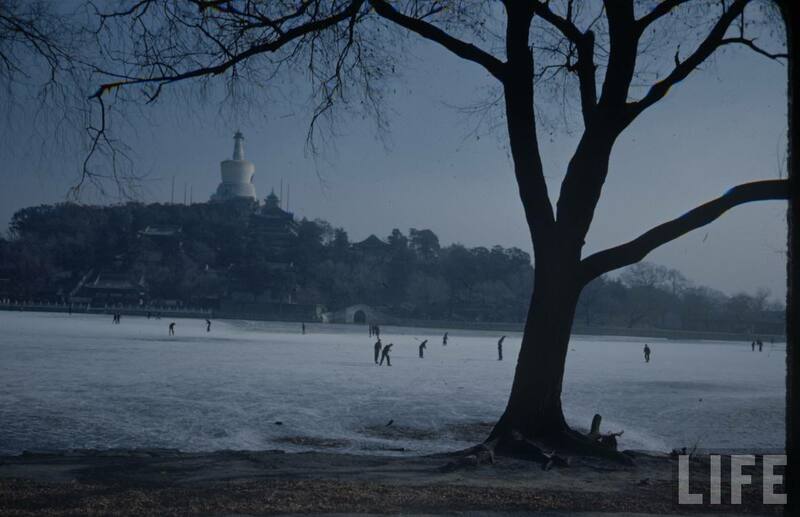 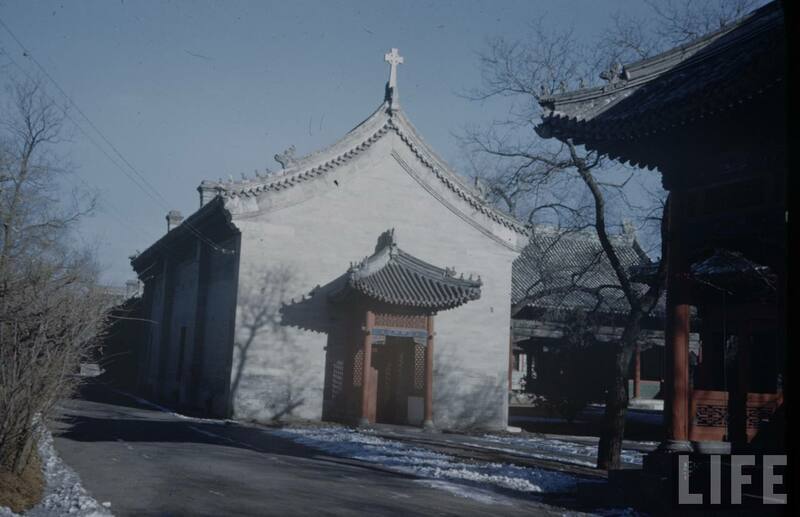 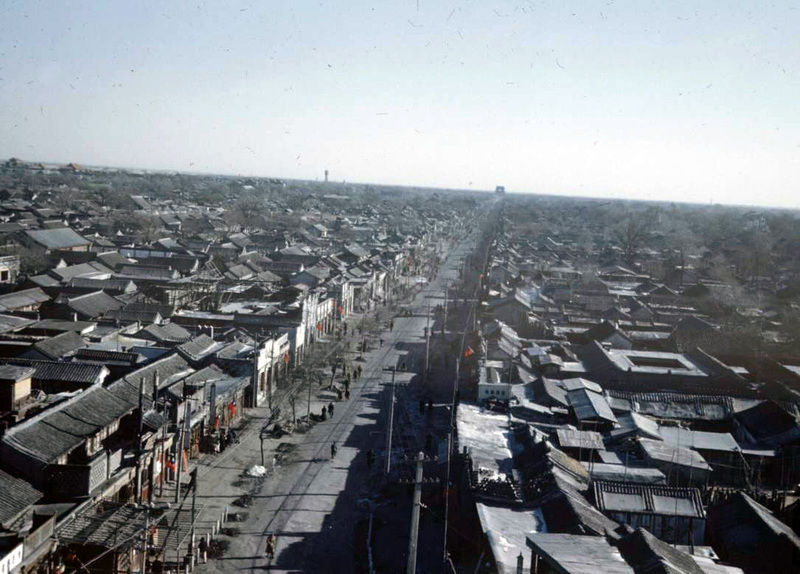 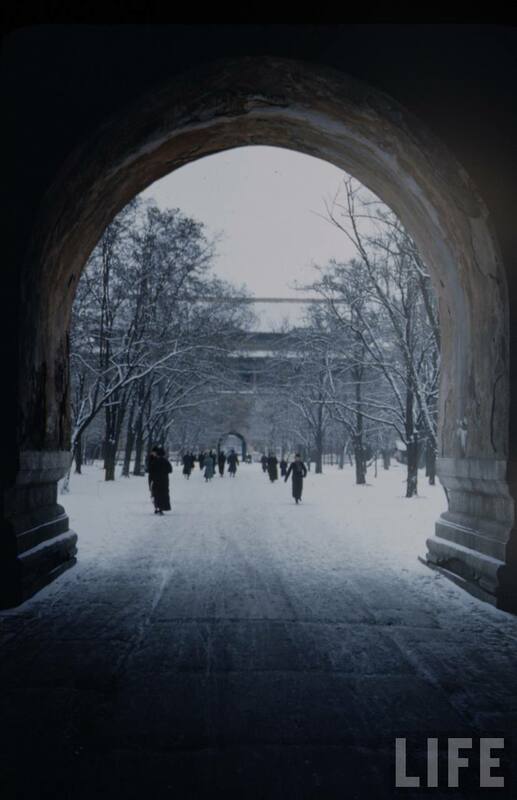 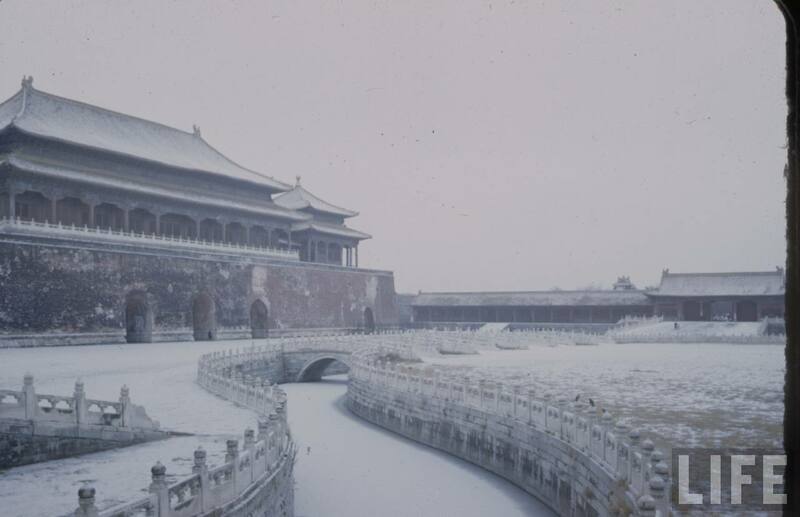 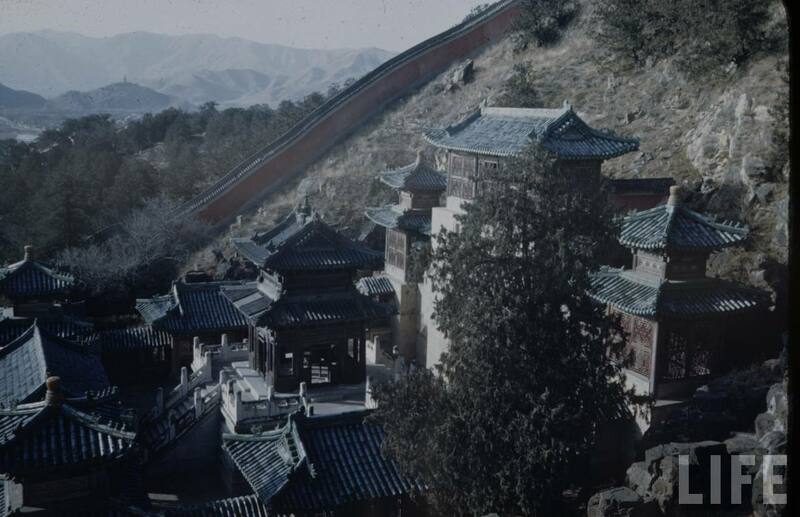 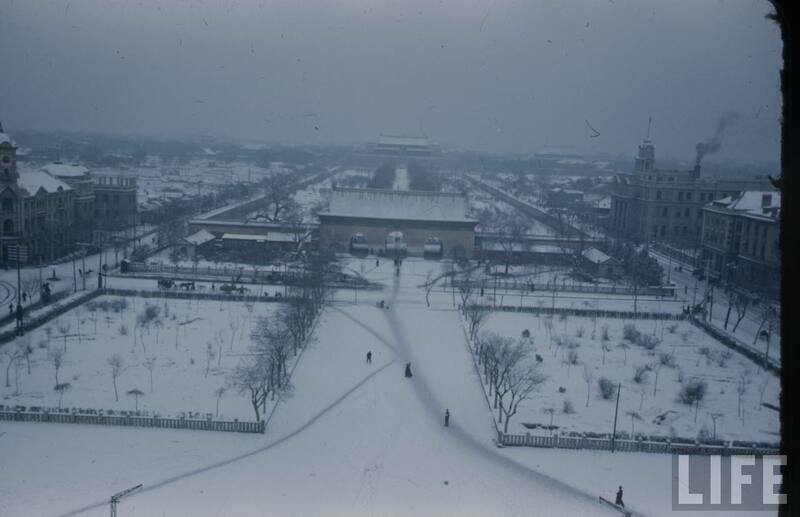 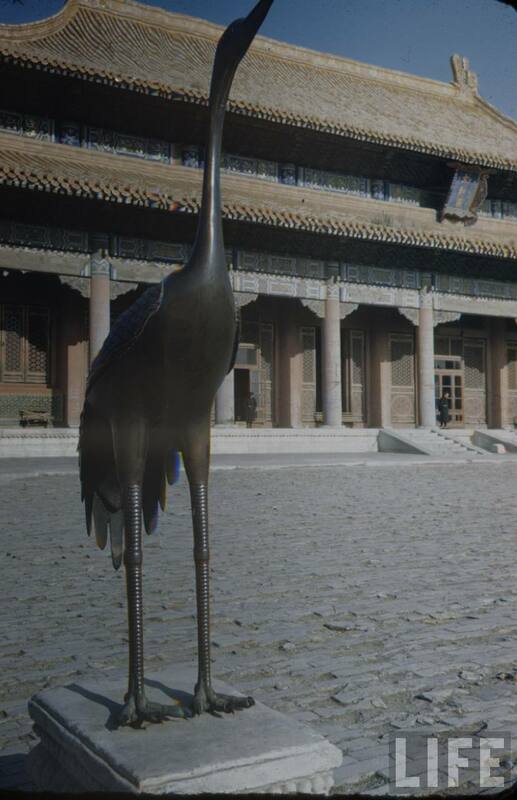 These pictures are particularly valuable, because probably it was the last moment when the old Beijing could be seen more or less as it was seen for centuries, and the first one when someone documented it in detail in photographs. 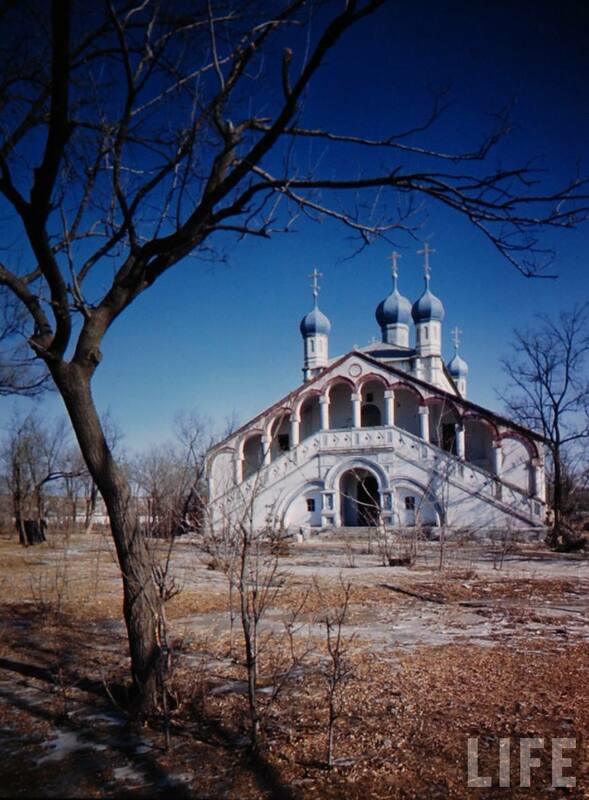 Dmitri Kessel (1902-1995) was born in the Ukraine, in a Jewish landowner’s family. 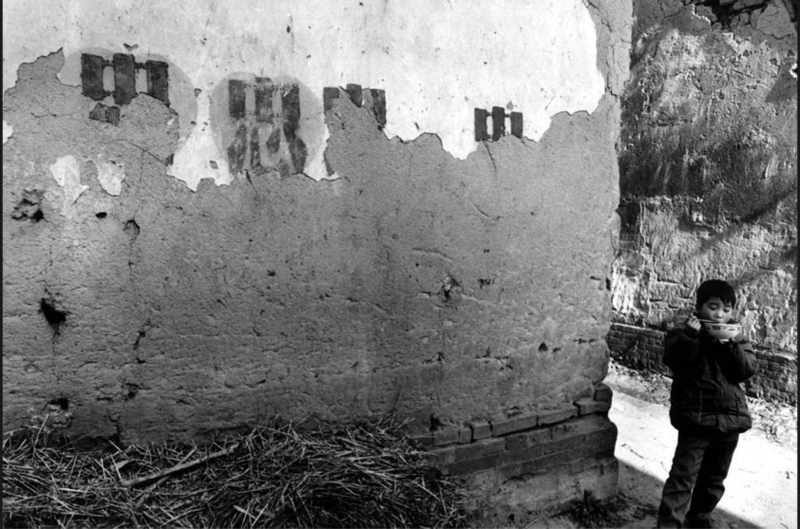 He received his first camera when he was 14 years old: according to his autobiography, this was broken over his head by a Bolshevik soldier when the property of the family was confiscated. 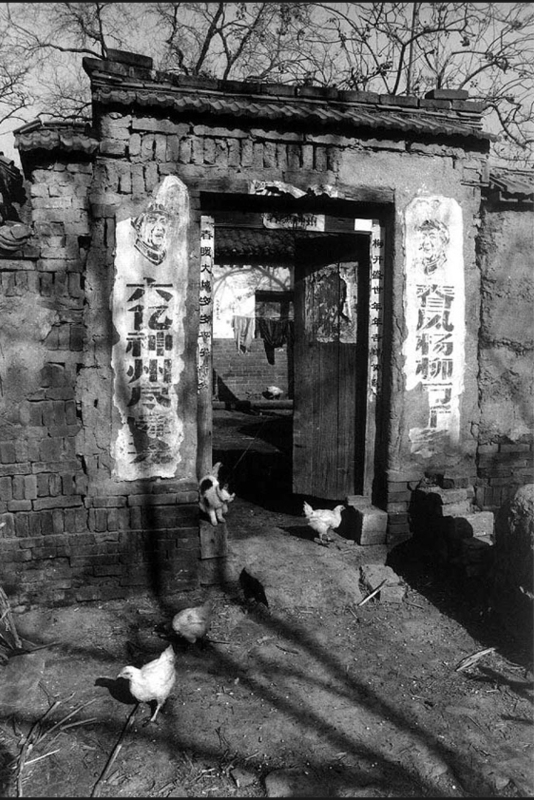 In 1923 he fled to America where, after ten years spent with various casual jobs, in 1934 he enrolled on a course in the school of photography. 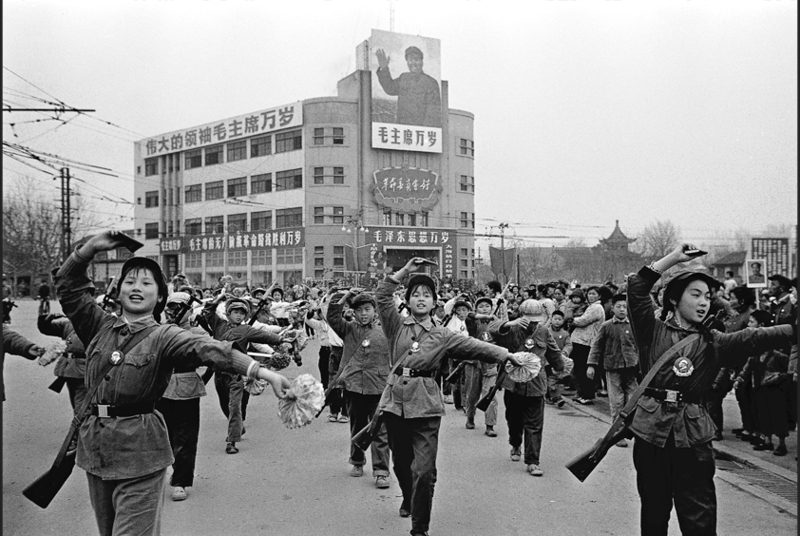 It was a fortunate moment for a beginner: the coming of the new miniature 35mm Leica camera, which enabled photographers to work quickly and unobtrusively in the most difficult situations, contributed to the emergence of the great American picture magazines Life and Fortune, which provided a perfect platform for the first great generation of young photojournalists. 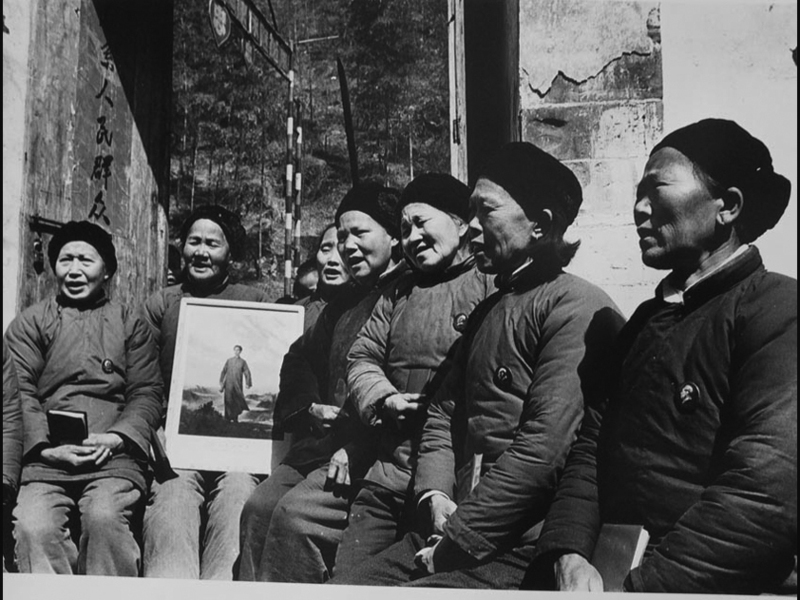 Kessel photographed for sixty years all over the world almost exclusively for Life, of which he was also a war correspondent during WWII. 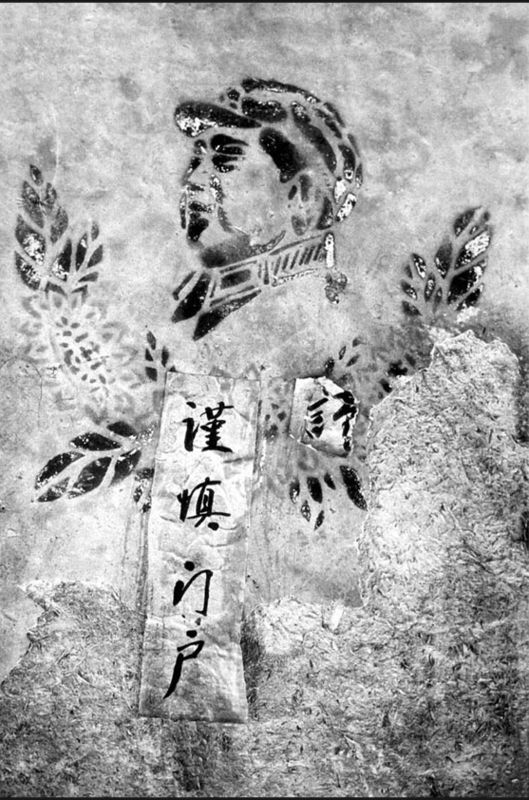 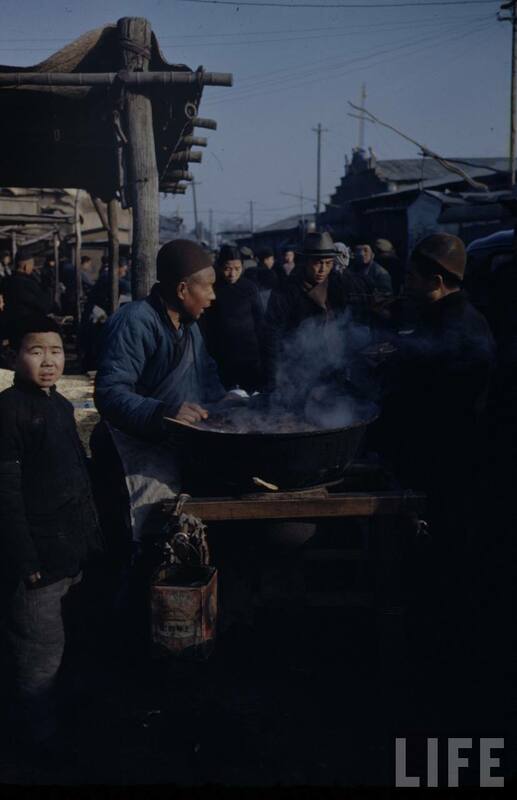 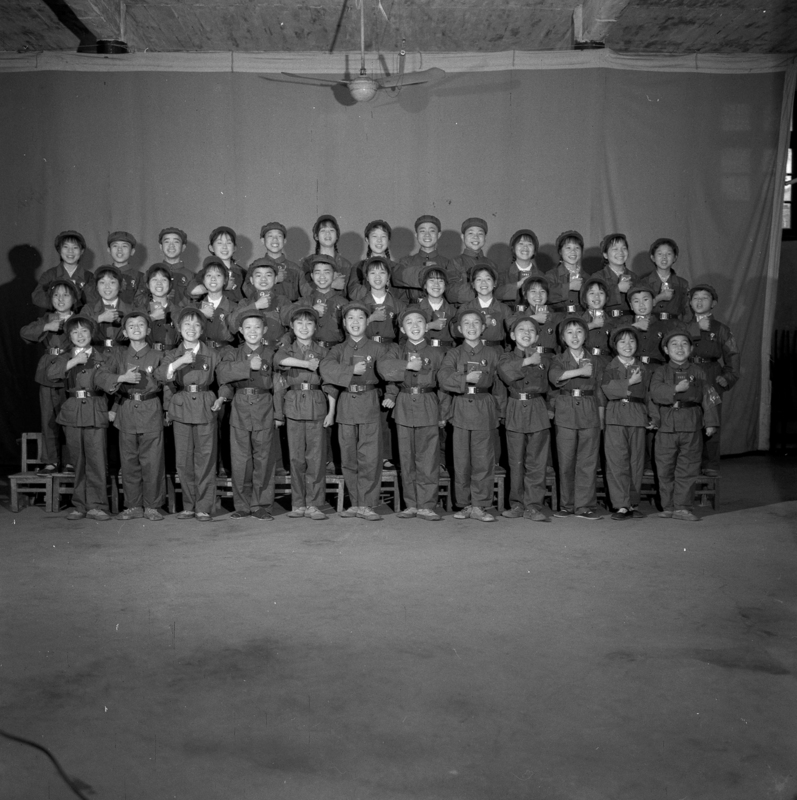 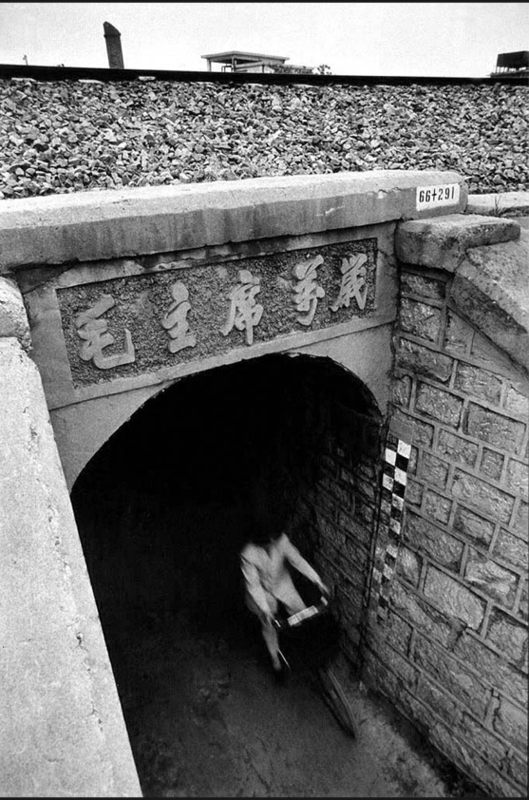 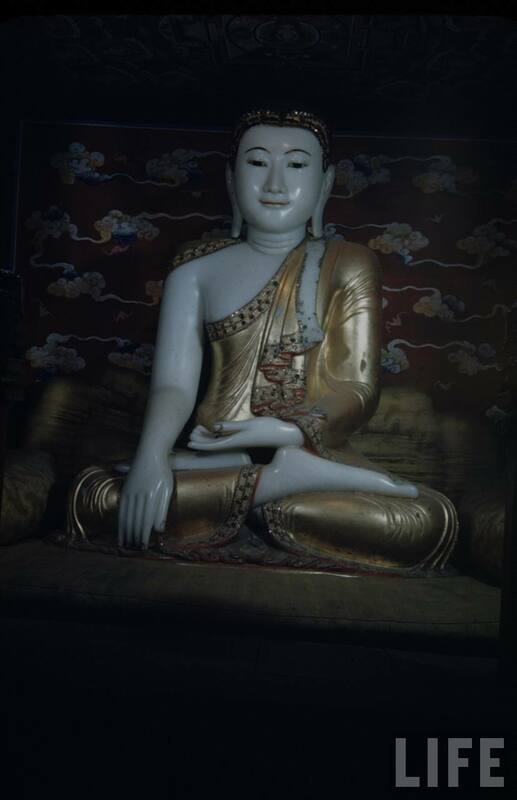 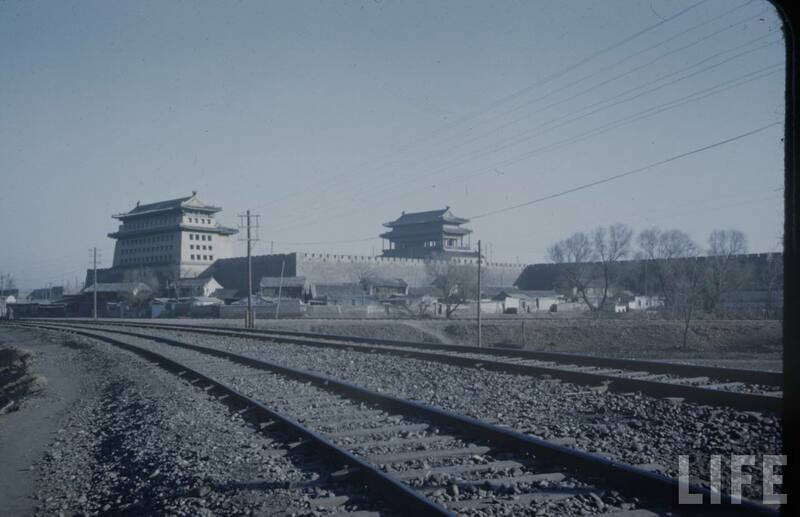 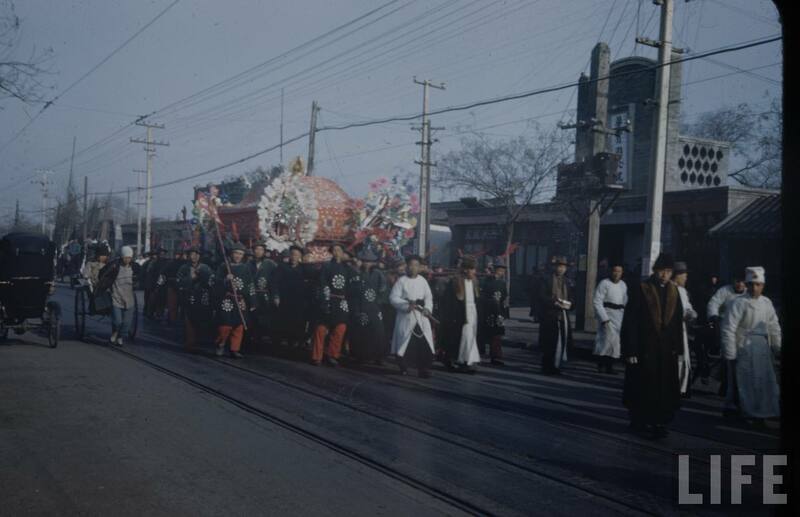 A few pieces of this Beijing series were published in the 29 April 1946 edition of Life, but most of them first became available in the Google-Life photo database. 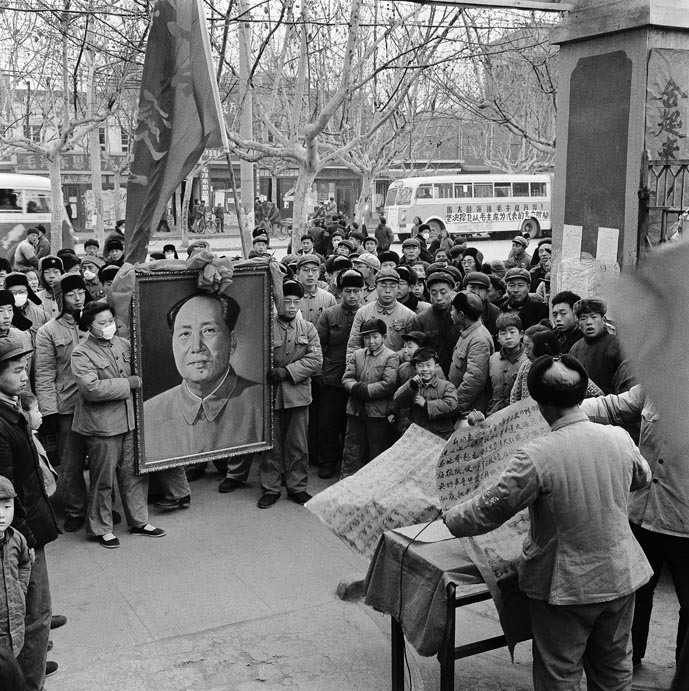 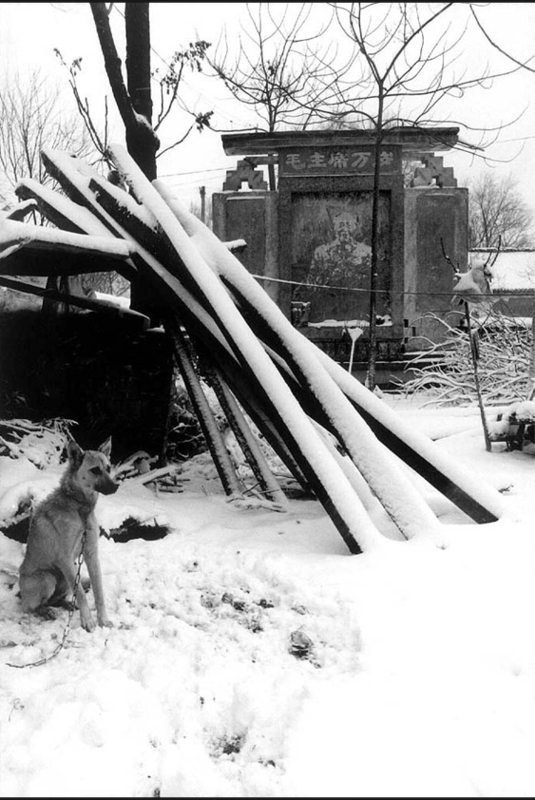 In these images we still see the single-story hutong city, with few passers, almost without a vehicle; the Forbidden City is already a museum, but every since then demolished city walls and gates are still standing; on the facade of the imperial palace there is hanging Chiang Kai-shek’s portrait instead of Mao’s; and the most recent structure we see is the late 19th-century railway station and the train tracks at the foot of the old city walls. 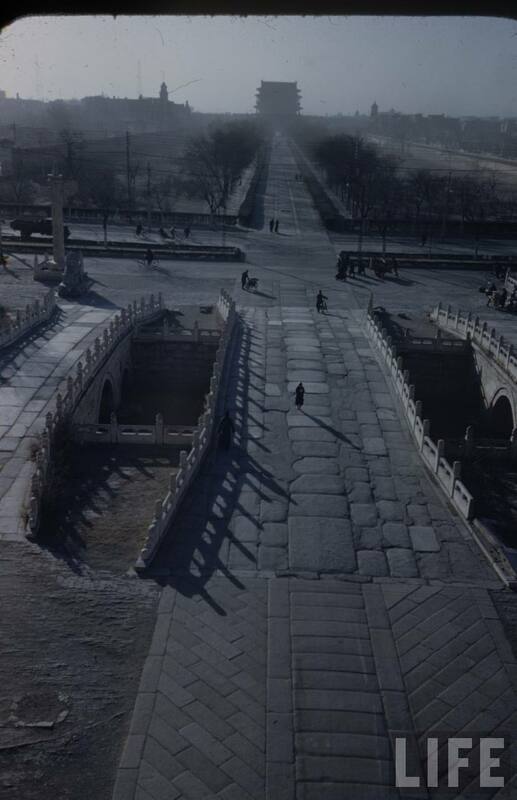 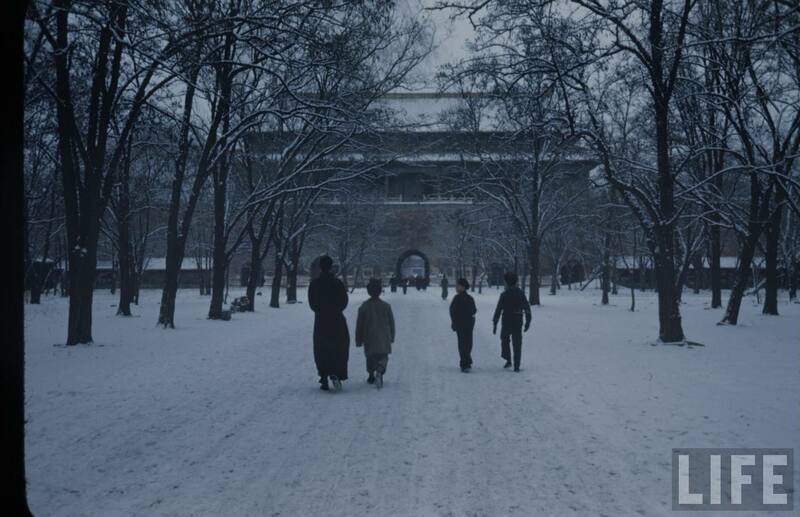 As if we were walking in the scenery of a wuxia movie: with the difference that here everything is still real. 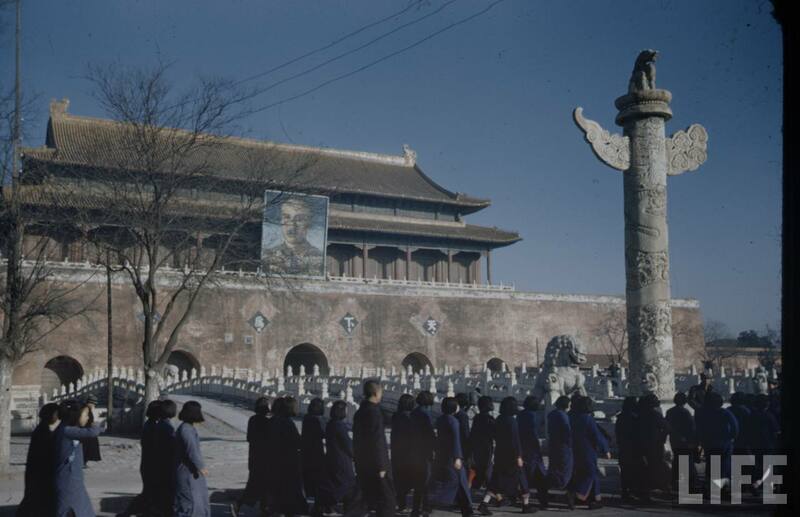 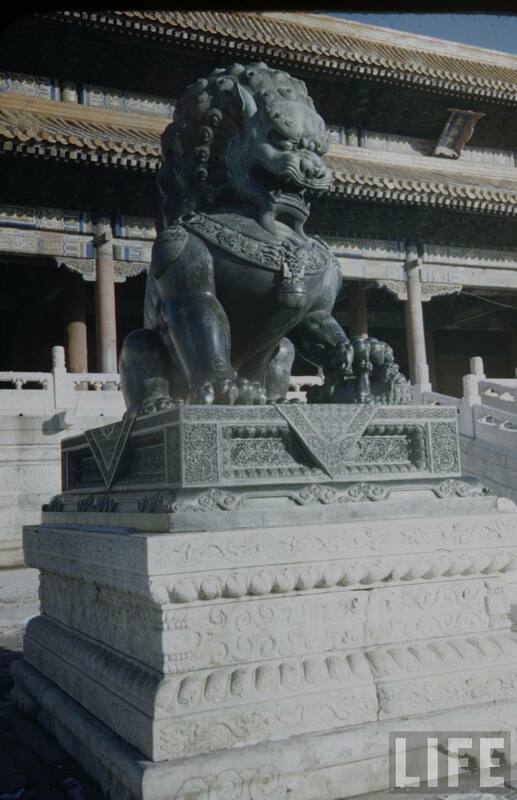 The photos were mainly taken on the Tian’anmen and in the Forbidden City, in the imperial park of the North Lake and at the Heavenly Temple, and whoever has been to Beijing will easily recognize most of them. 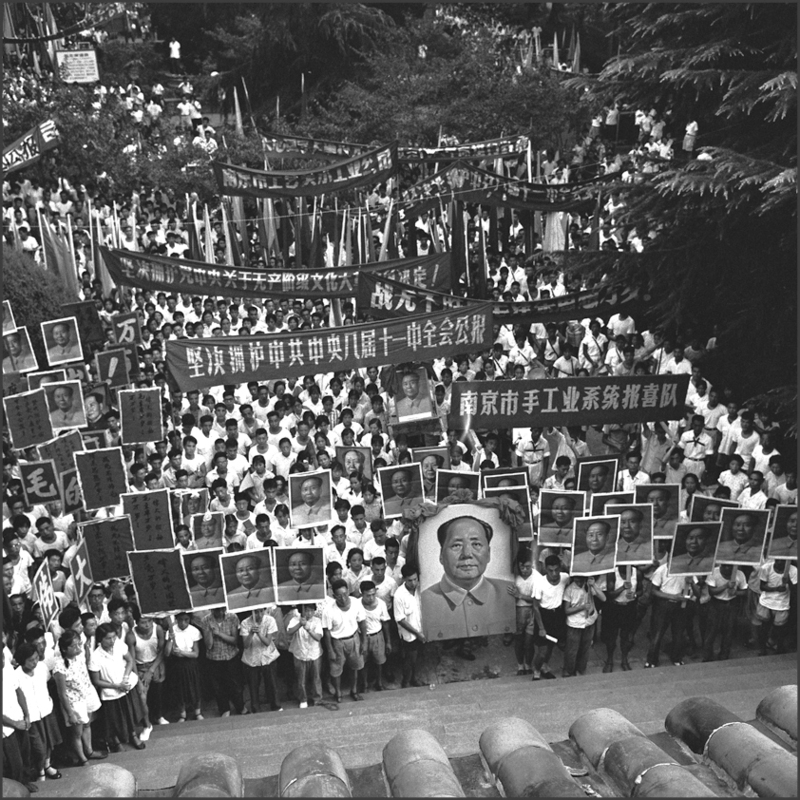 Nevertheless, because the great changes the theme and location of many photos are difficult to define: on this are now working the readers of the Chinese tieku.org forum. 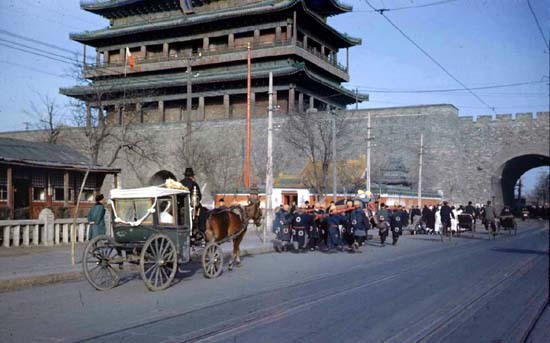 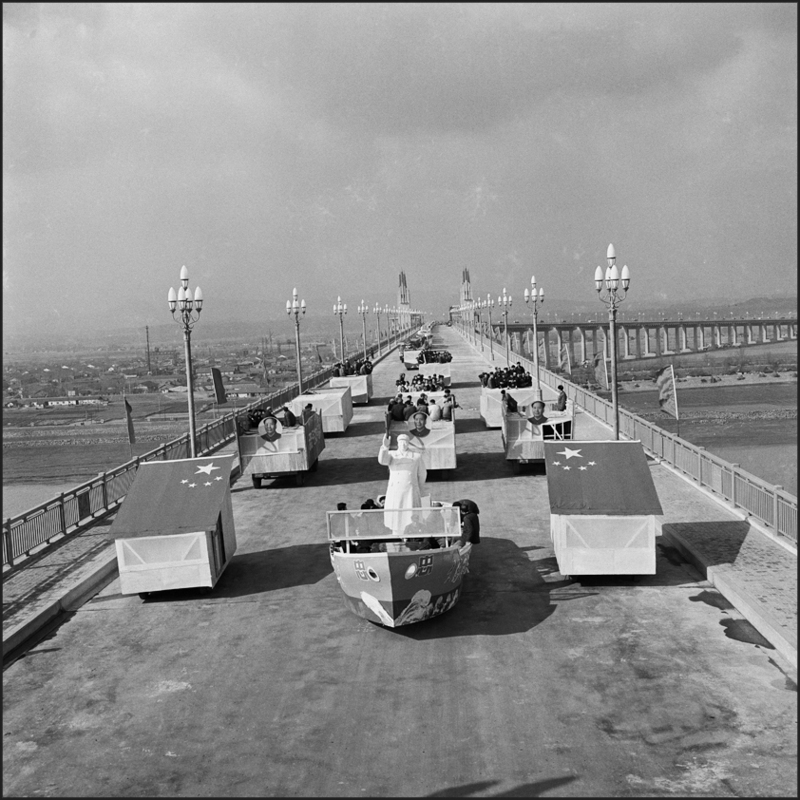 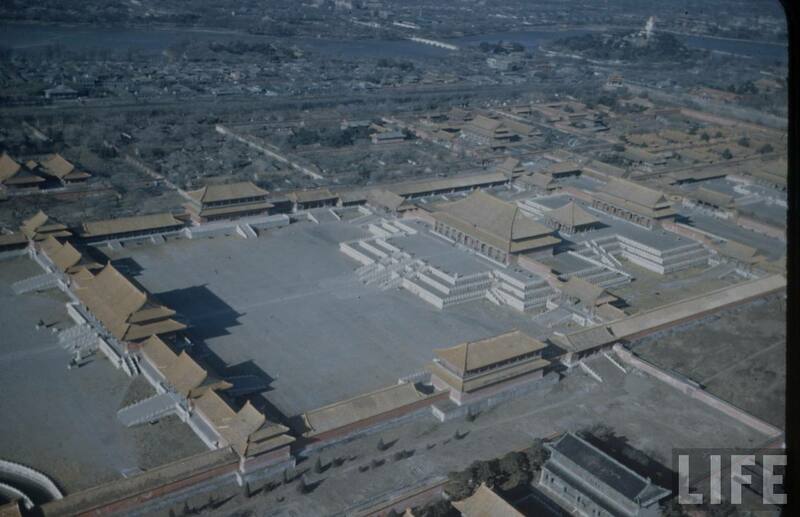 We will also use their definitions to the reconstruction of old Beijing, where we will link these and several other vintage photos to the map of the old city. 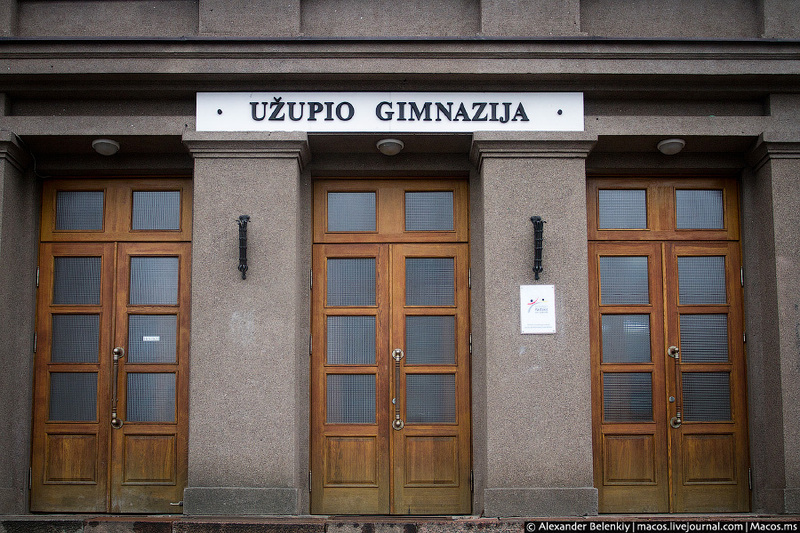 No, not that of Transdnistria, but a much smaller and certainly much more cheerful one. 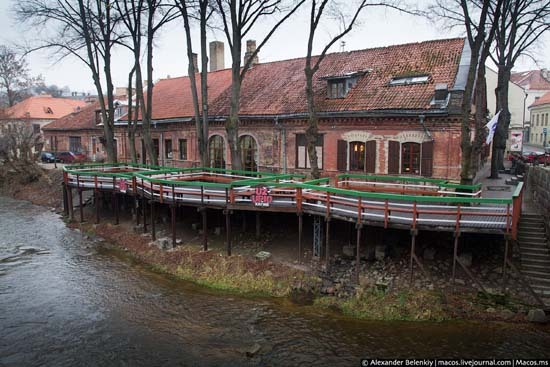 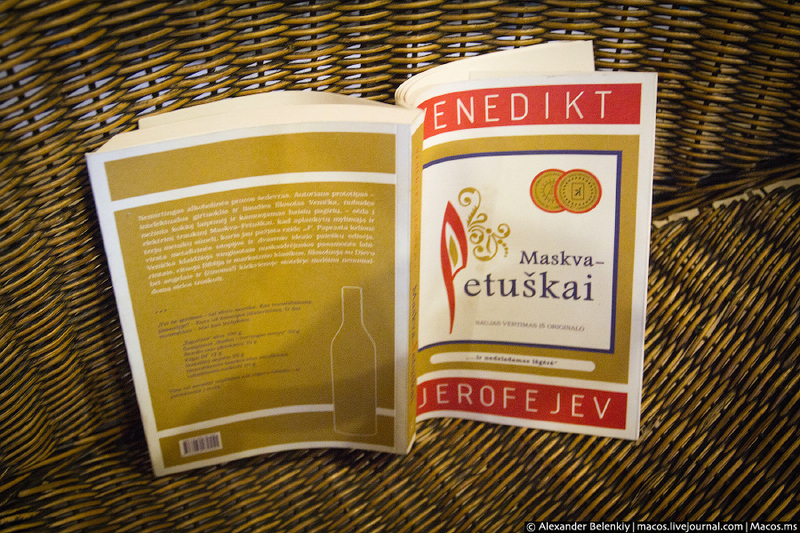 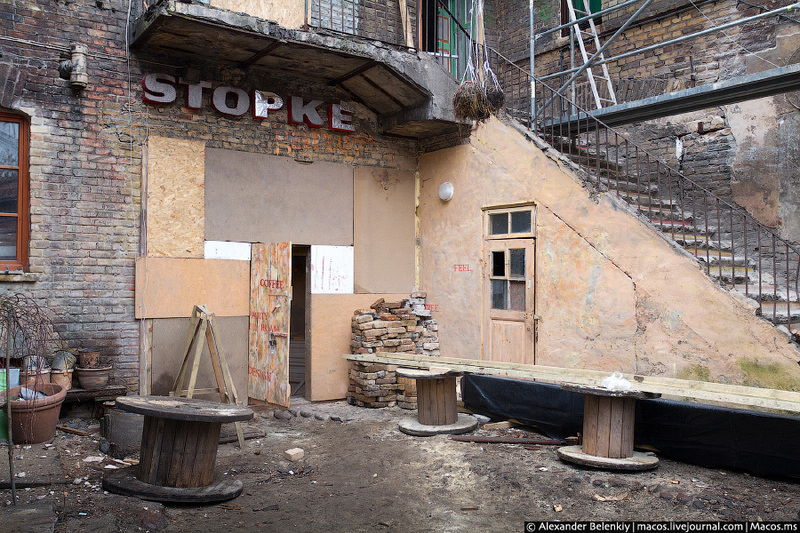 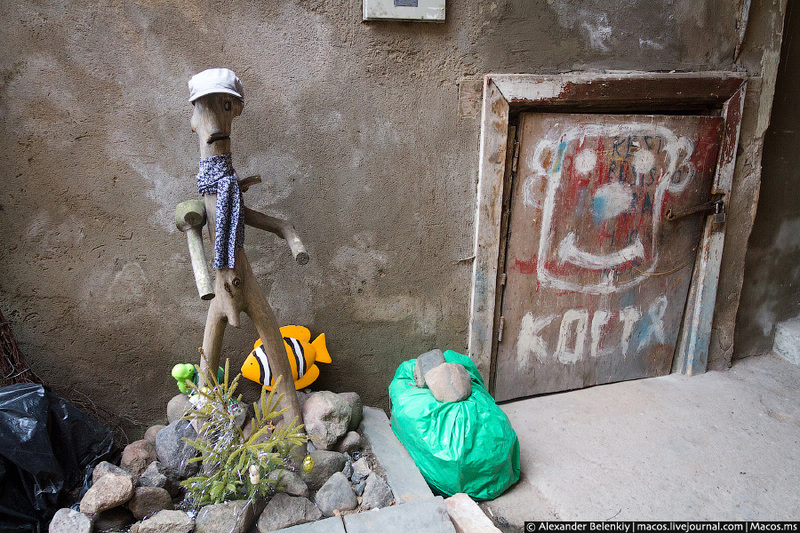 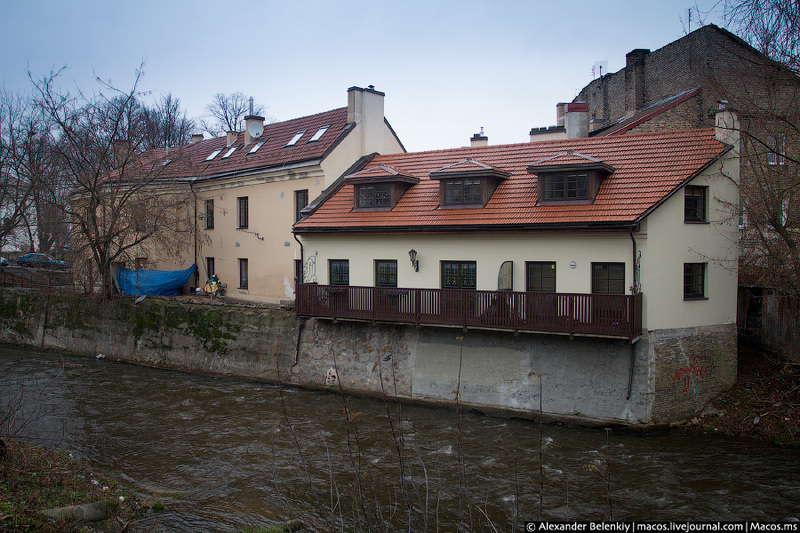 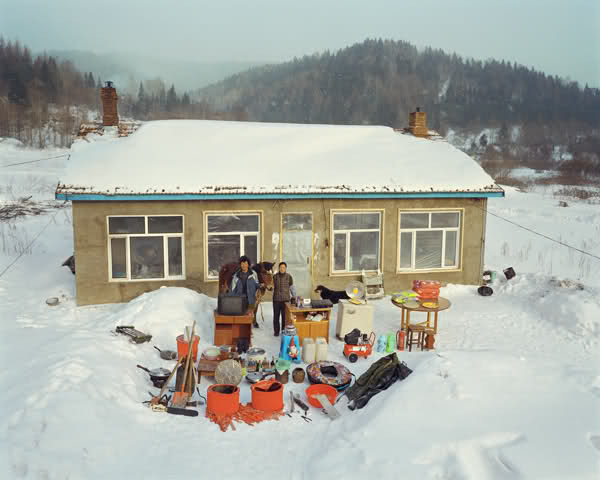 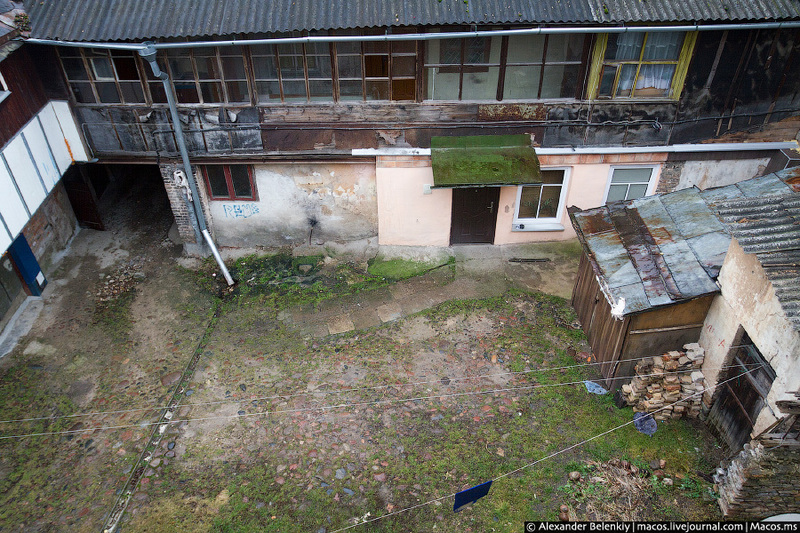 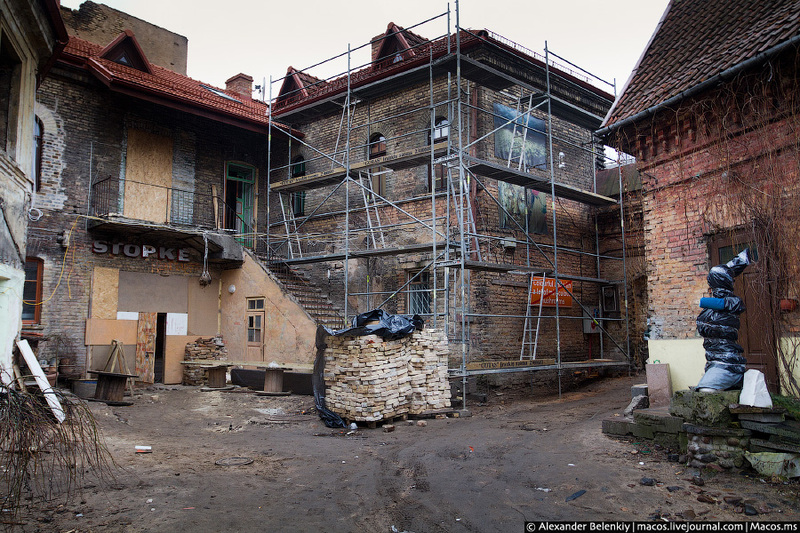 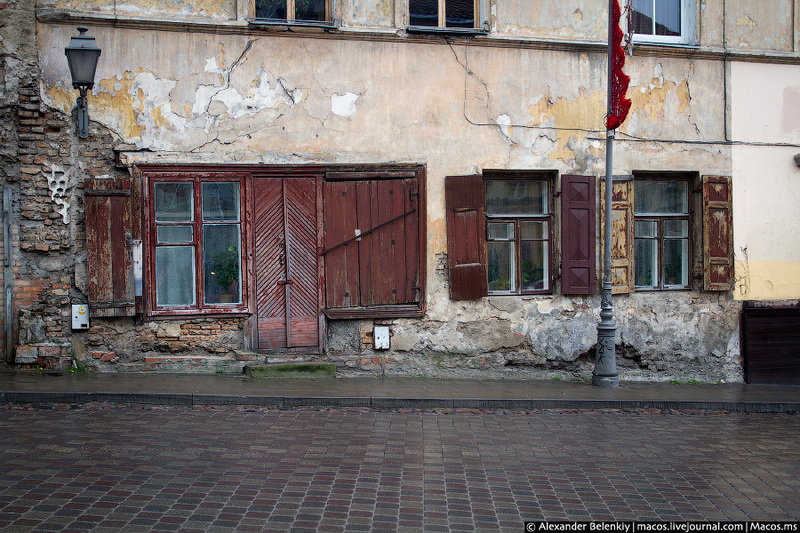 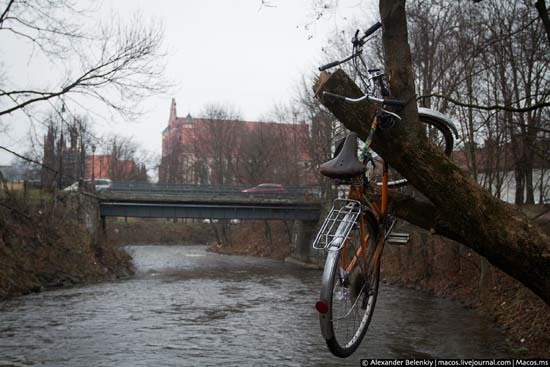 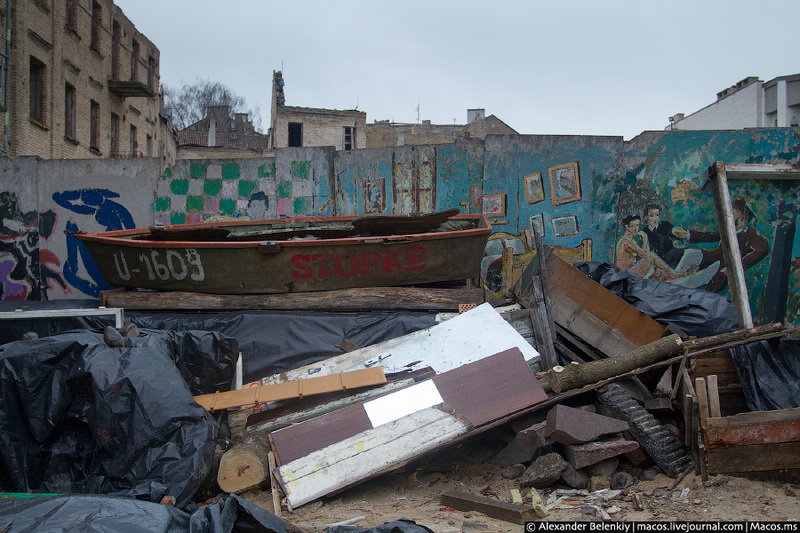 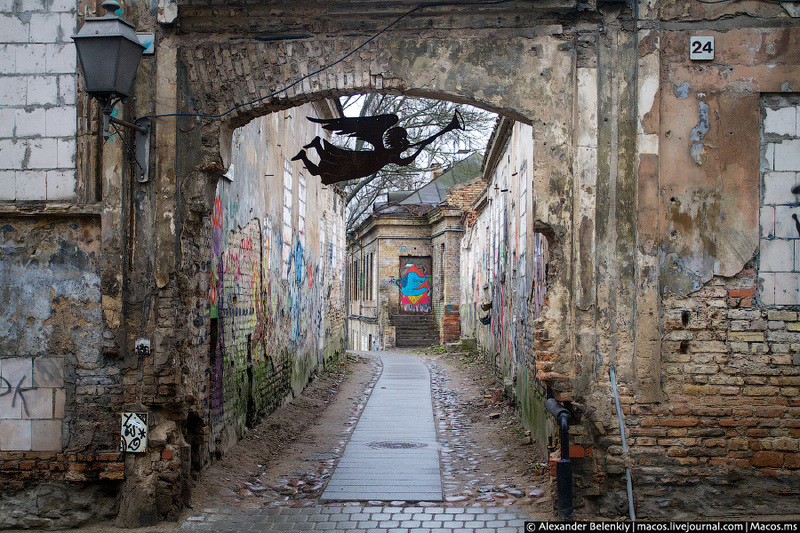 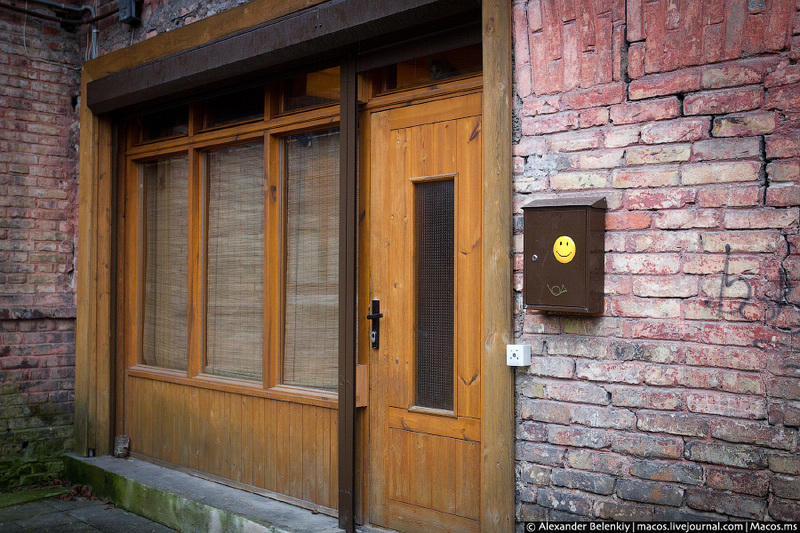 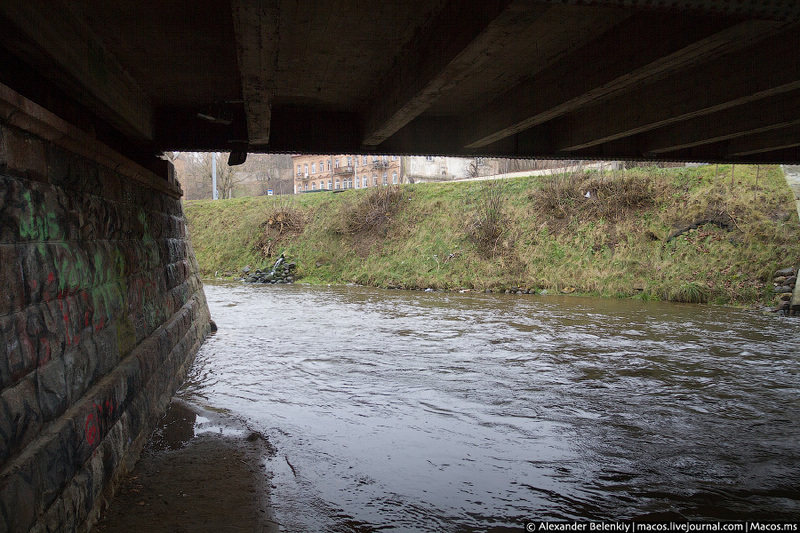 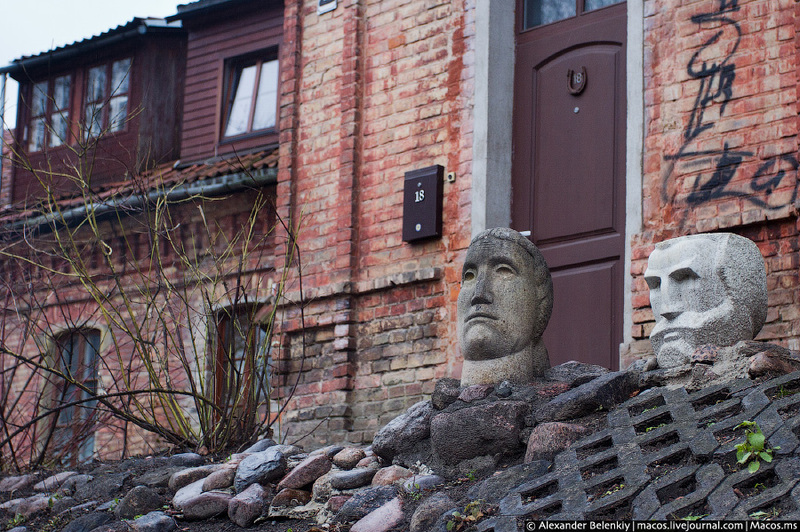 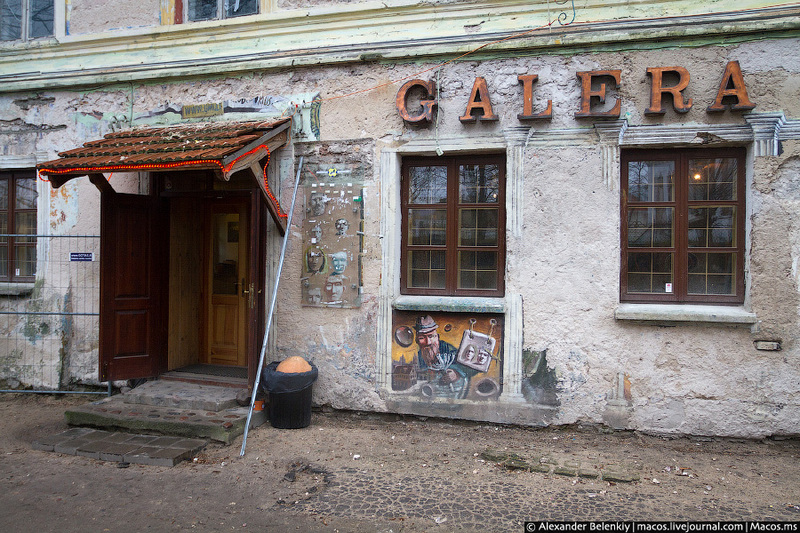 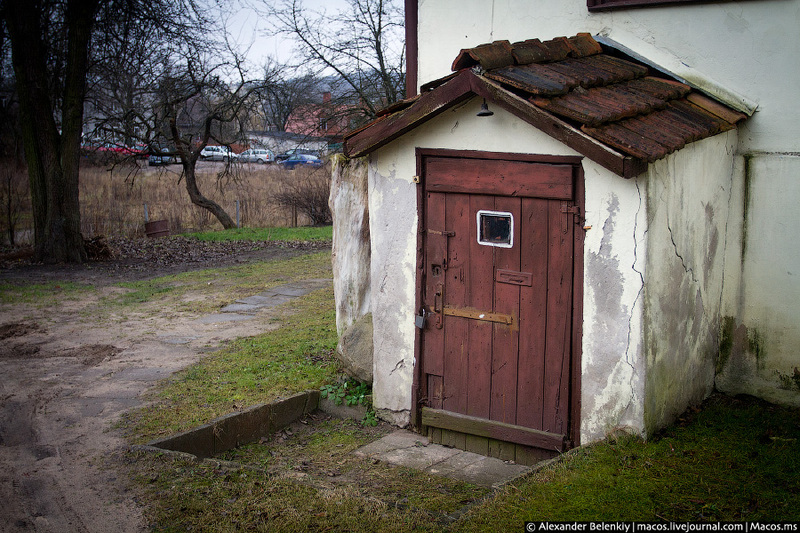 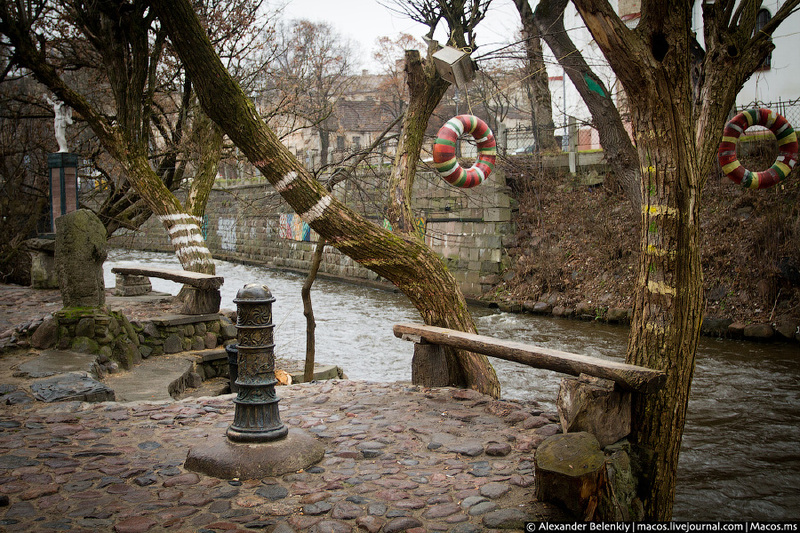 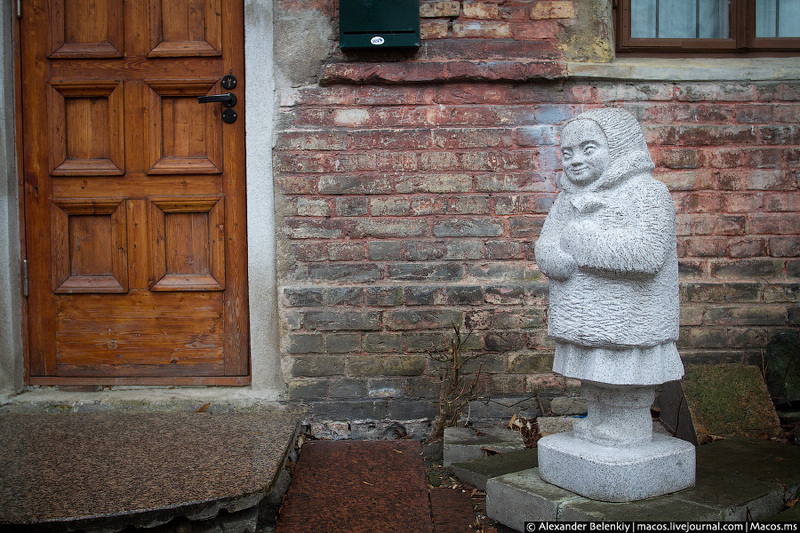 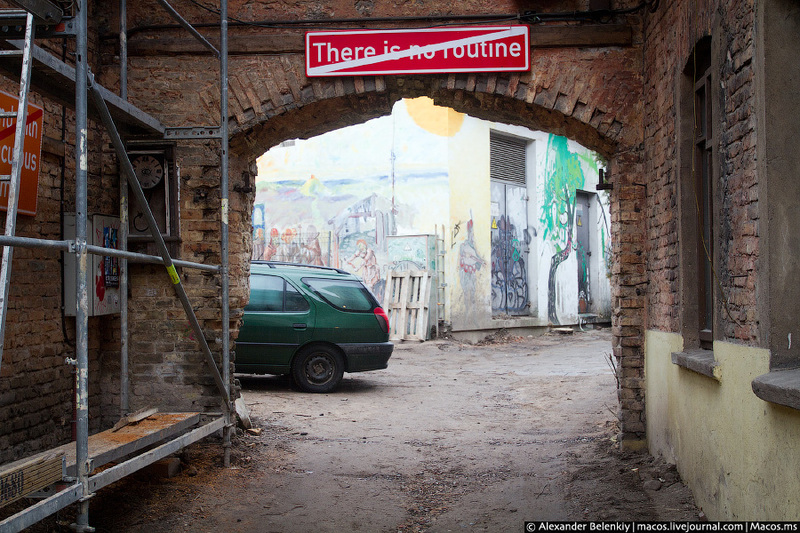 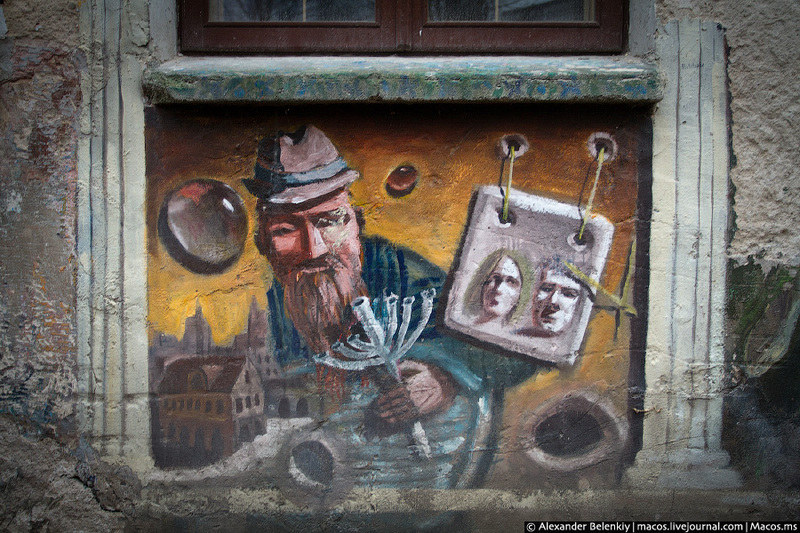 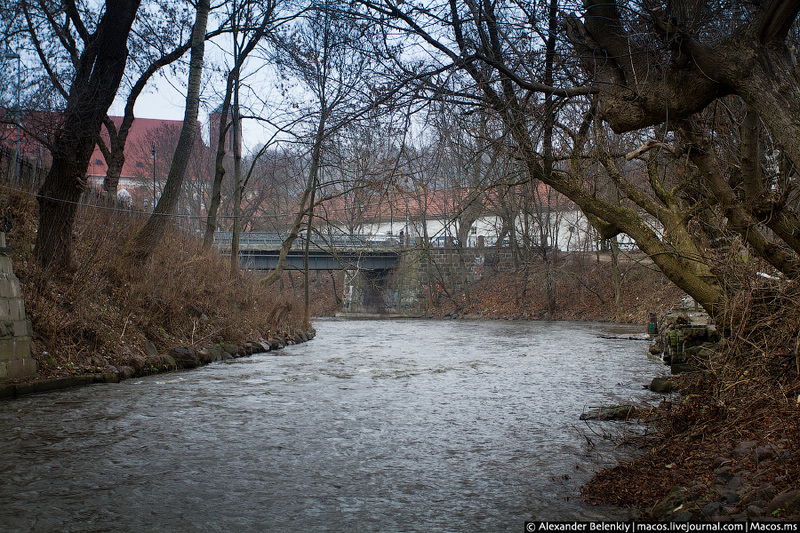 This republic lays beyond the little river of Vilnius, in the former ghetto, populated after the deportation of the Jews first by the underworld and the city’s poorest residents, and then, from the 70’s onwards, an increasing number of penniless artists. 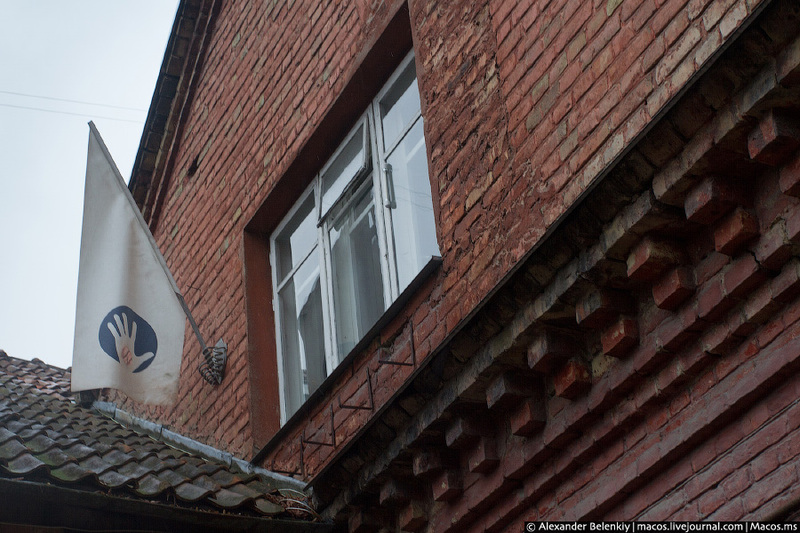 They proclaimed in 1997 the Užupis – that is, Beyond the River – Republic, which has its own president and bishop, embassy in Moscow and no less than four flags. 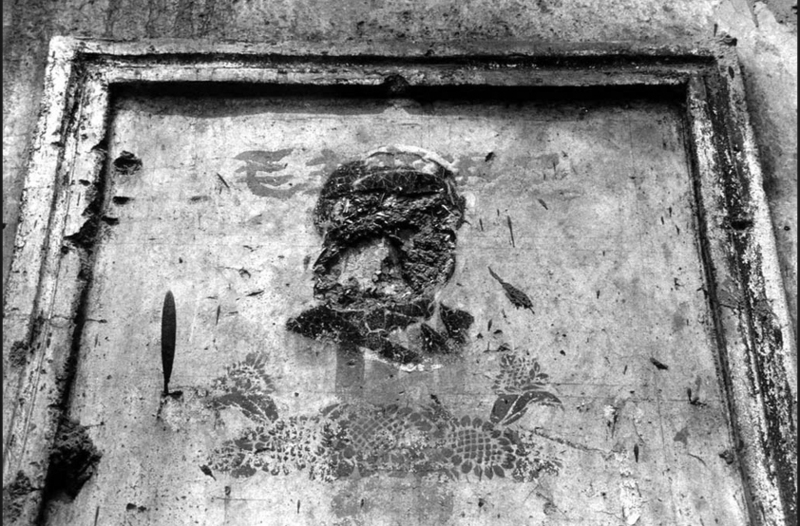 According to the founding legend of the republic, after the removal of the Lenin statues, the empty pedestal piqued the sense of beauty of the artists, and they joined forces to carve on it, in Socialist Realist style, the statue of Frank Zappa. 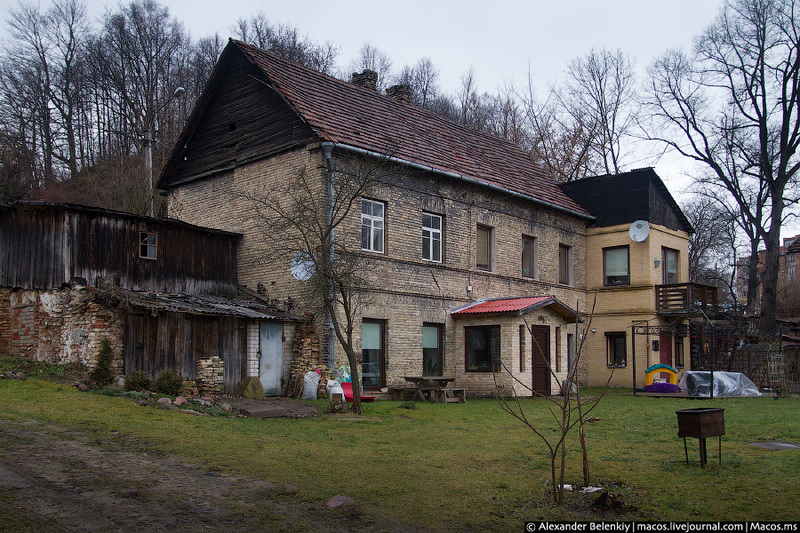 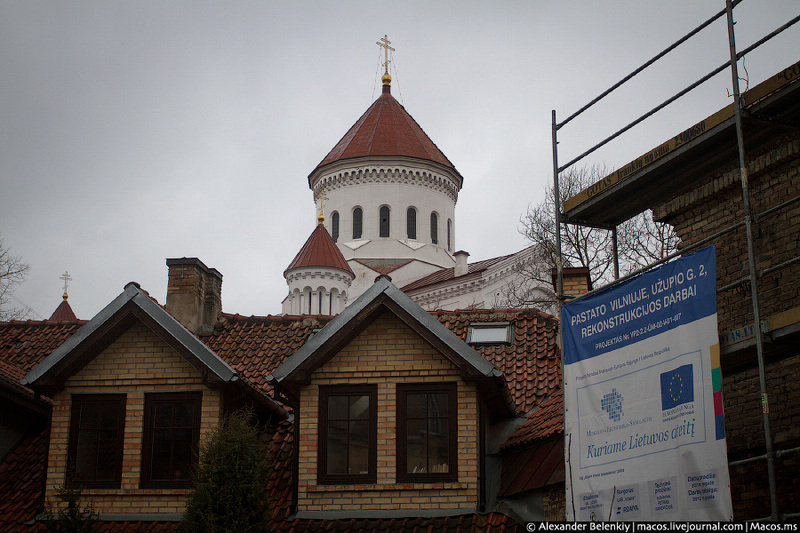 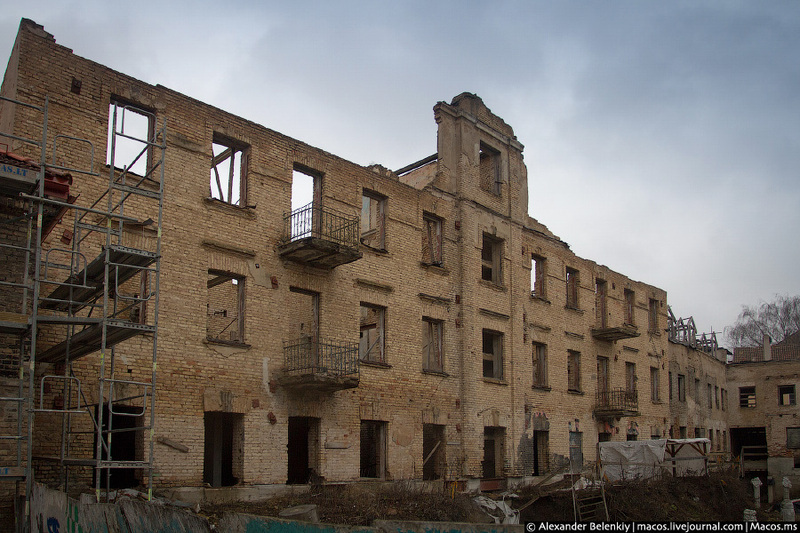 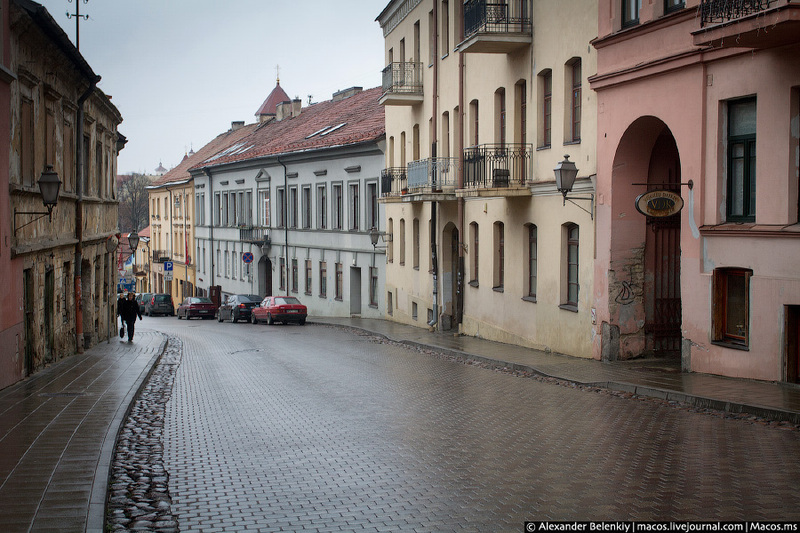 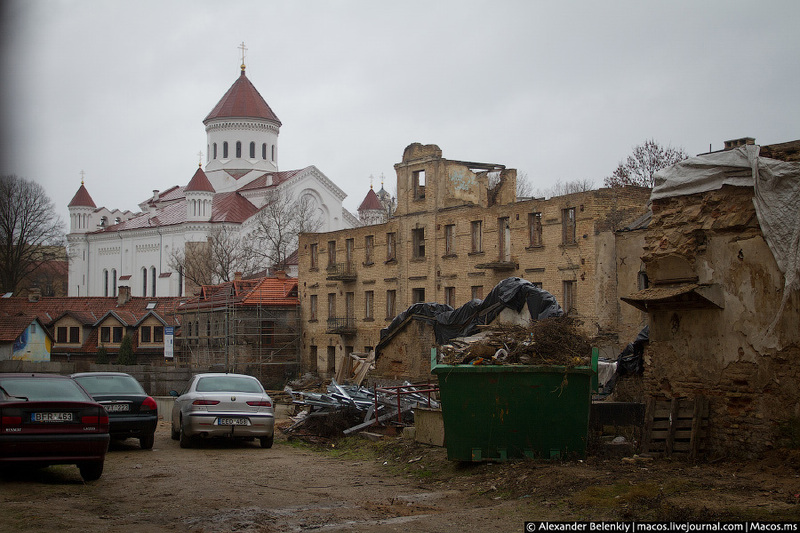 The movement filled the local community with such a consciousness that they decided: they become independent from Lithuania, which does not care about the desolate quarter, and take their destiny into their own hands. 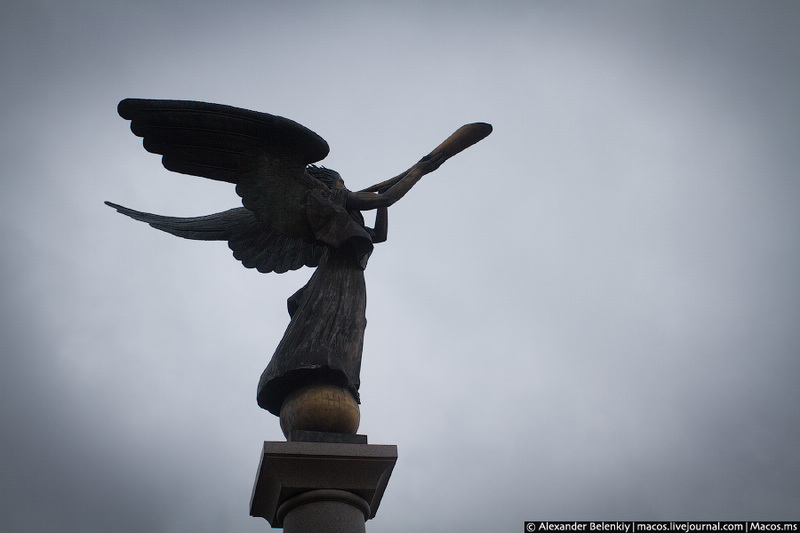 Whatever happened, the symbol of the independent state is now the angel statue erected on its main street in 2002. 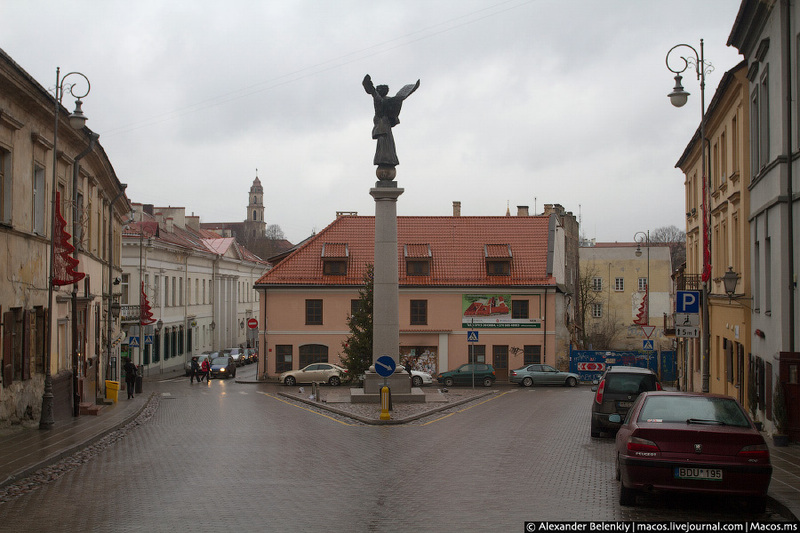 It is this symbol which gave the new official name of the new state: The Angel’s Republic, announces proudly the visa, stamped in the visitors’ passport in the pub standing at the Užupis bridgehead of the border river.